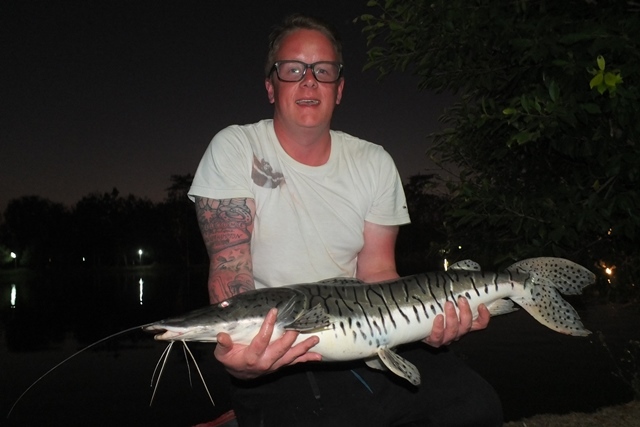 Niall Hulme managed to join not one but three of the Palm Tree Lagoon big fish clubs during his visit. 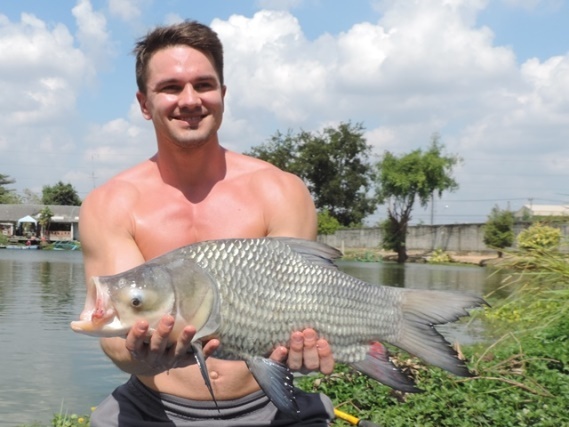 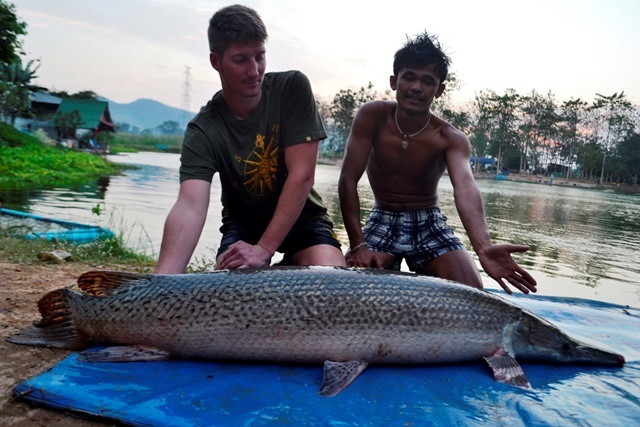 His first achievement was joining the 150lb Chao Phraya club, this was followed by the 300lb Catfish Club and finished off with a 465lb arapiama which put him into the 400lb Arapaima Club as well. 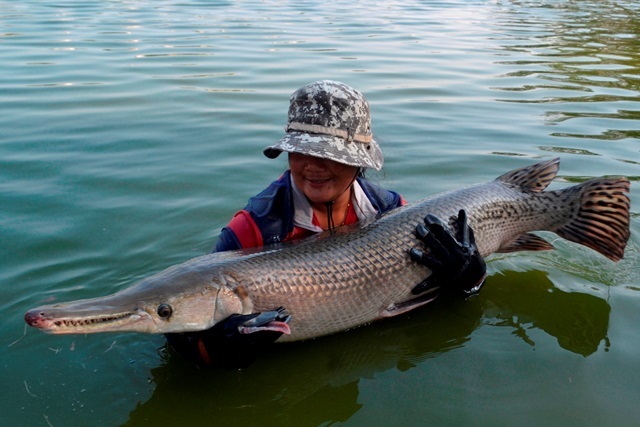 Another goal on his wish list was to catch a big alligator gar which he did by catching a total of five during his session. 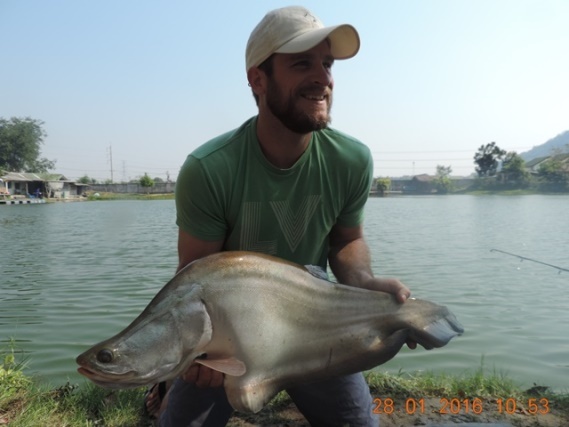 Along with these awesome catches he also caught a number of other superb fish that included black ear catfish, big-Y catfish, mollycot, striped catfish, wallago attu, soldier river barb, rohu, giant featherback, catfish shark, plus a numerous amount of both Asian and Amazon redtails. 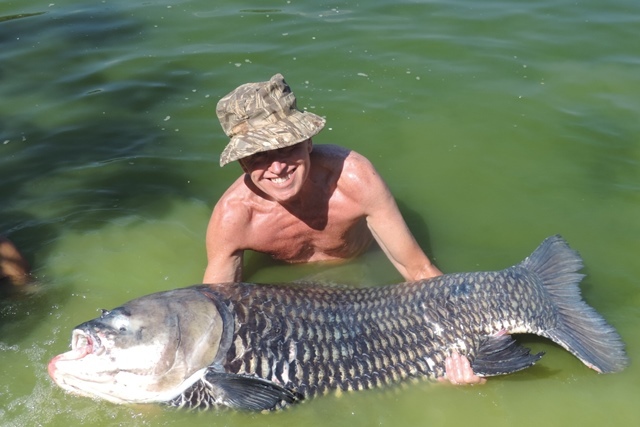 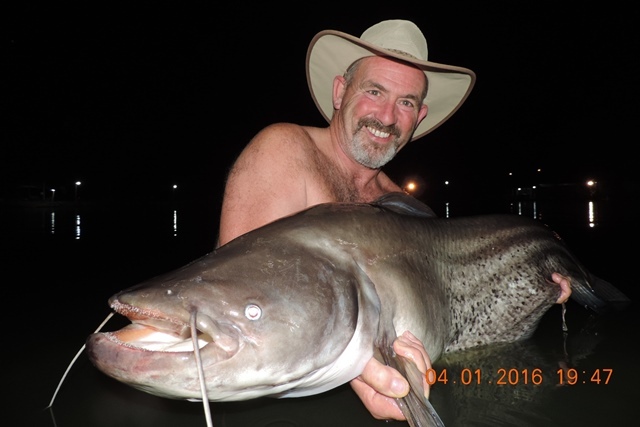 Colin Bunn of Catmaster Tours was yet another member to attain the Palm Tree Lagoon 300lb Catfish Club status during the month. 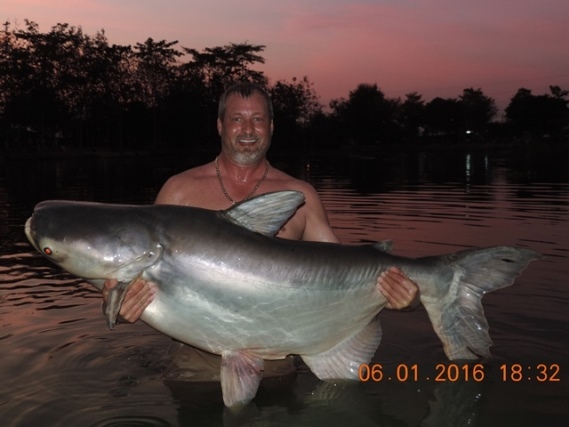 In addition to this he caught a number of other awesome catches like a huge alligator gar and a couple of difficult to catch wallago leeri. 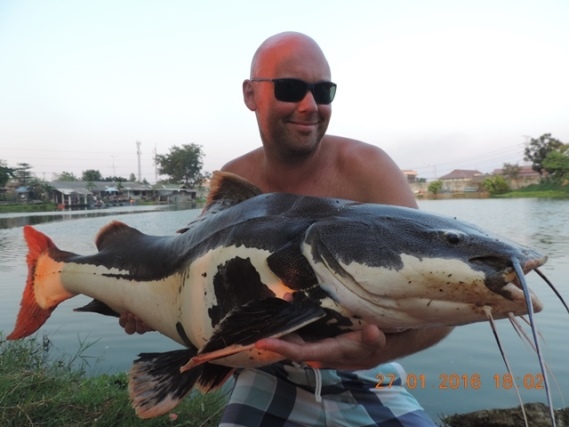 He also caught a huge number of other great species sach as striped catfish, big-Y catfish, catfish shark, leopard catfish, Siamese carp, mrigal, black shark minnow, rohu, pacu, wallago attu, chao phraya, tiger catfish, as well as numerous Thai and A,mazon redtails. 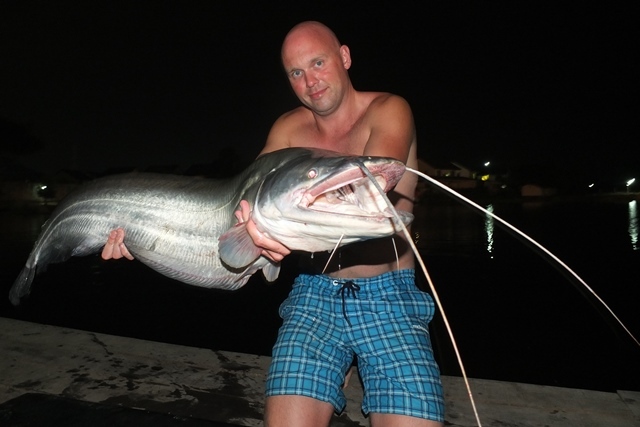 Stefan Dooms was back for his annual fishing visit to Palm Tree. 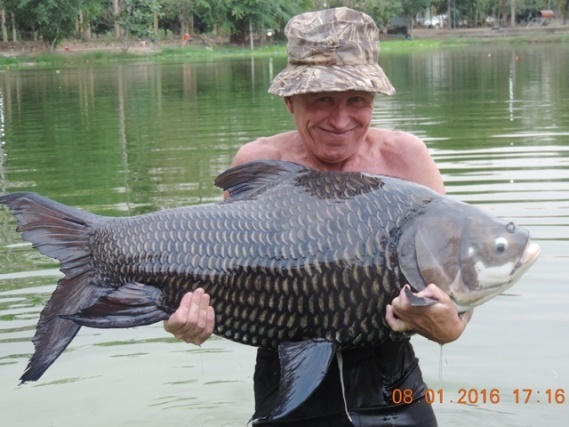 He continued Palm Tree's good wallago leeri run this month catching an awesome fish which was also a new species for him.In additional he caught a 100lb+ Siamese carp as well as a huge Amazon redtail. 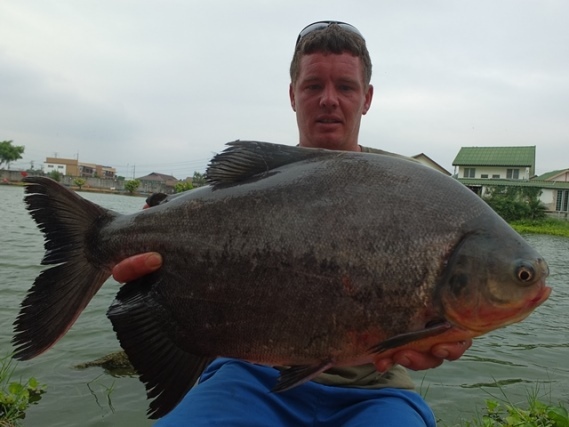 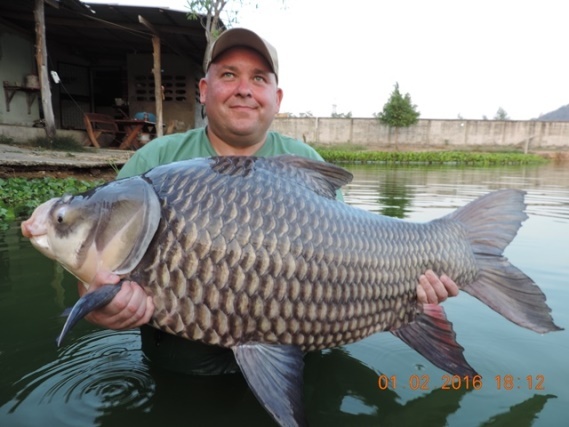 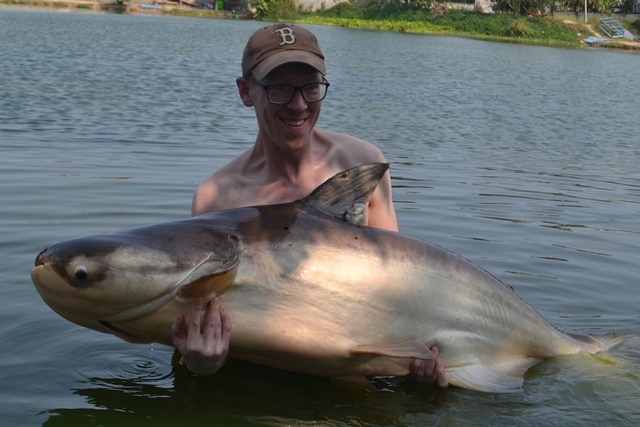 He then added to this with a number of other great catches that included more Siamese carp, Mekong catfish, and an Amazon redtail + Chao Phraya double header. 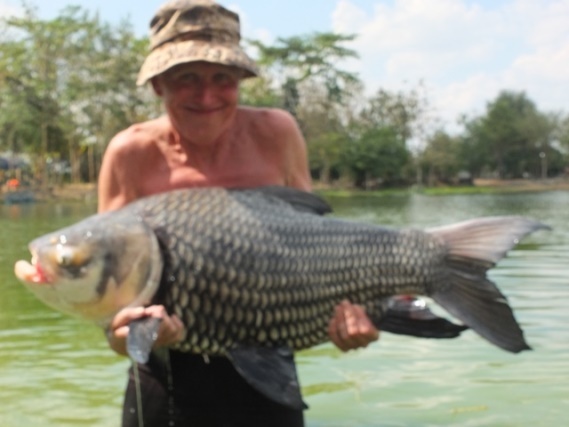 Nick Peat was another angler to return less than six months after his last visit to continue his quest to join the Palm Tree Lagoon 150lb Carp Club. 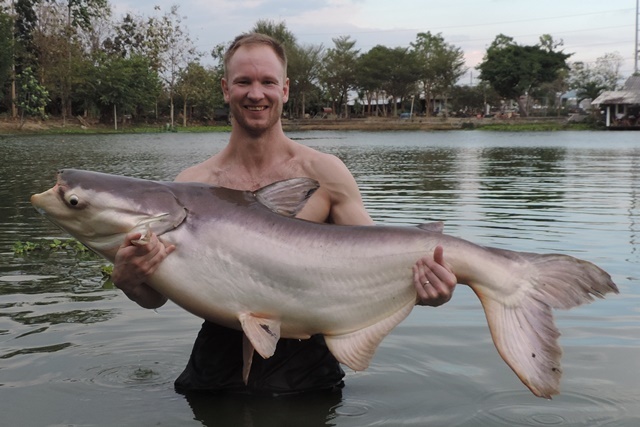 Not only was he successful in this, he also make a number of other superb catches that included a more than awesome Salween rita, tambaqui, Juliens golden price carp, rohu, soldier river barb, leopard catfish, yellow catfish, Mekong catfish, big-Y catfish, chao phraya, striped catfish, and numerous Thai and Amazon redtails. 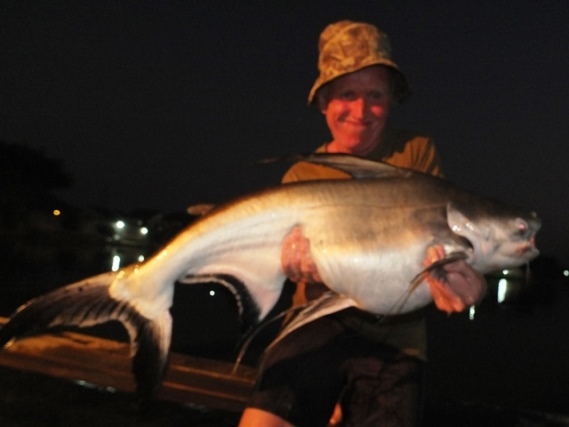 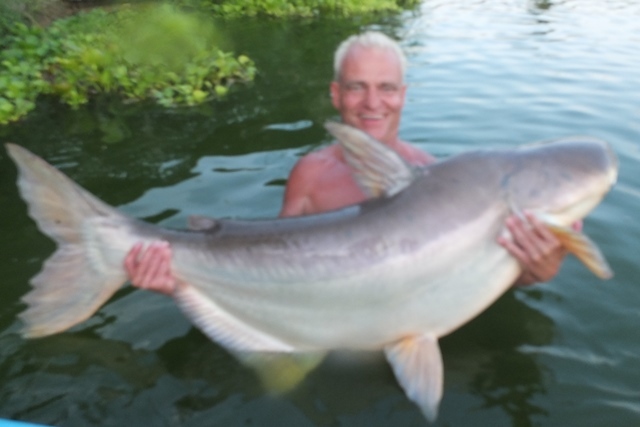 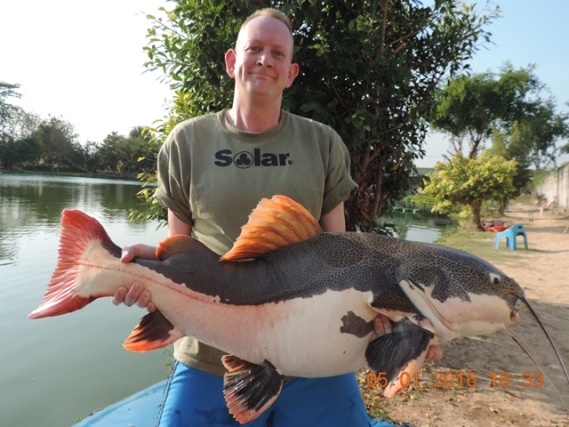 Marc Ulliott was yet another angler to join the Palm Tree 300lb Catfish Club during the month. 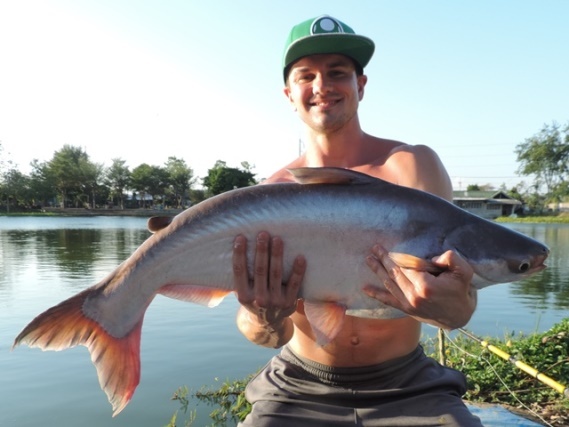 He was off to a good start on the first day with a very rare Salween catfish, in addition to this he had a number of other great catch such as an awesome alligator gar, pacu, chao phraya, big-Y catfish, catfish shark, striped catfish, Siamese carp as well as a number of both Amazon and Asian redtails. 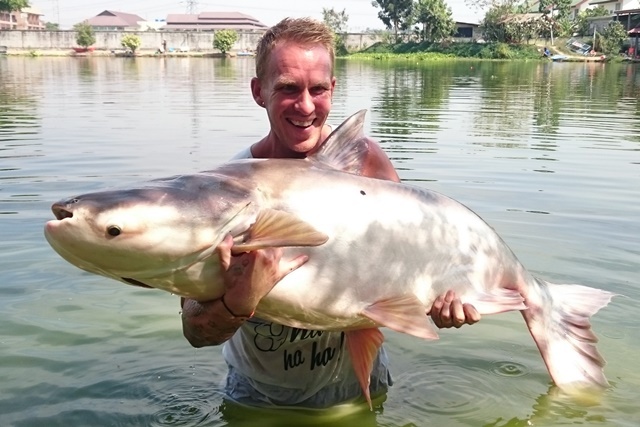 Andrew Harman returned still chasing a 300lb+ catfish as he already has the Carp, Arapaima and Chao Phraya Palm Tree Club t-shirts. 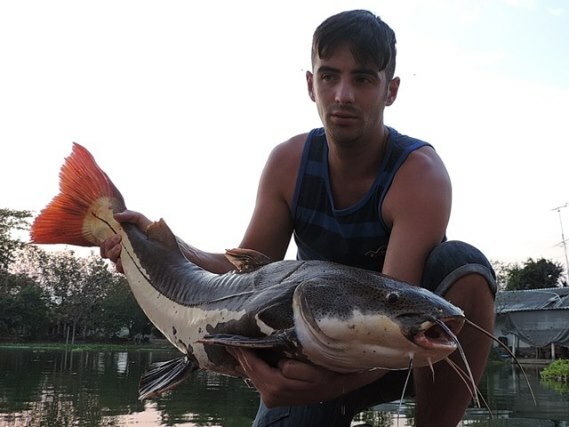 Although the giant cat still eluded him he did catch several of the elusive wallago leeri as well as Siamese carp and striped catfish. 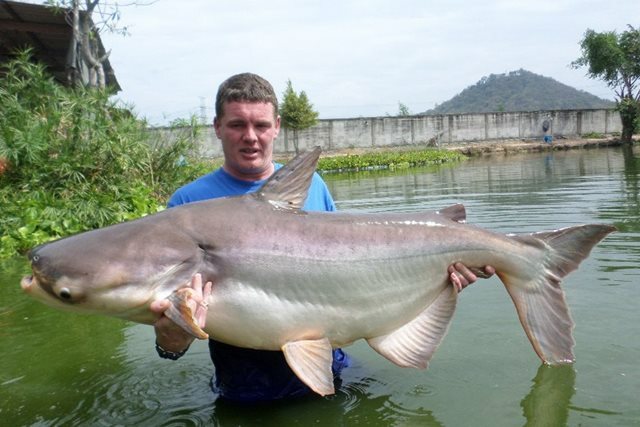 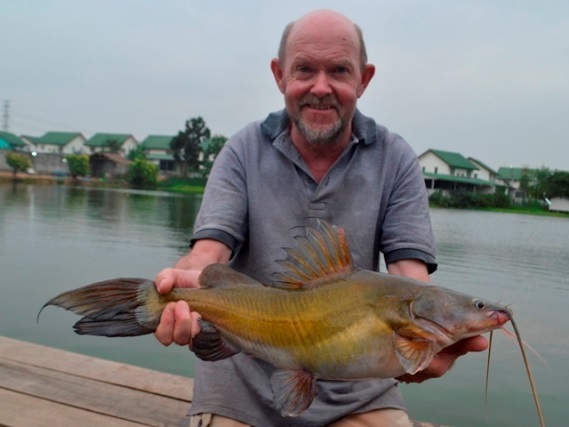 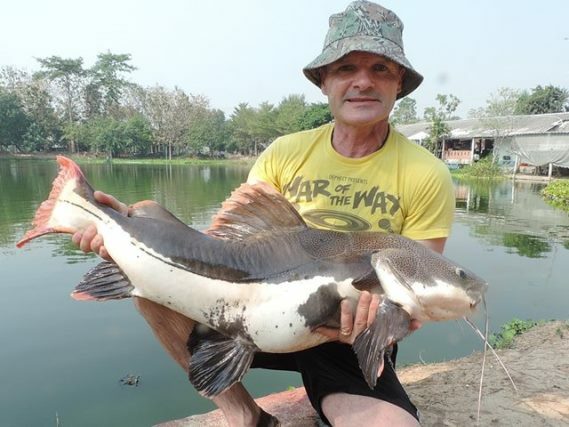 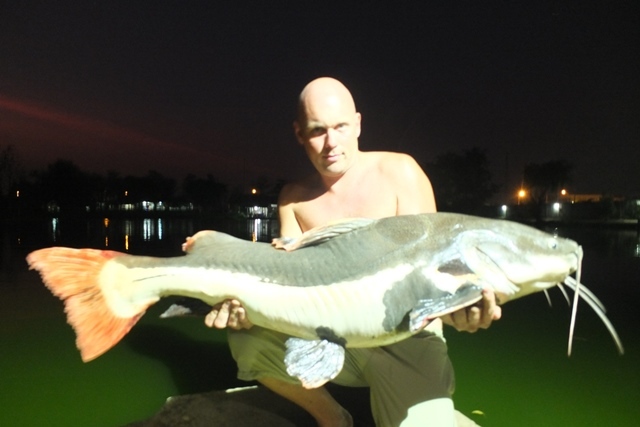 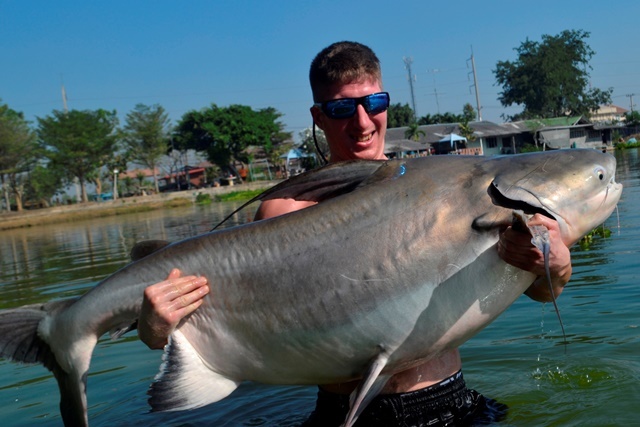 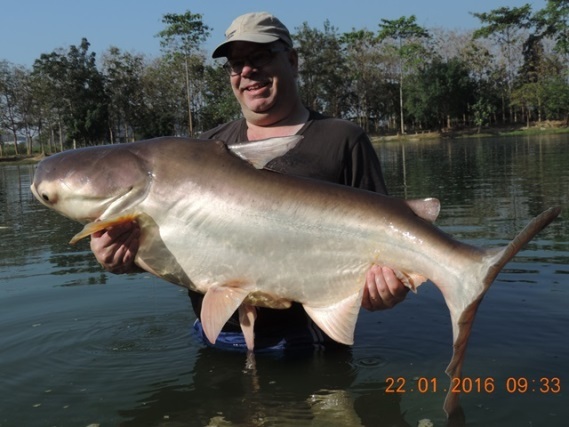 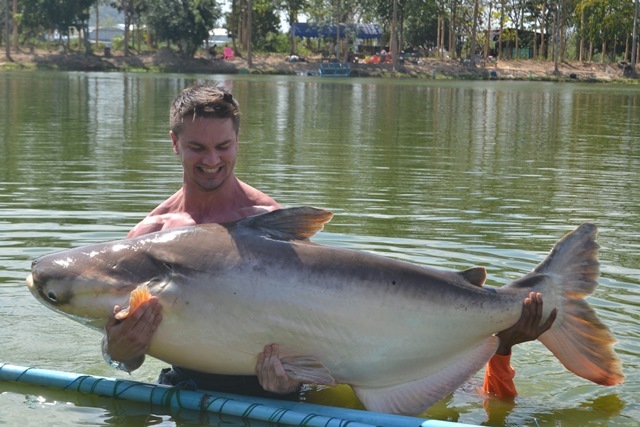 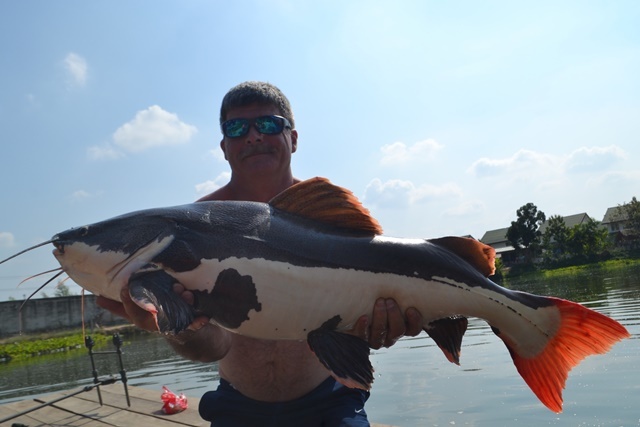 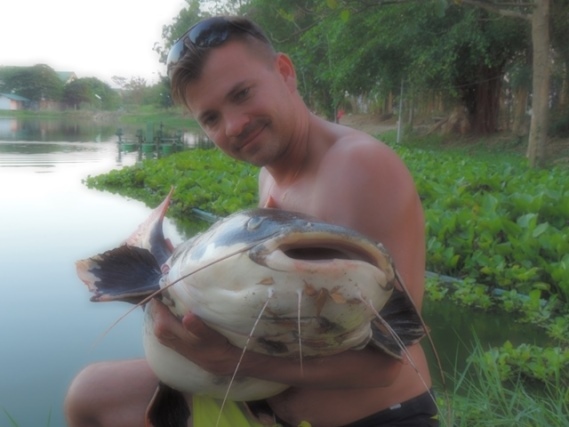 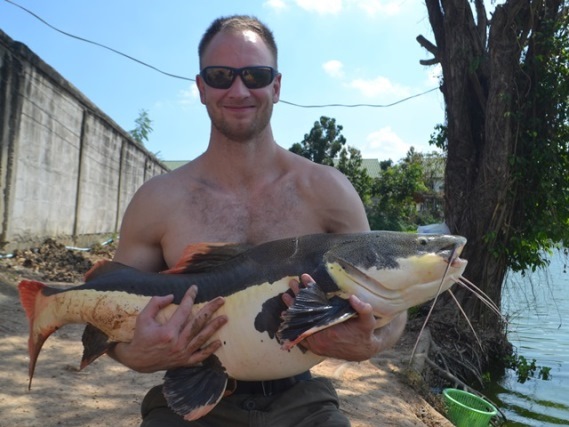 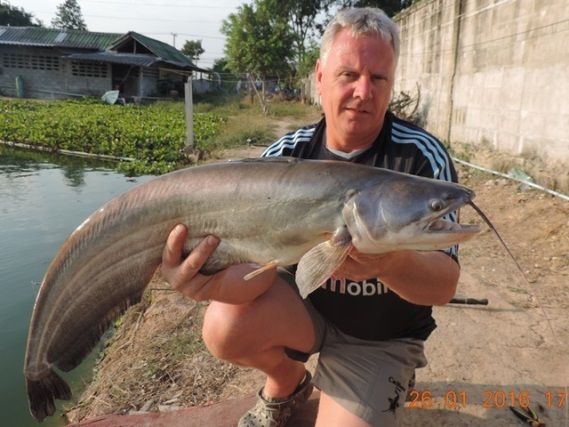 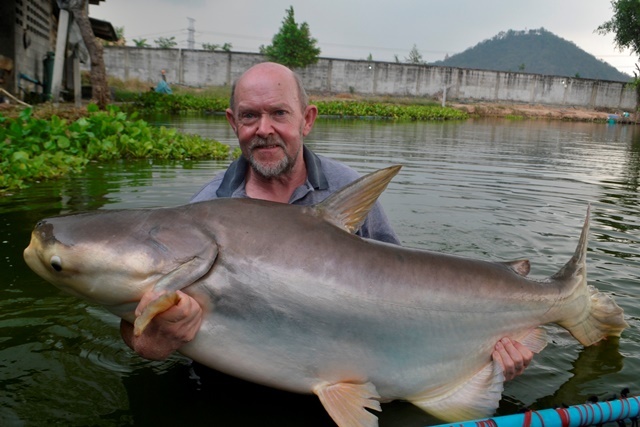 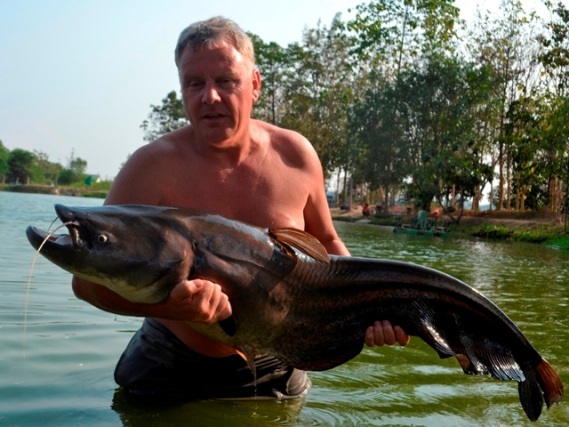 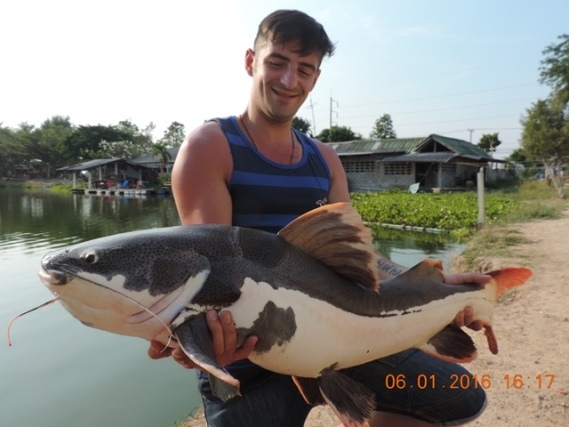 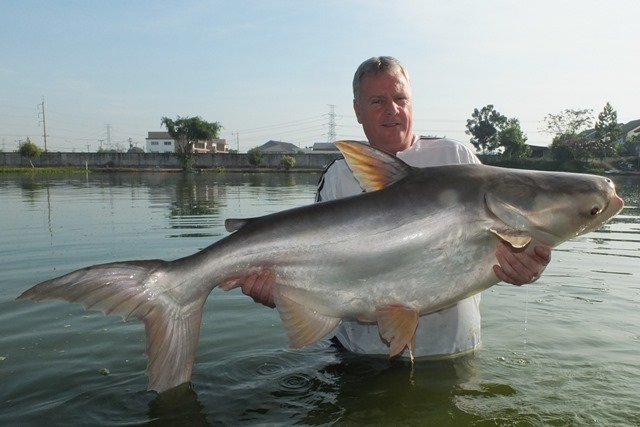 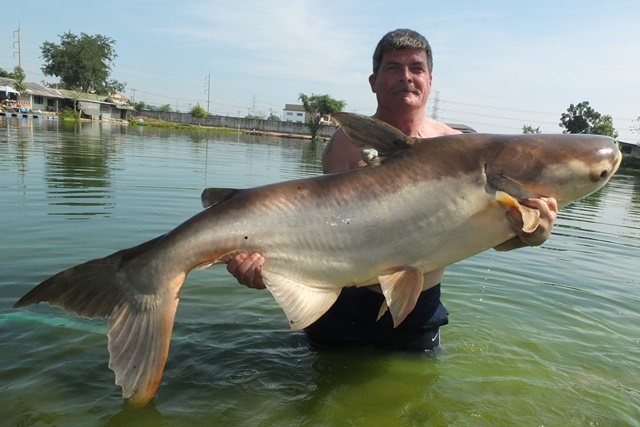 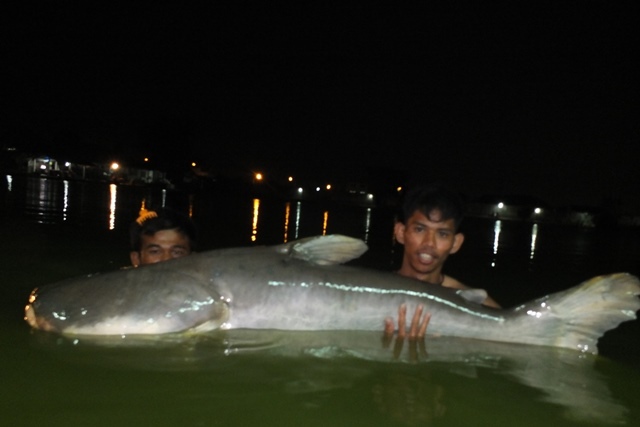 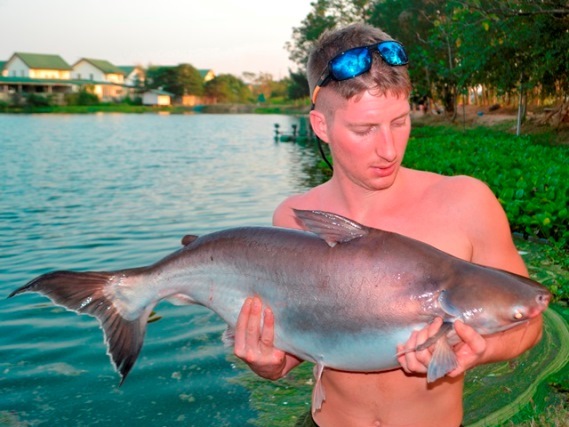 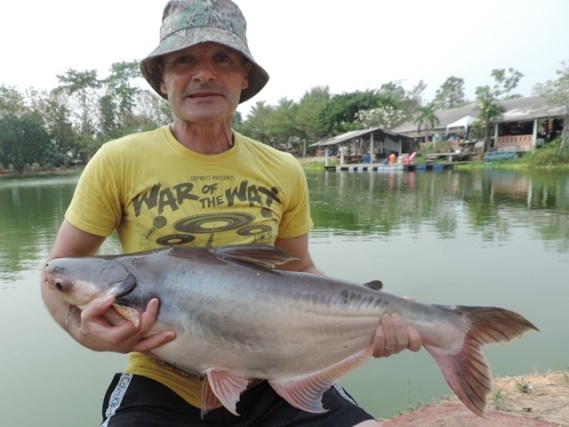 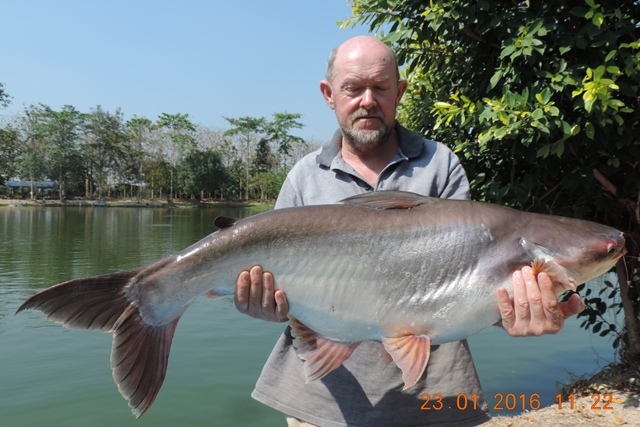 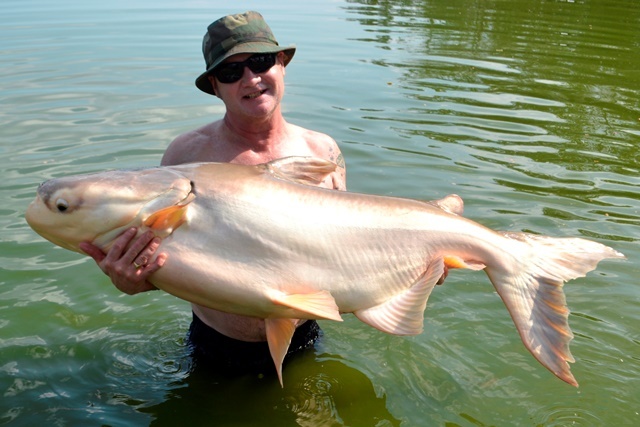 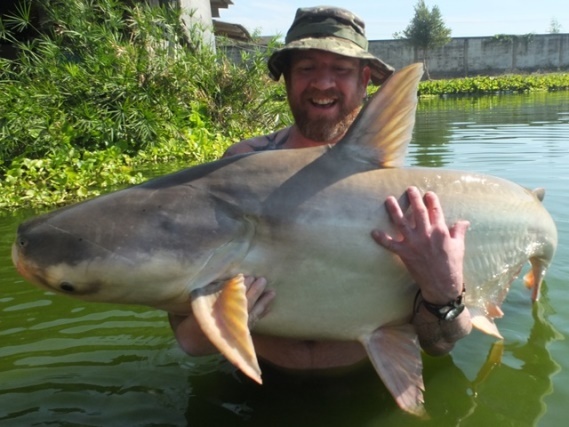 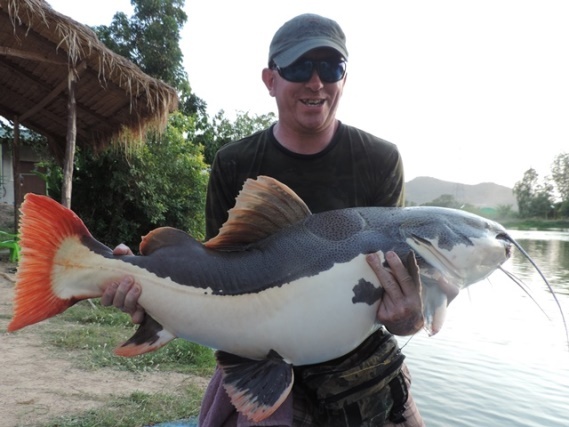 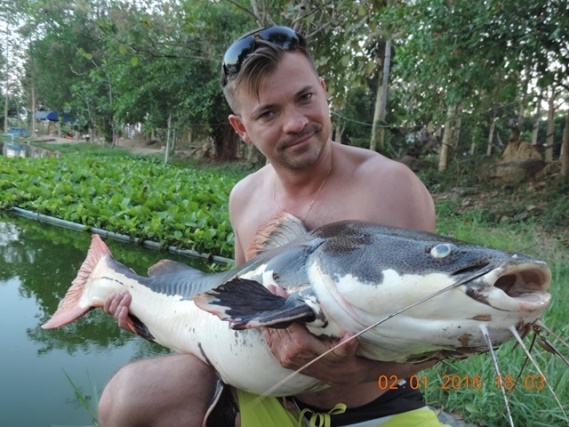 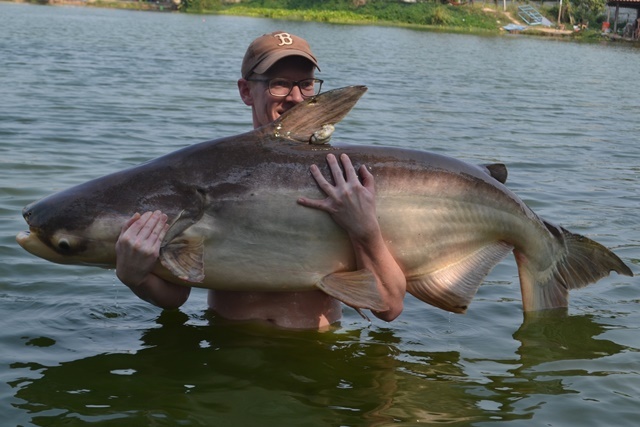 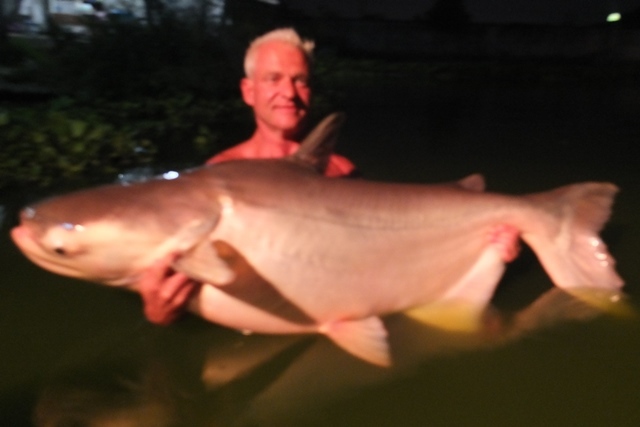 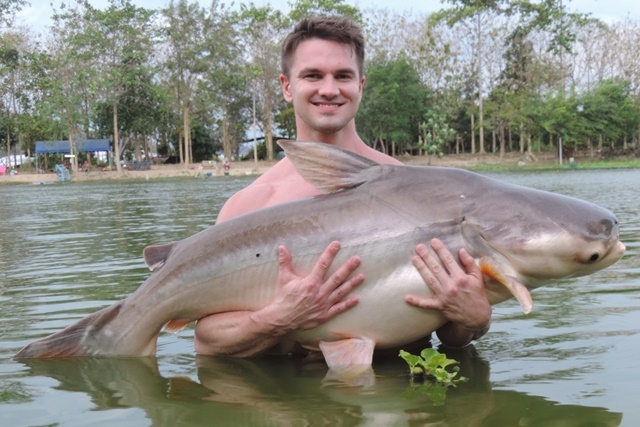 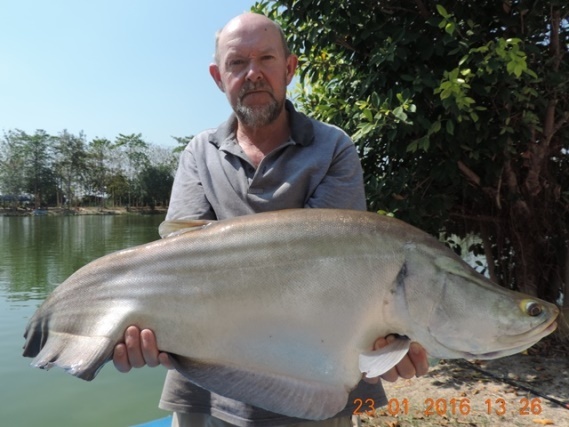 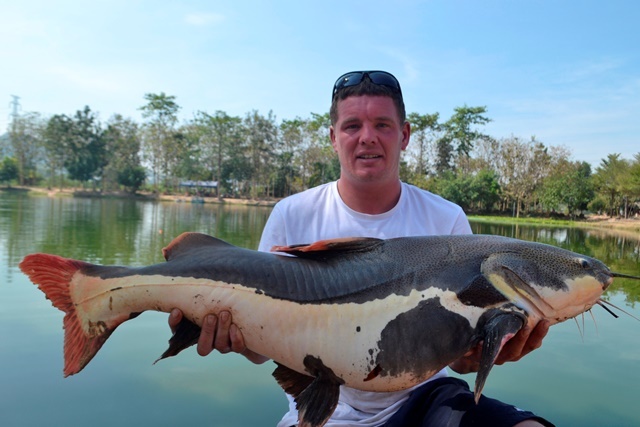 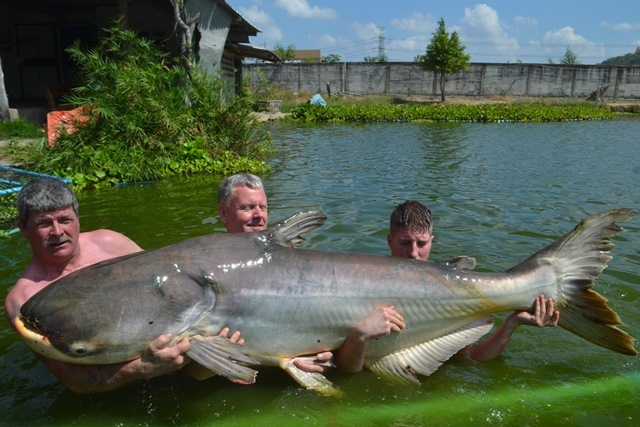 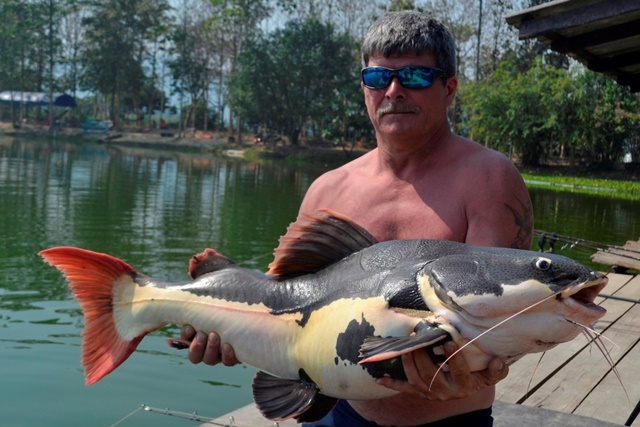 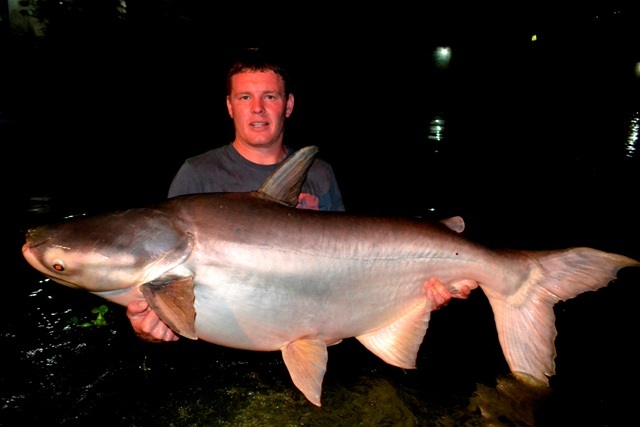 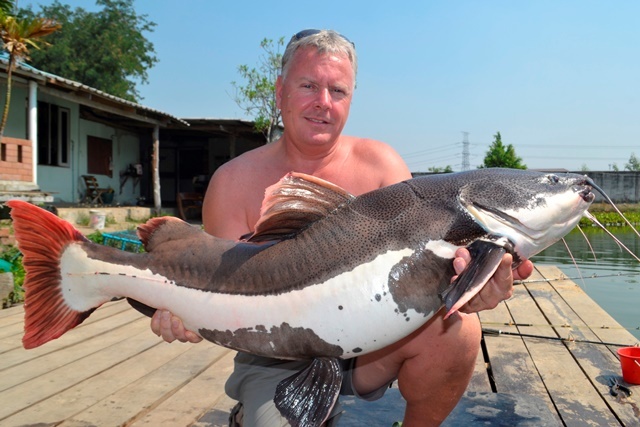 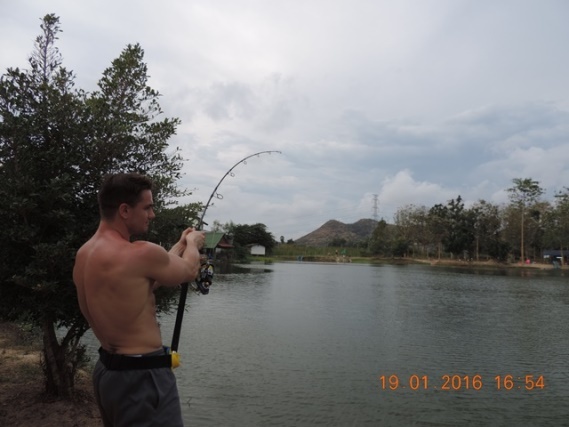 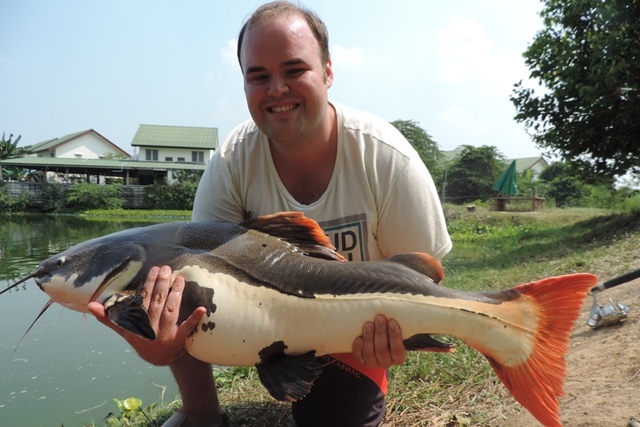 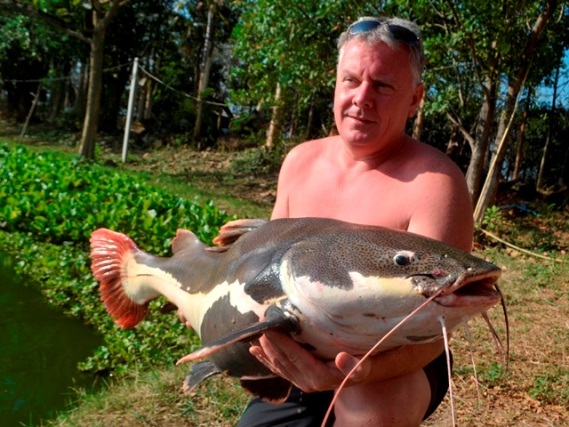 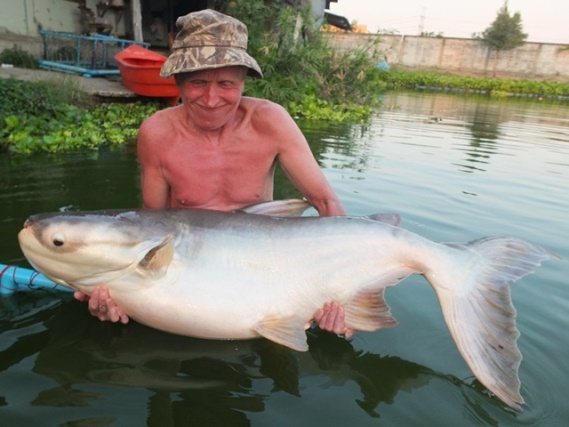 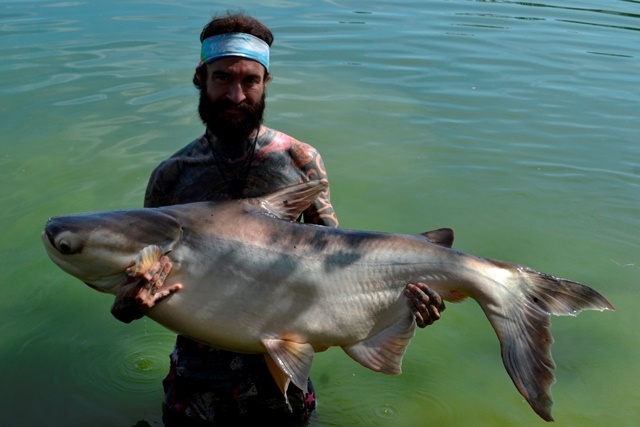 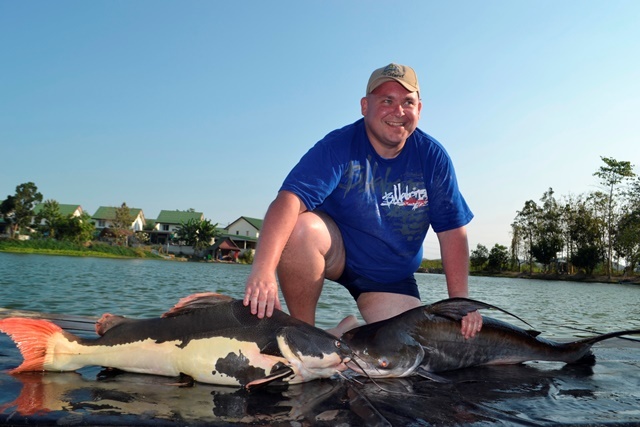 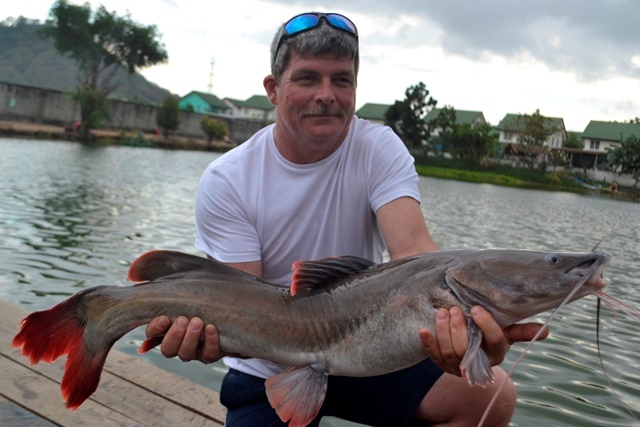 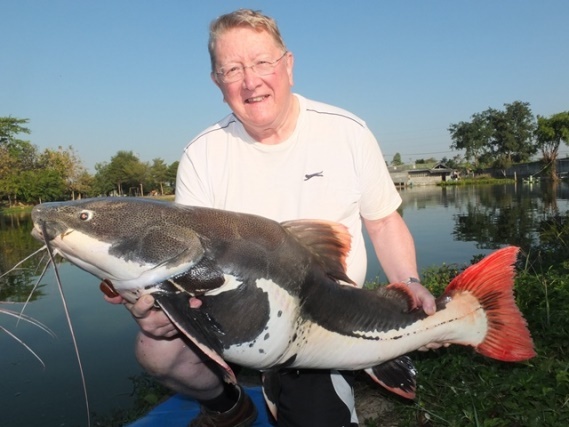 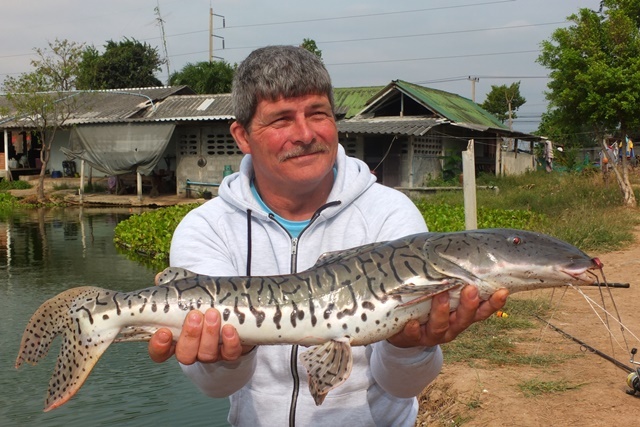 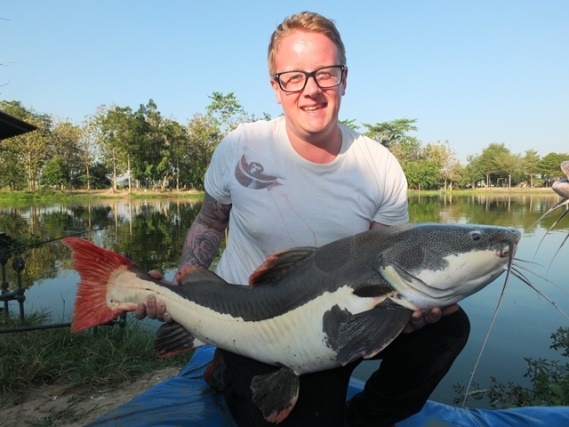 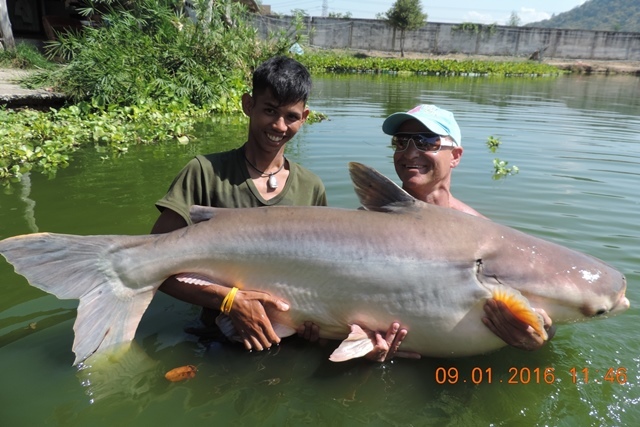 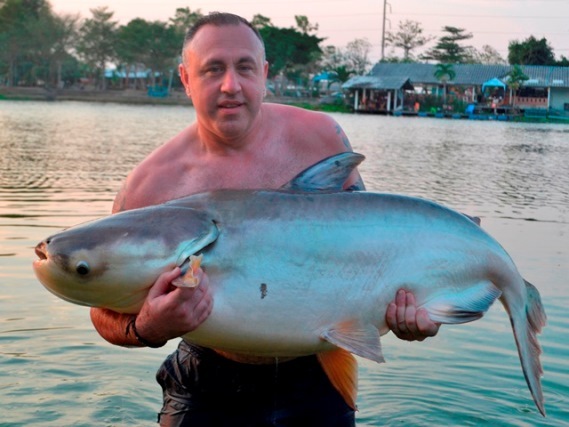 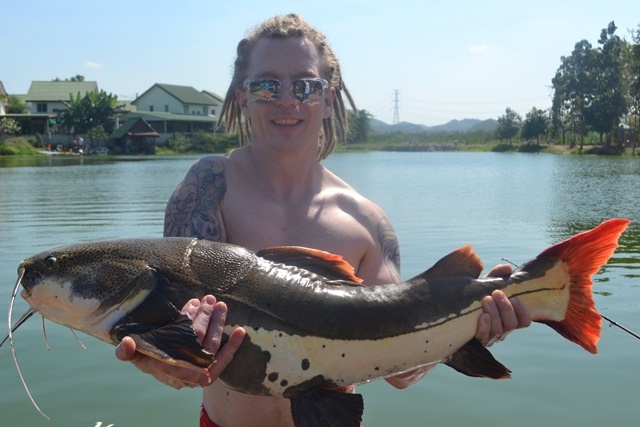 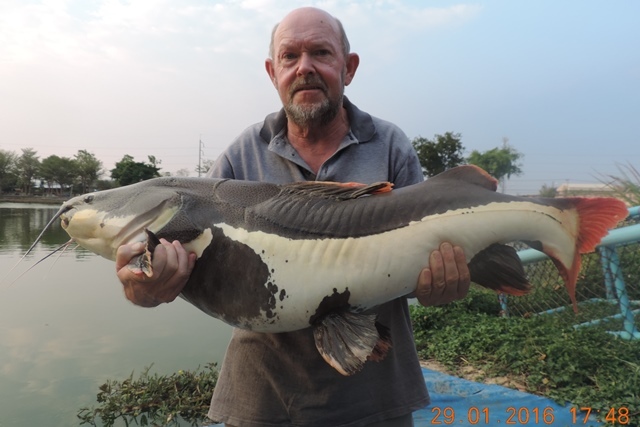 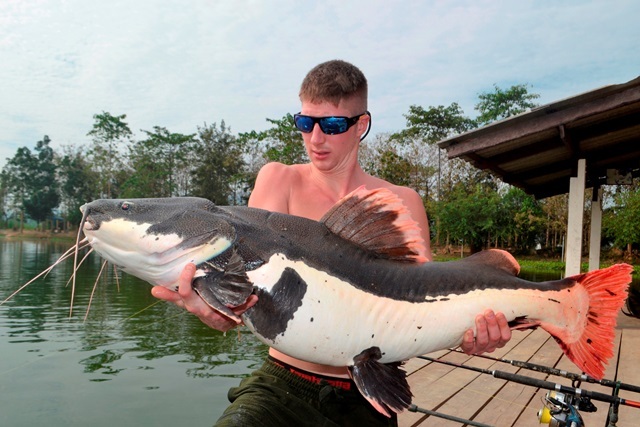 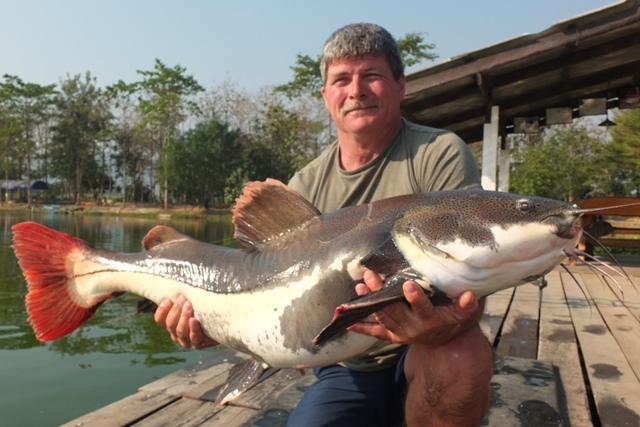 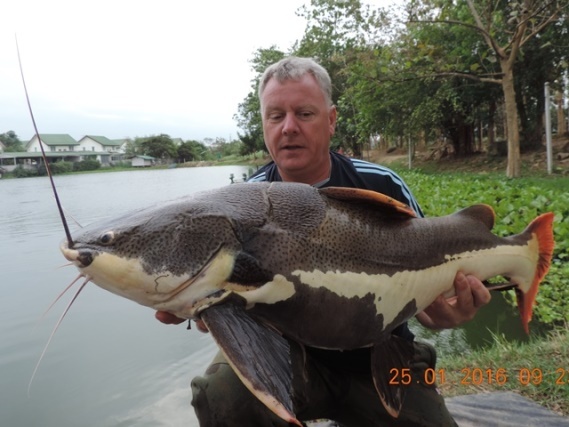 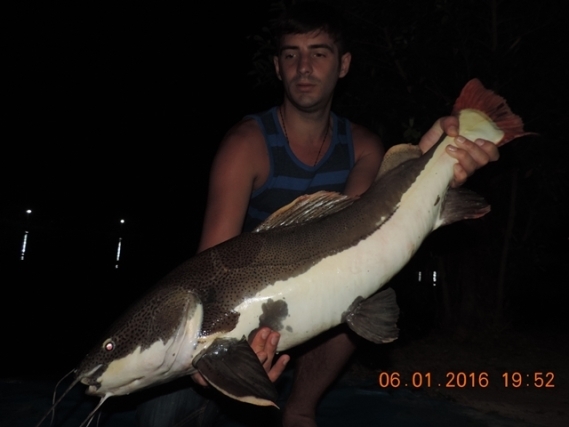 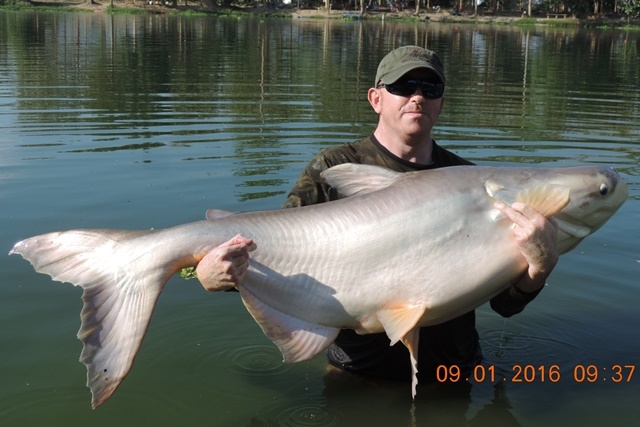 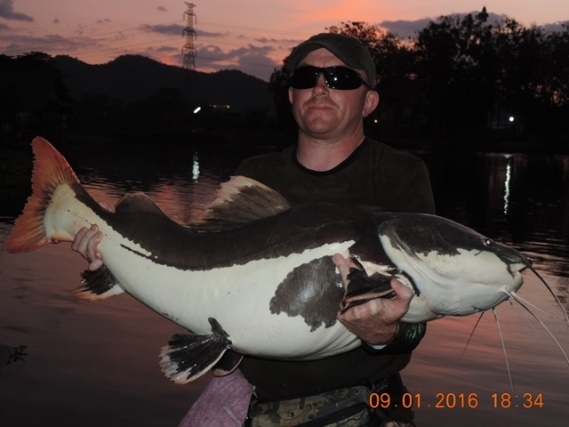 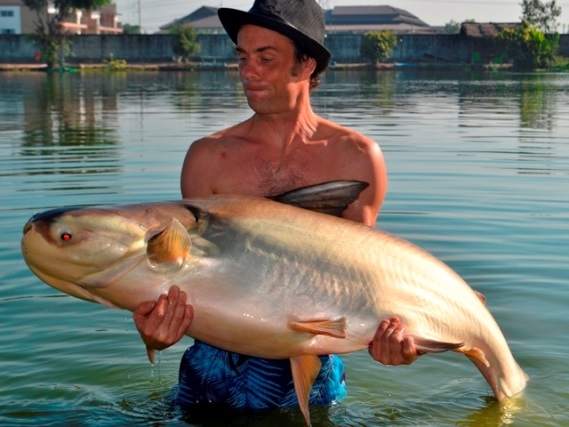 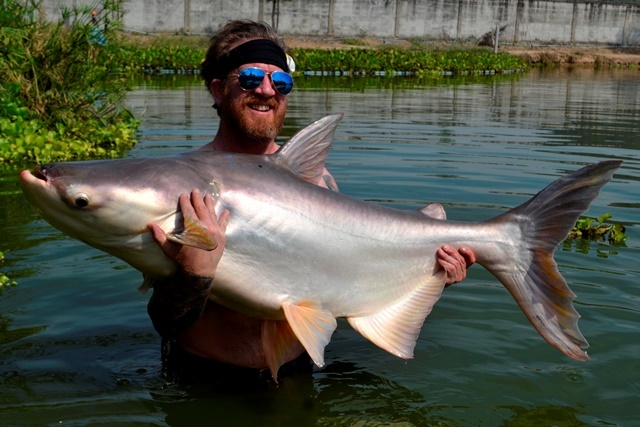 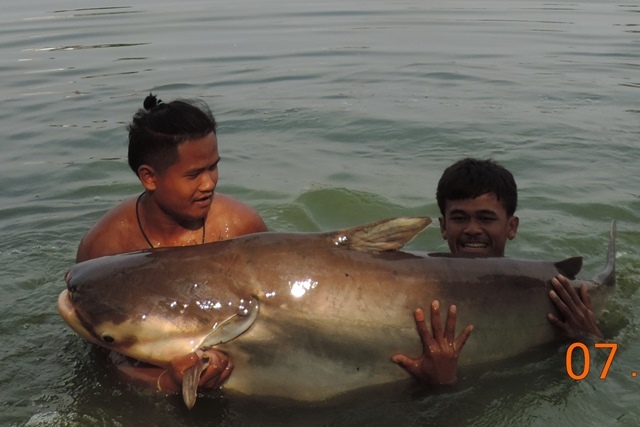 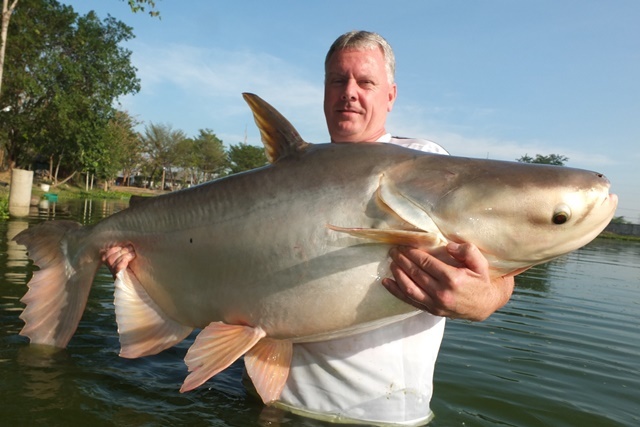 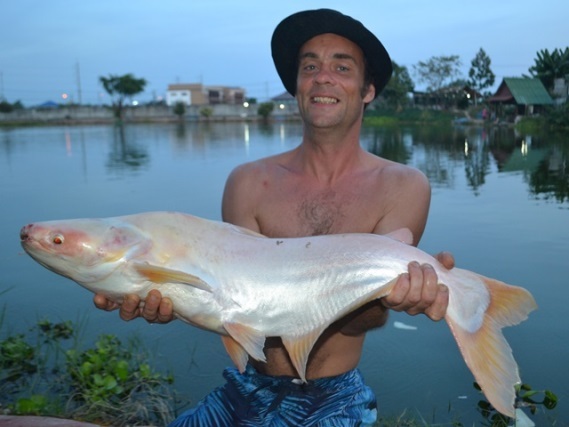 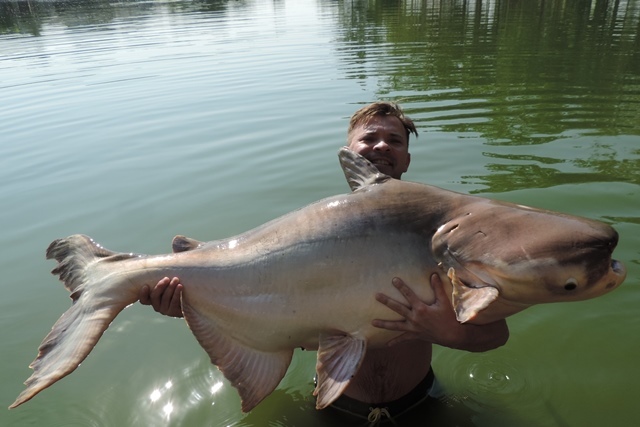 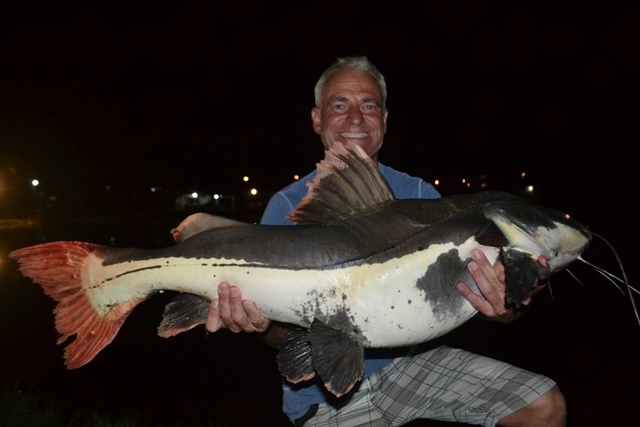 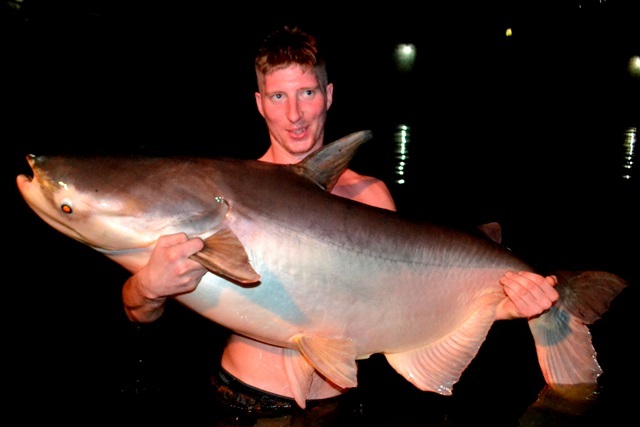 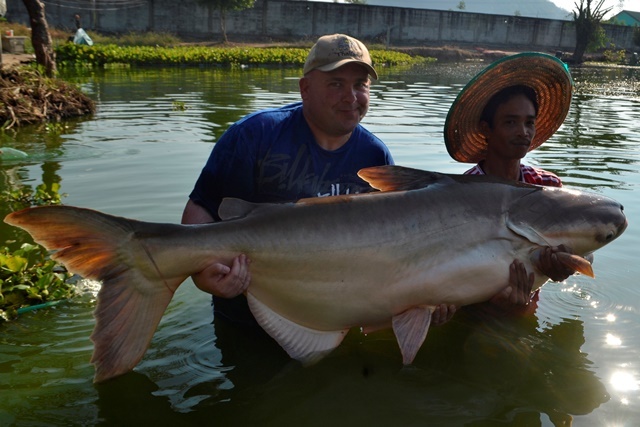 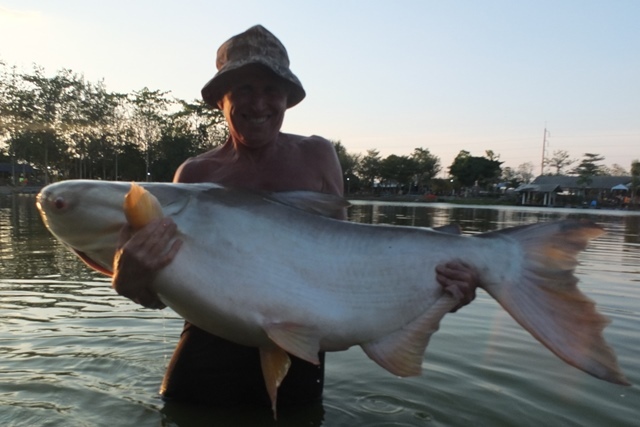 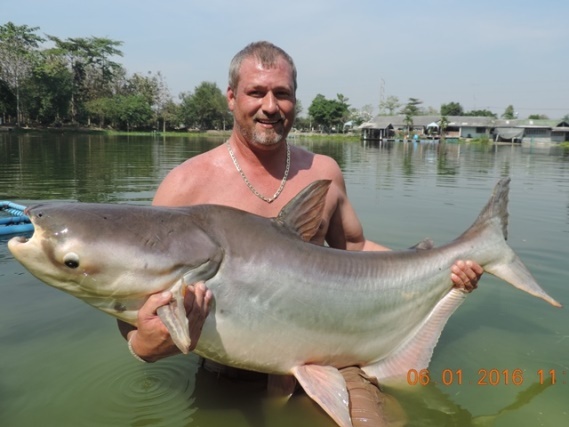 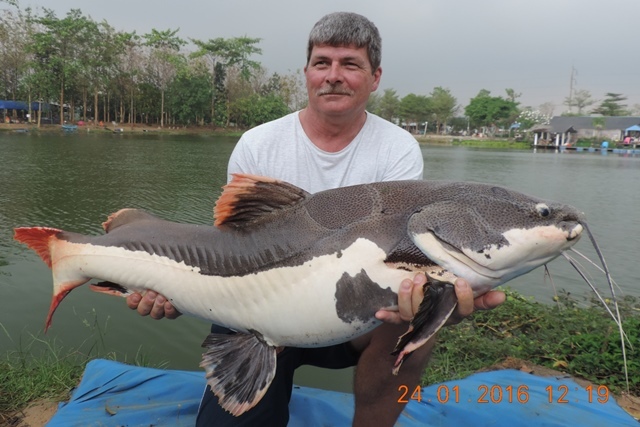 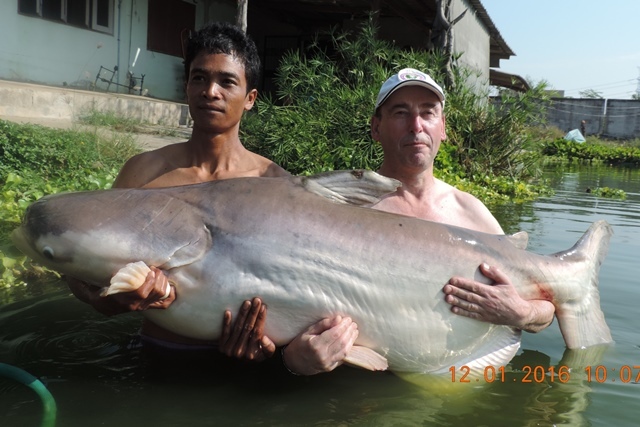 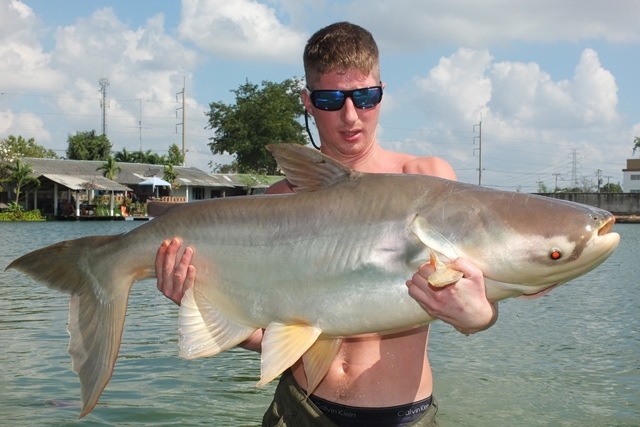 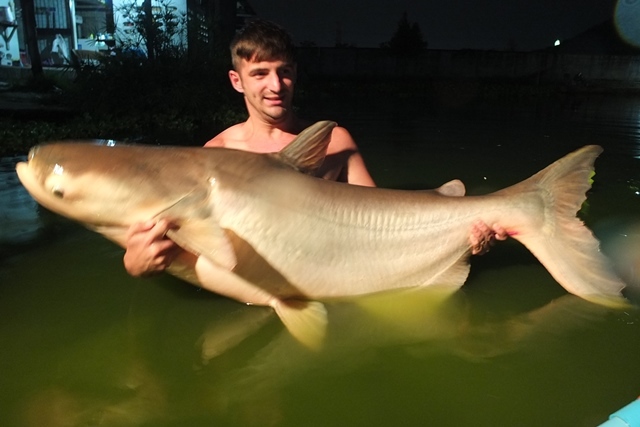 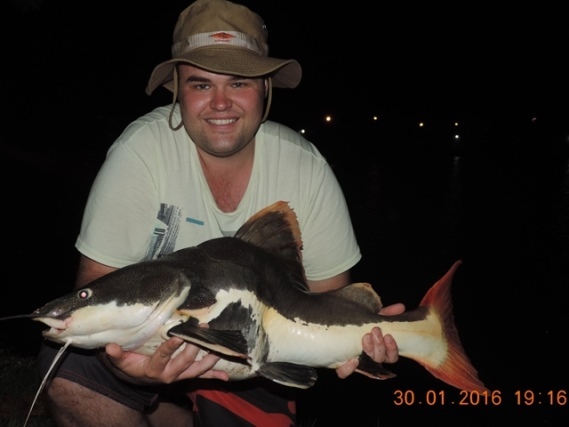 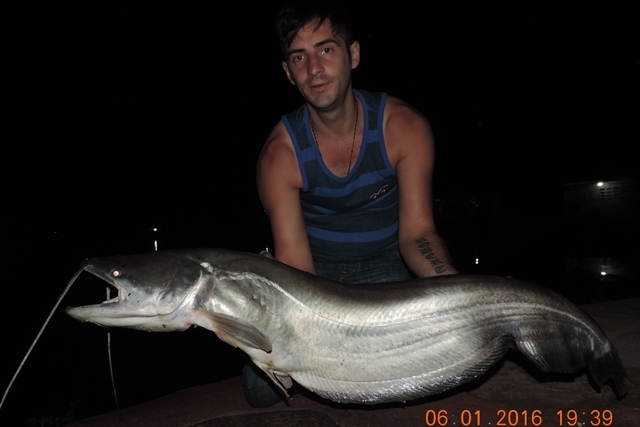 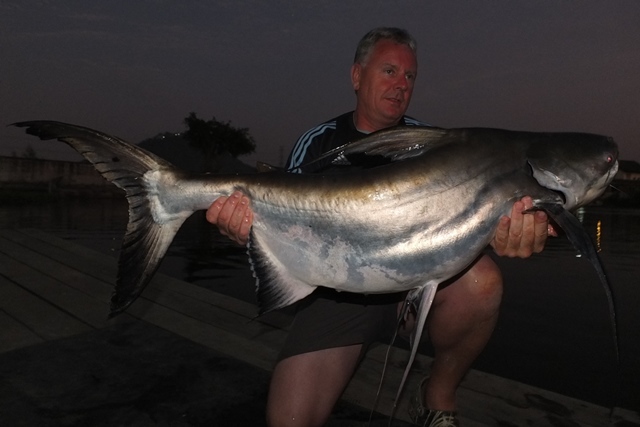 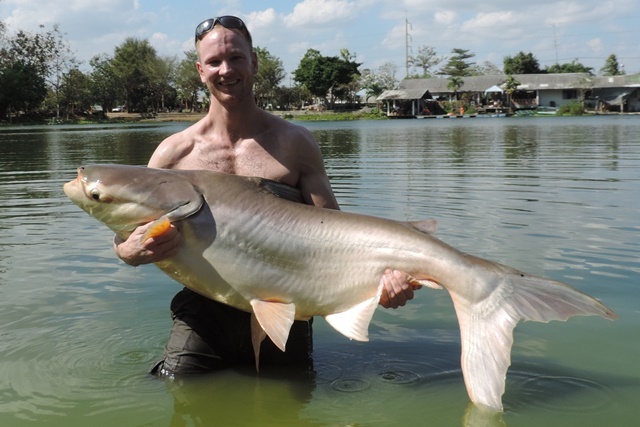 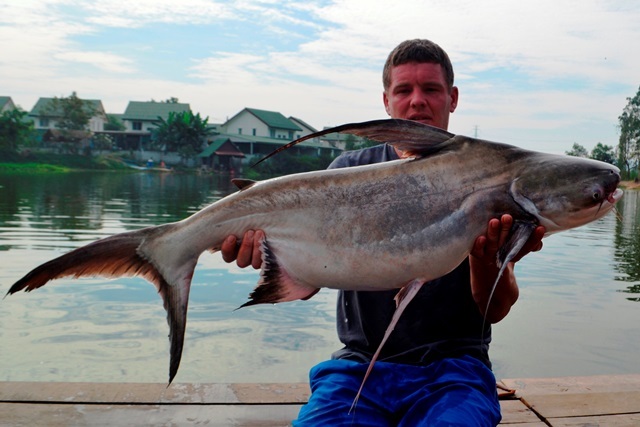 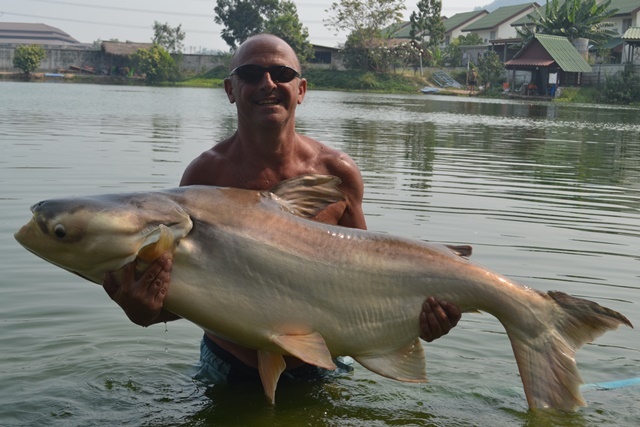 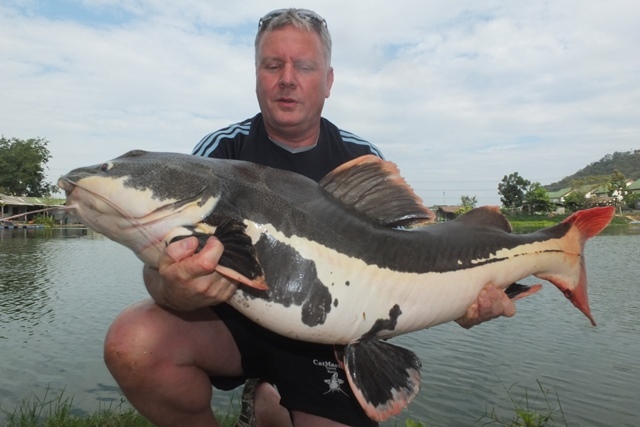 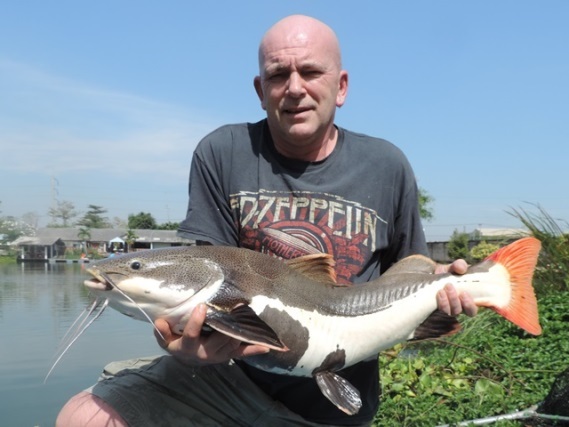 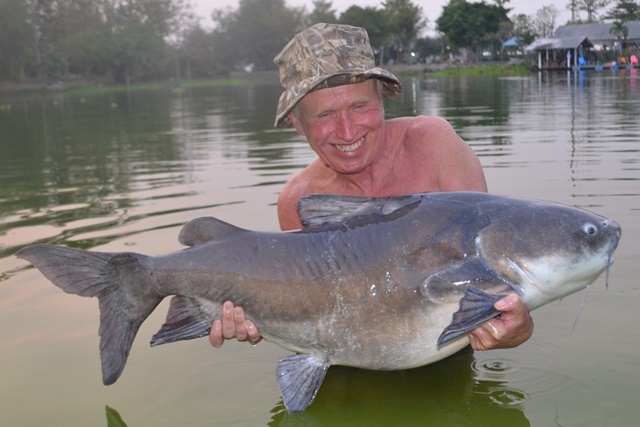 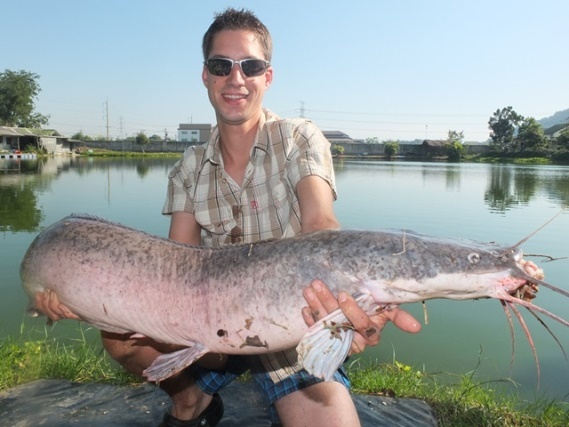 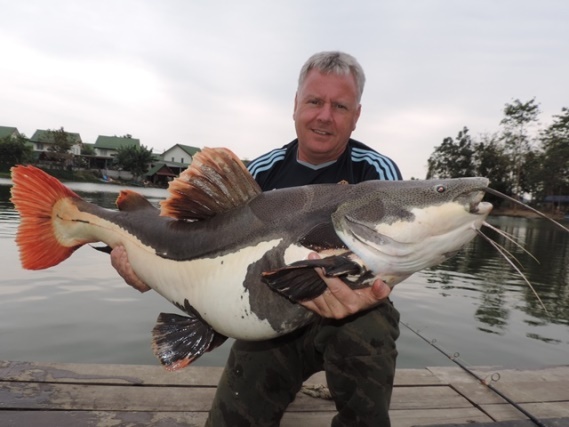 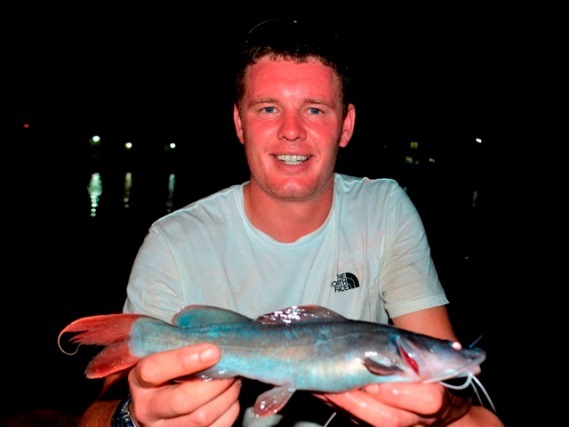 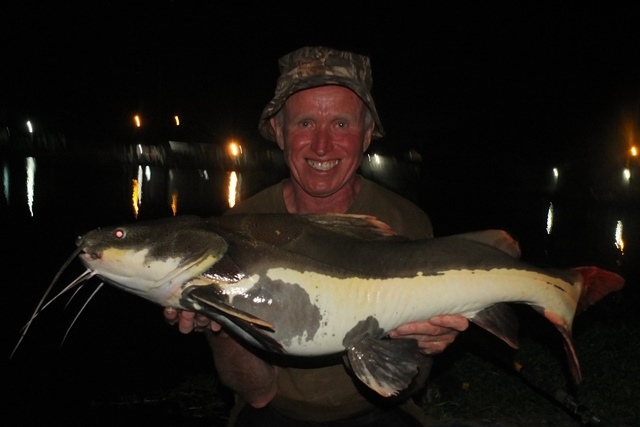 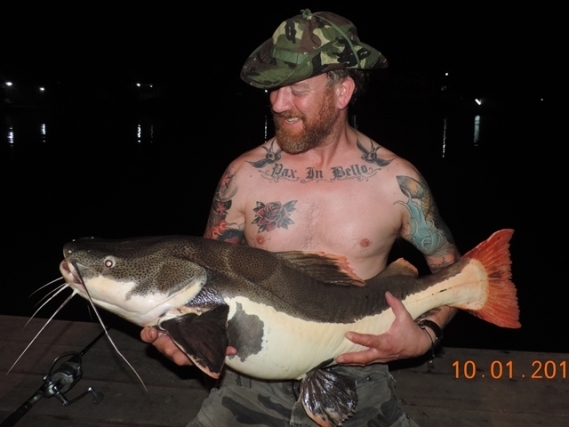 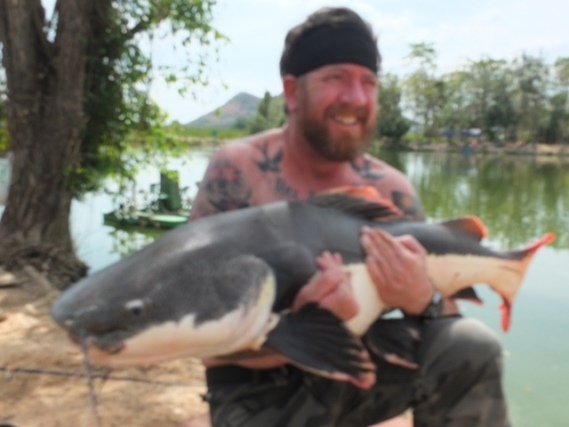 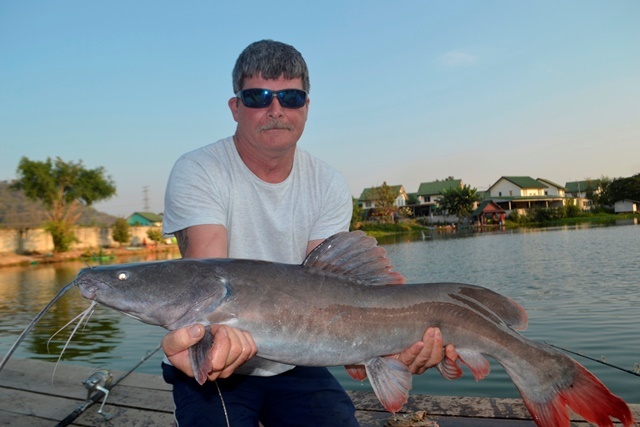 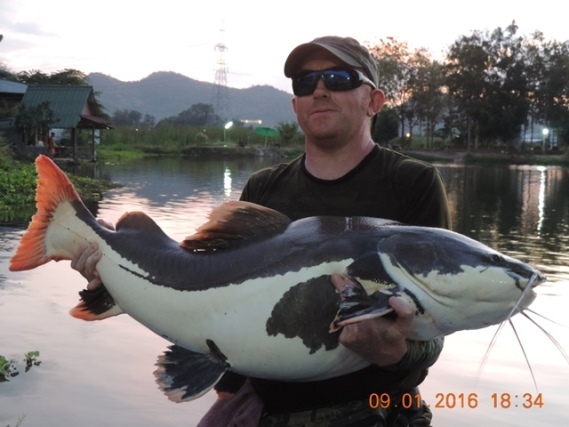 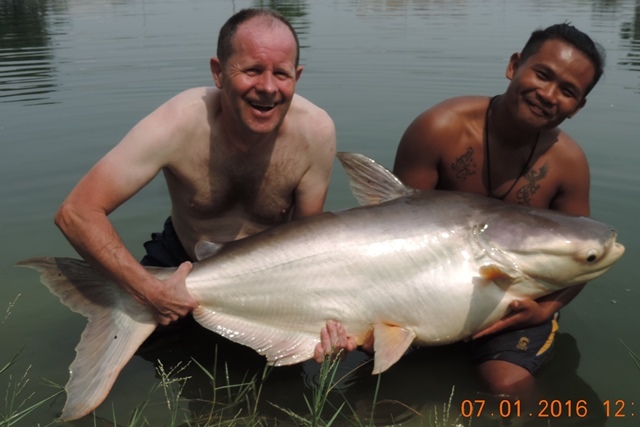 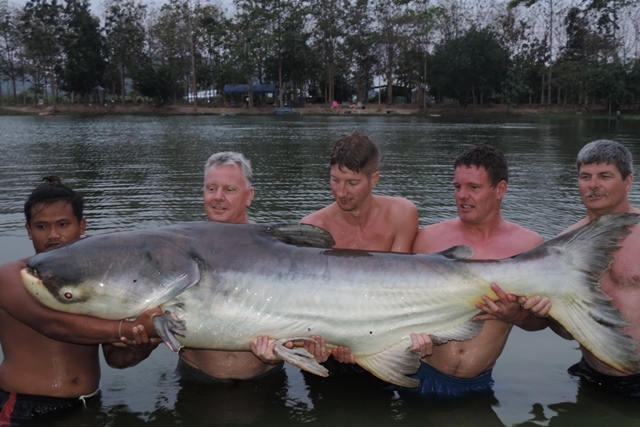 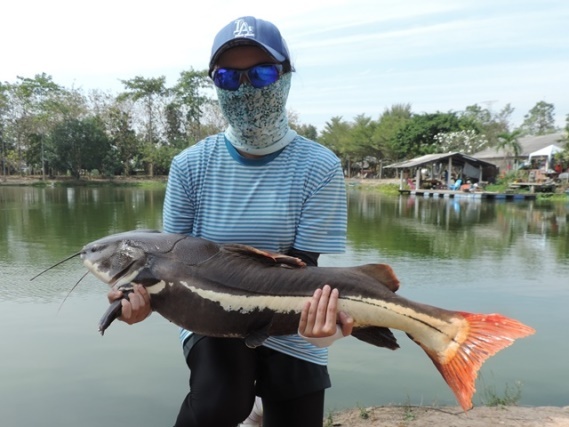 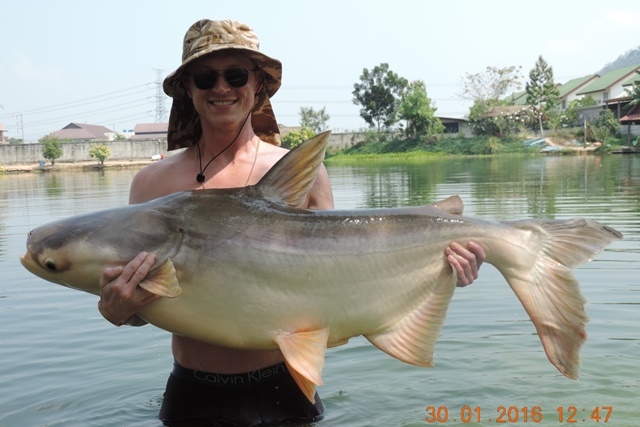 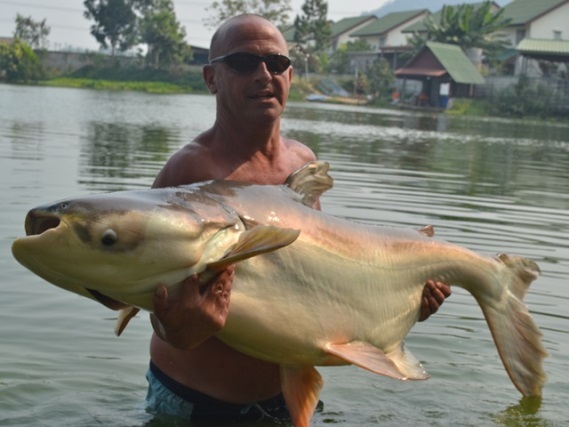 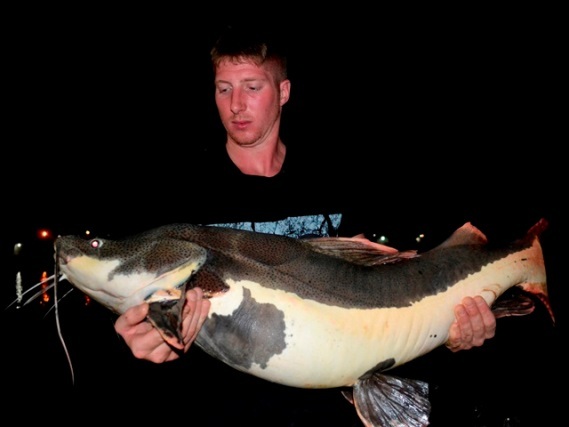 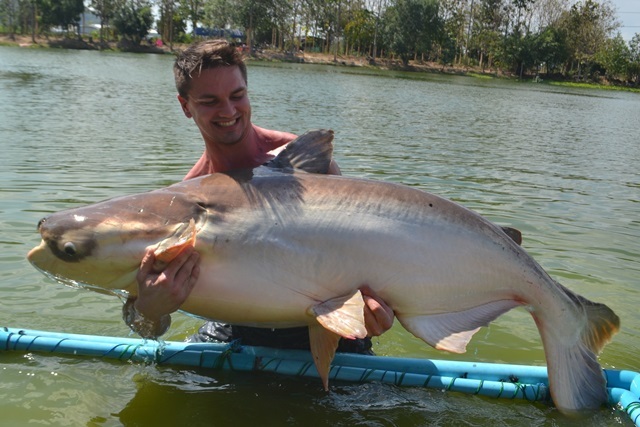 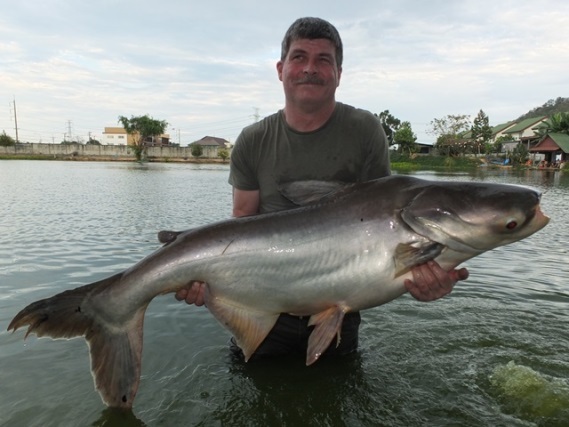 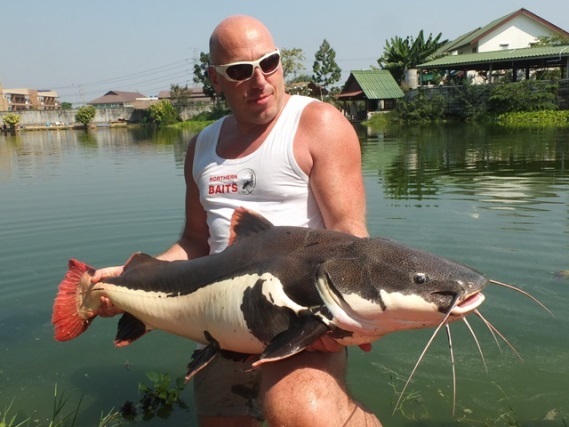 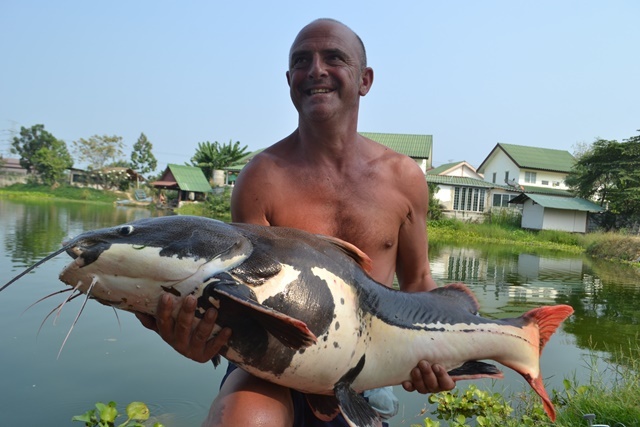 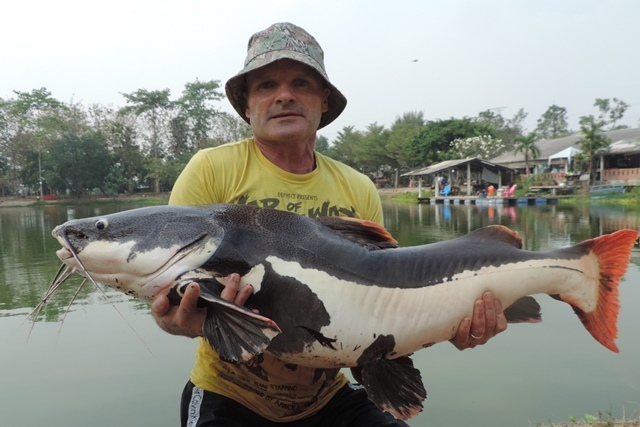 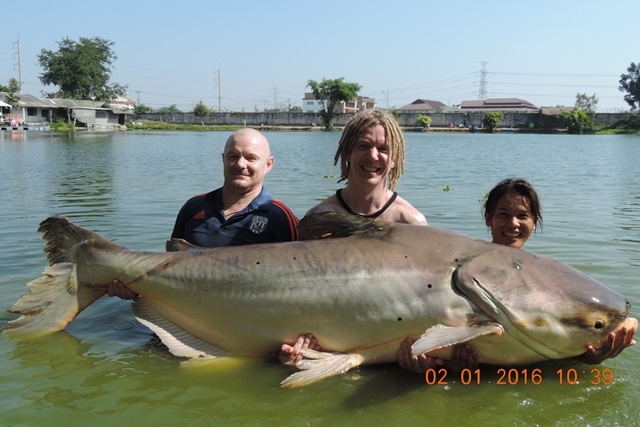 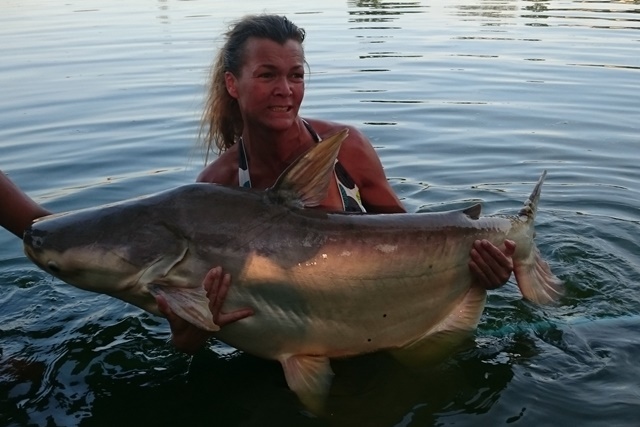 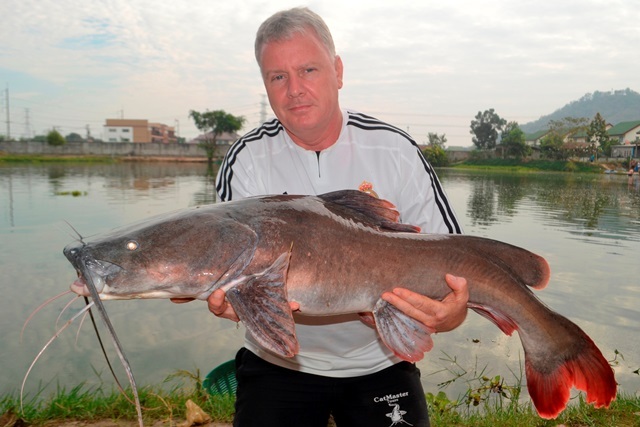 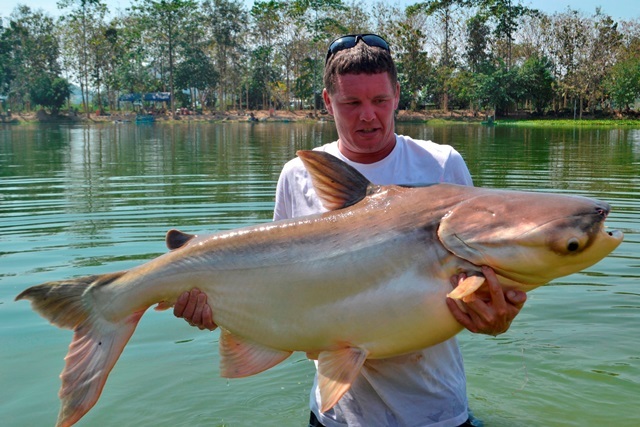 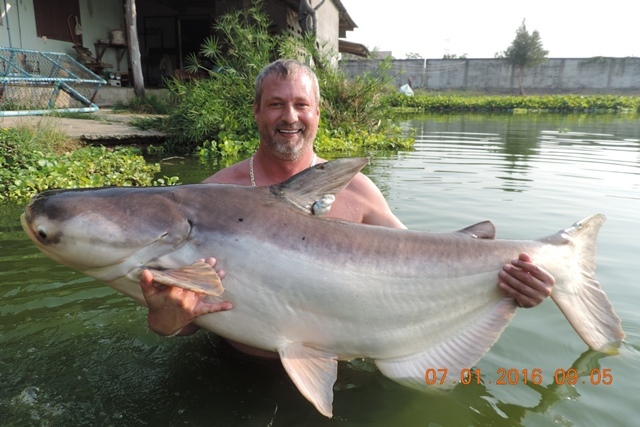 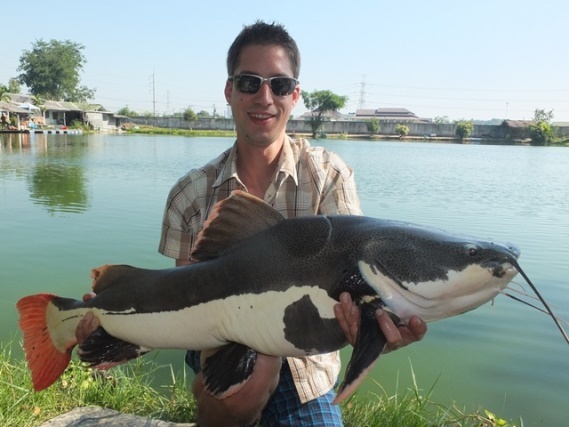 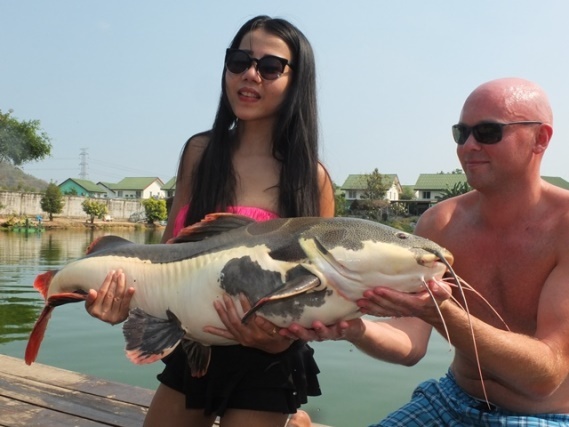 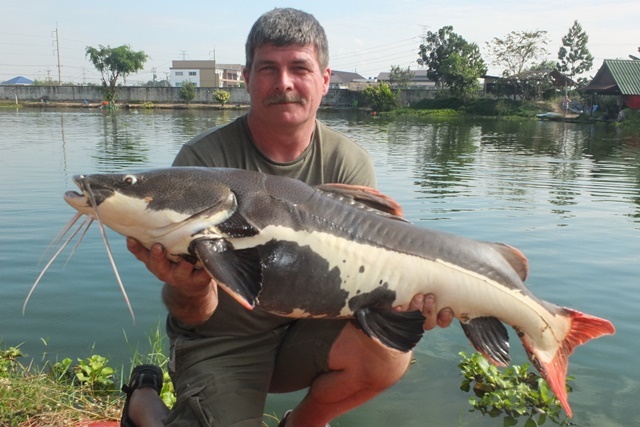 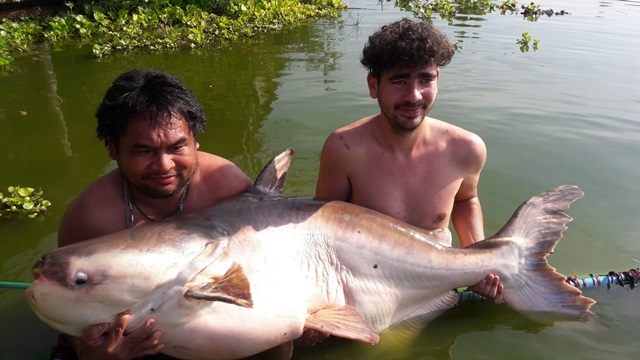 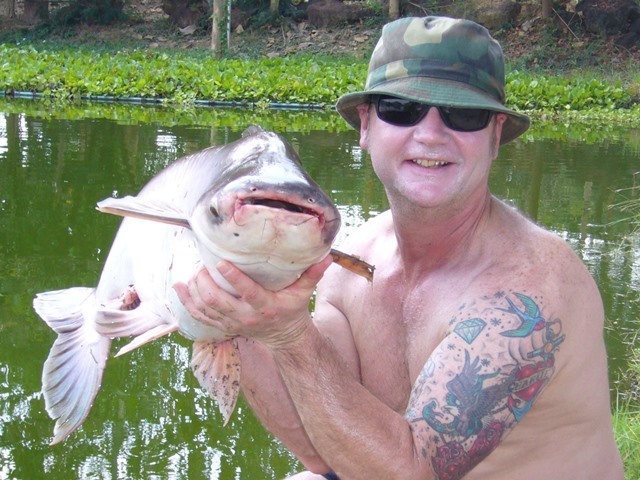 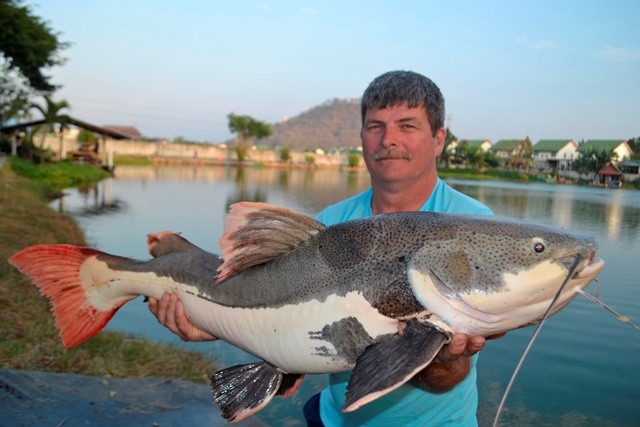 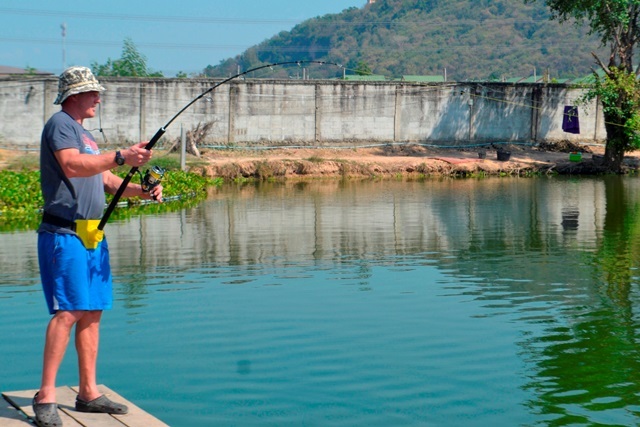 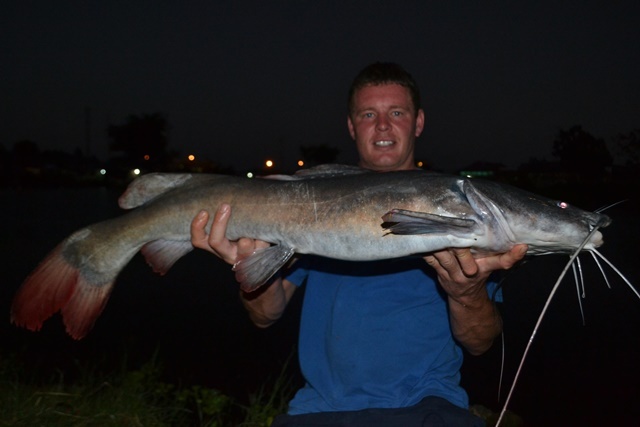 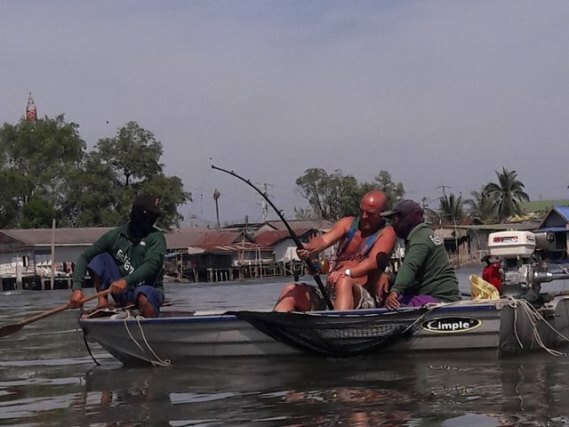 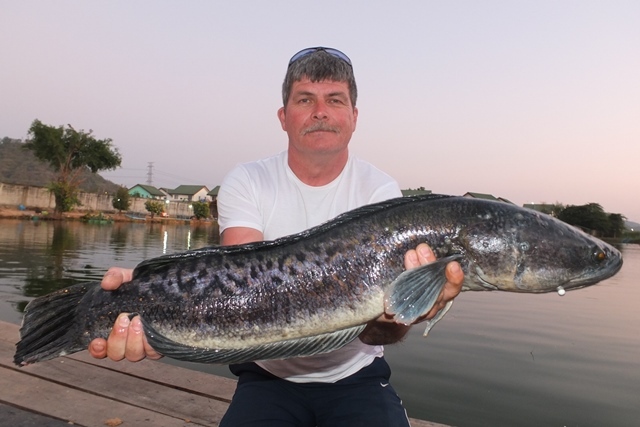 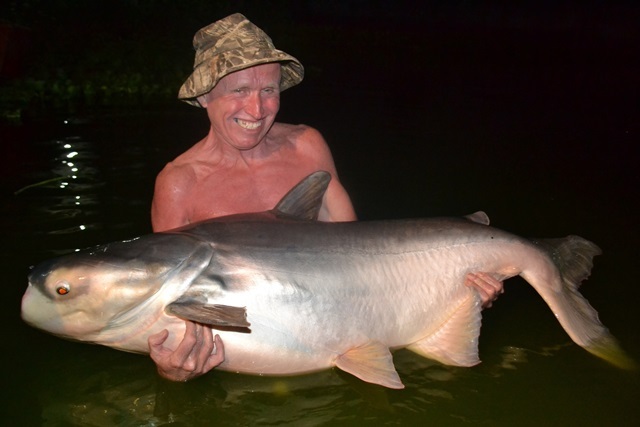 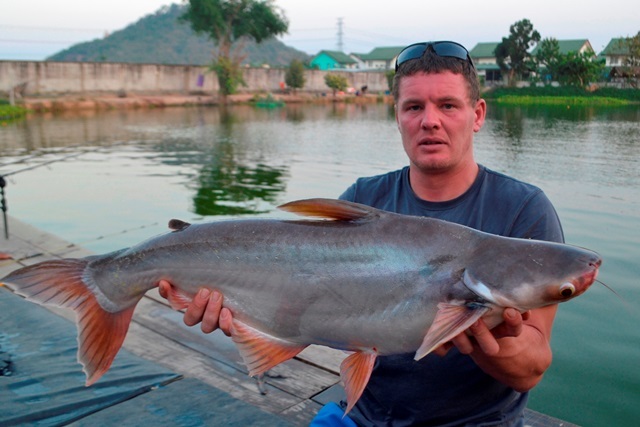 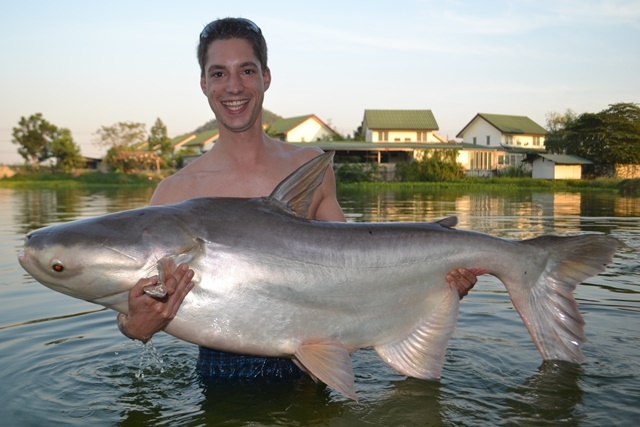 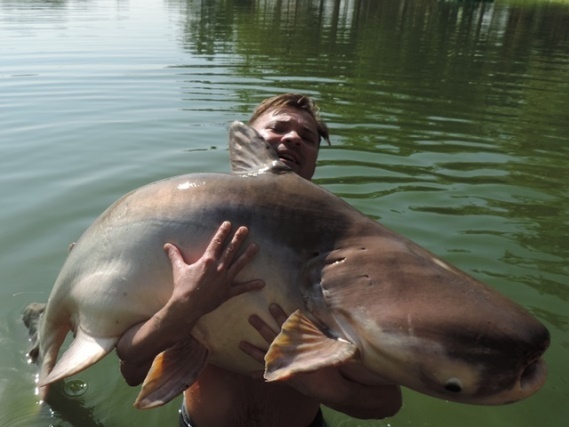 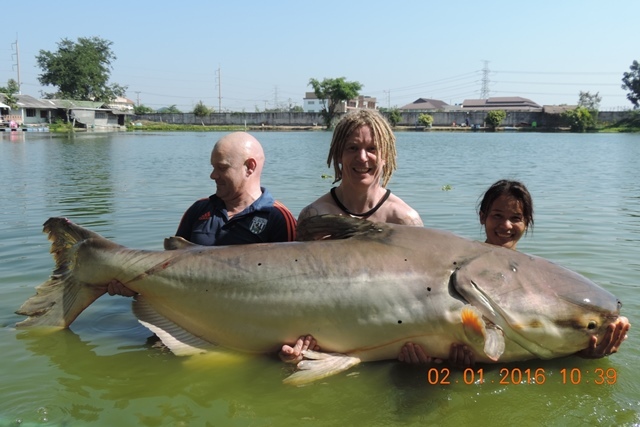 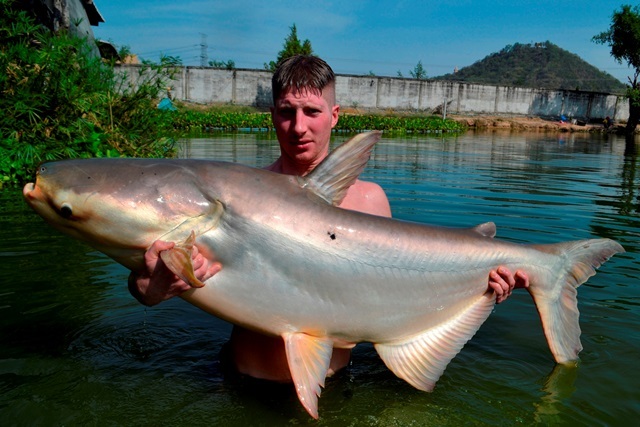 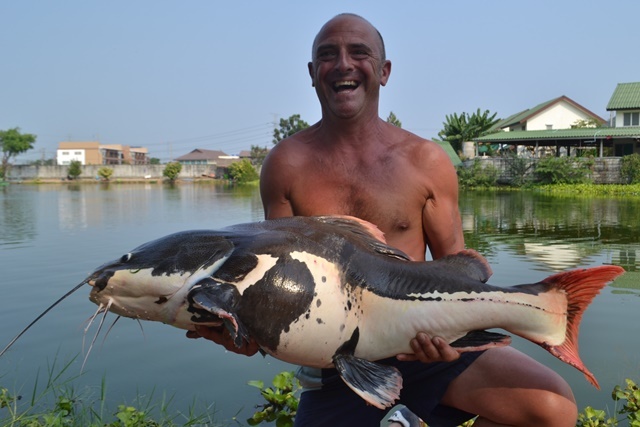 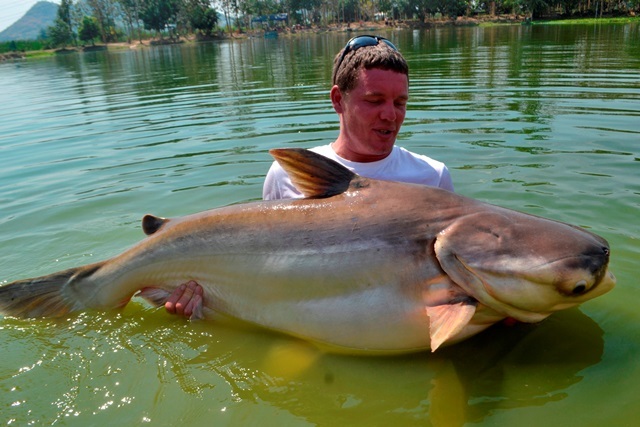 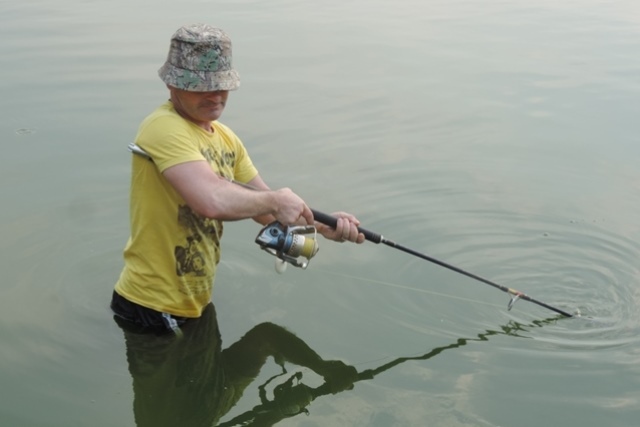 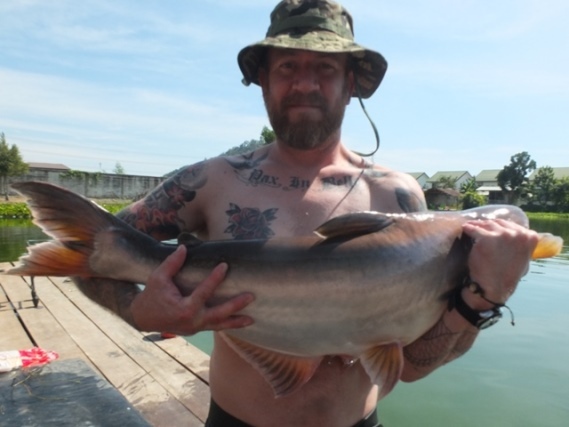 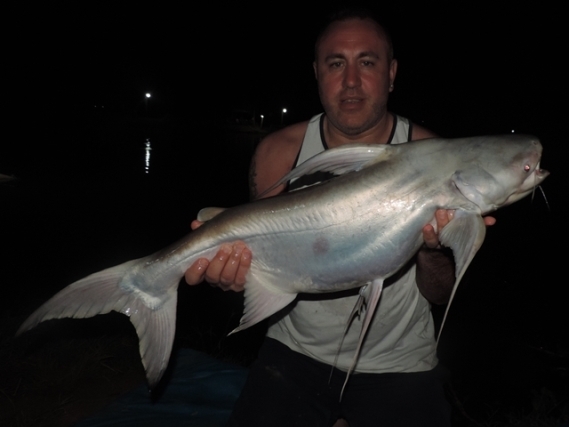 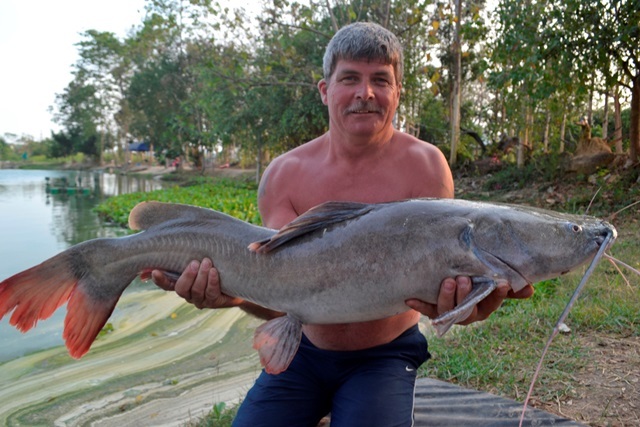 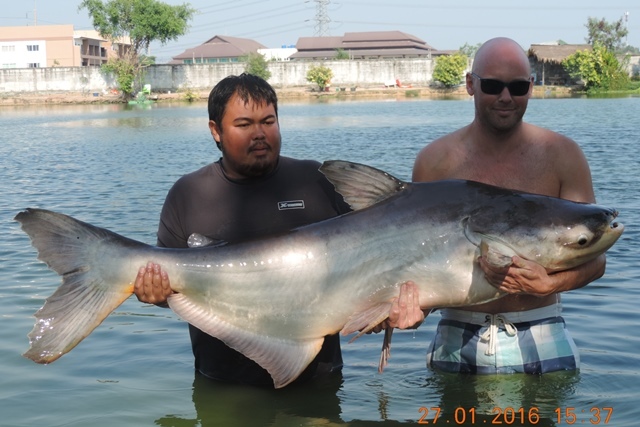 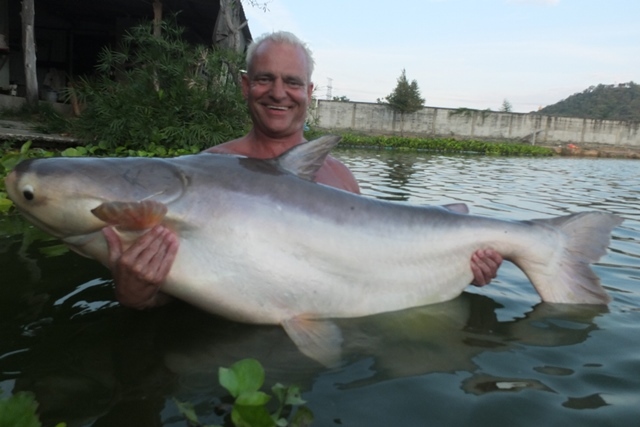 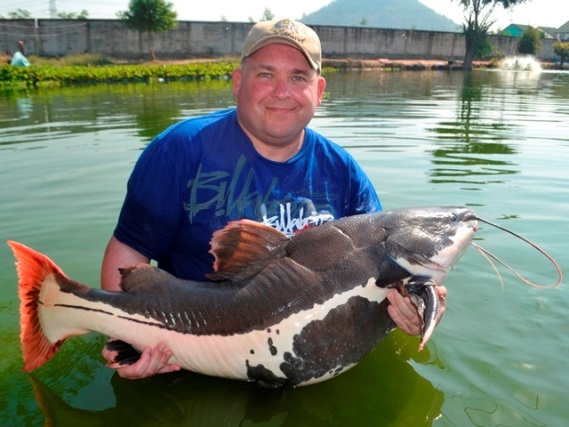 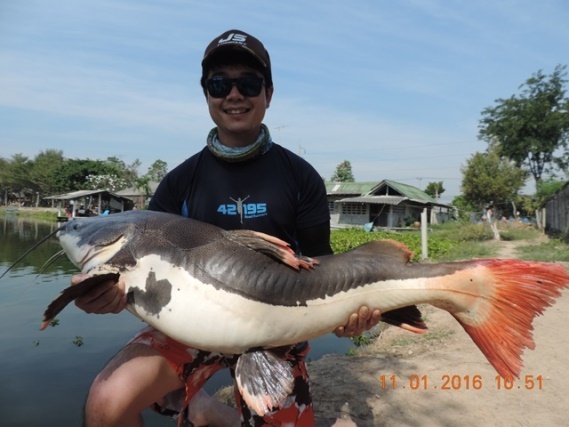 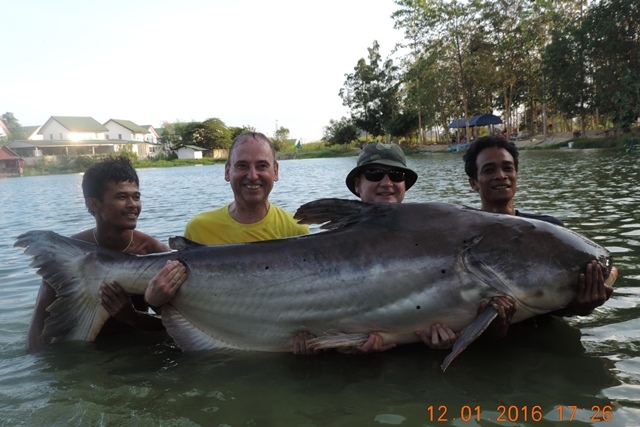 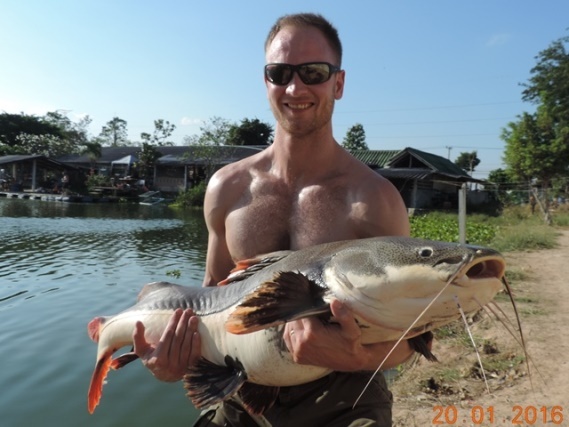 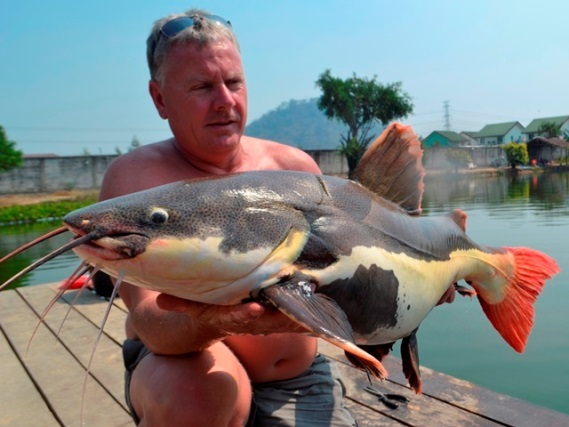 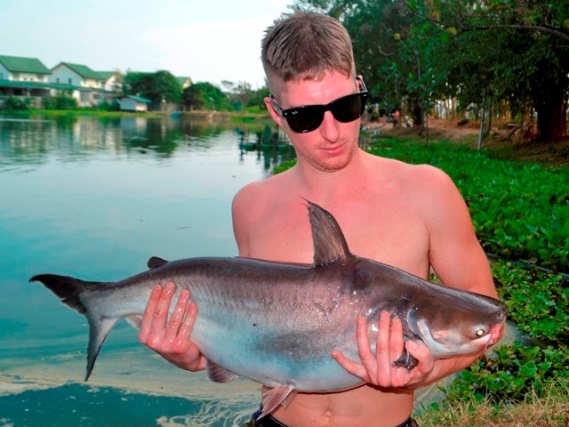 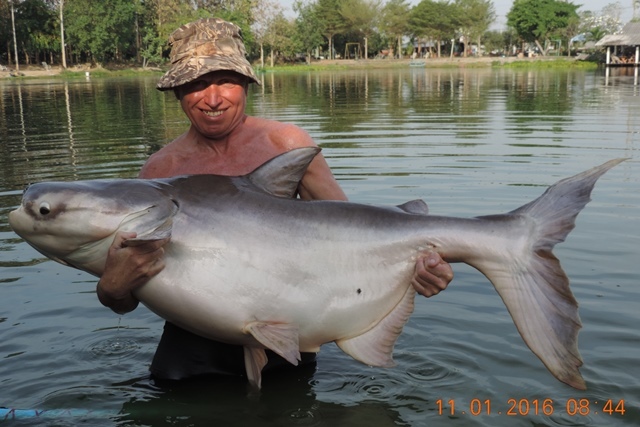 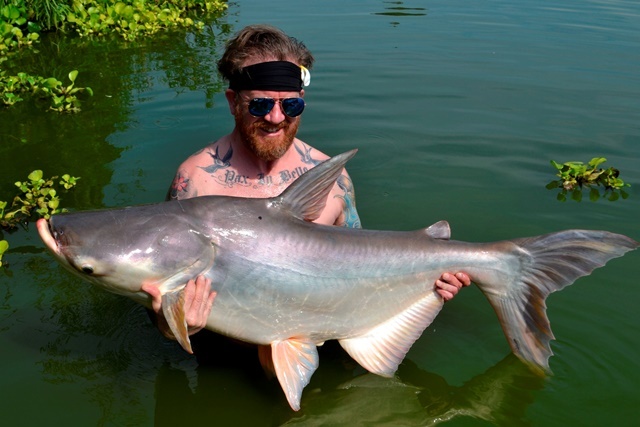 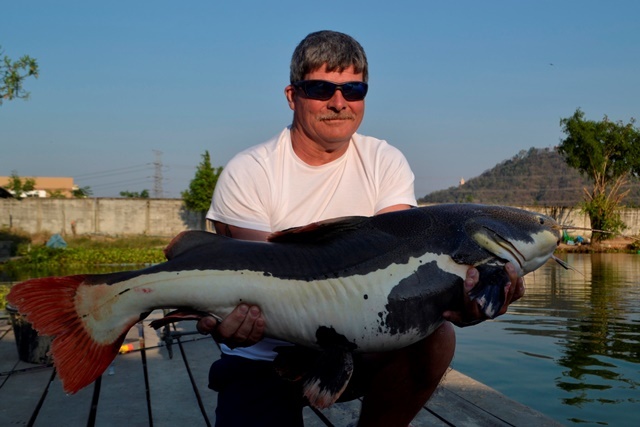 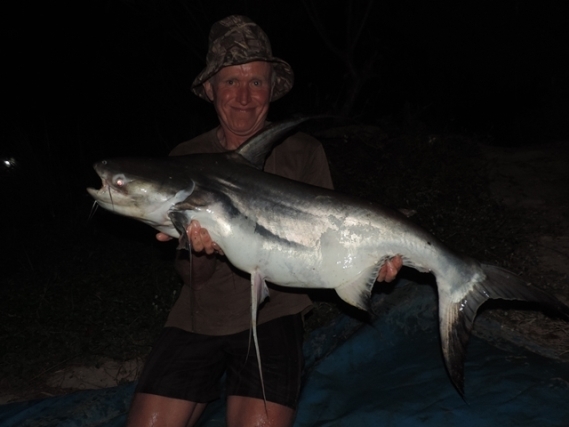 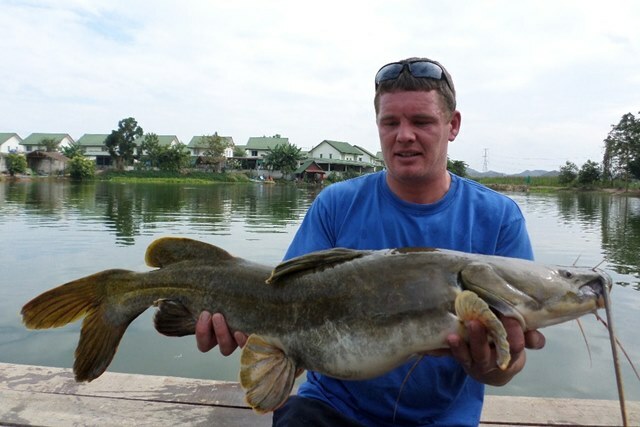 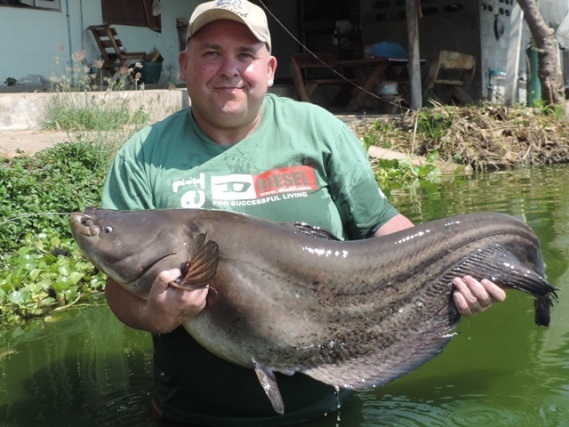 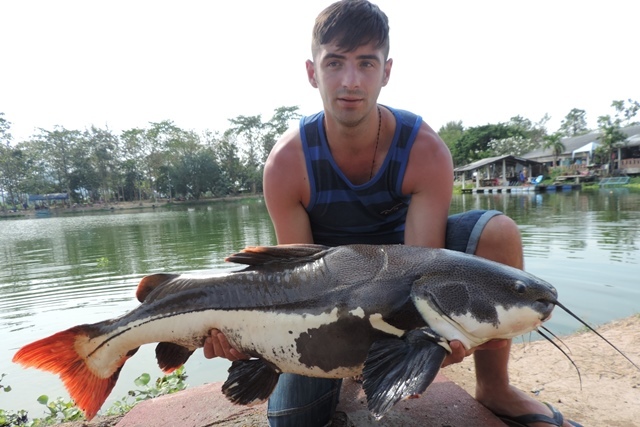 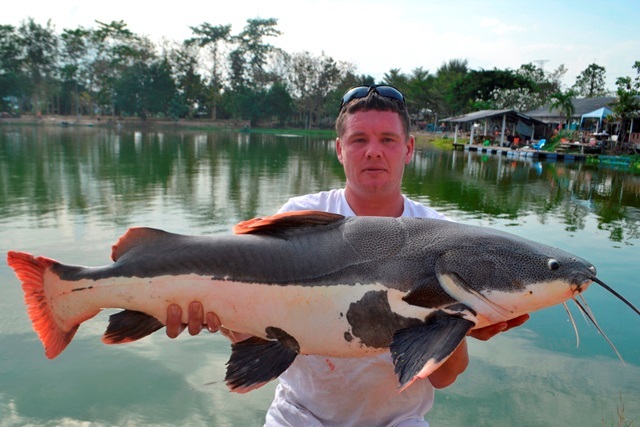 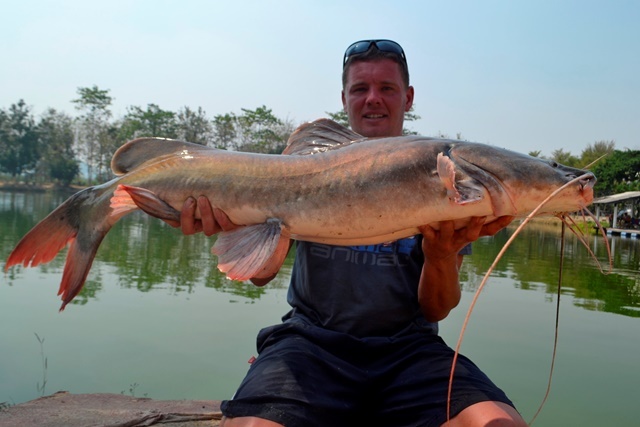 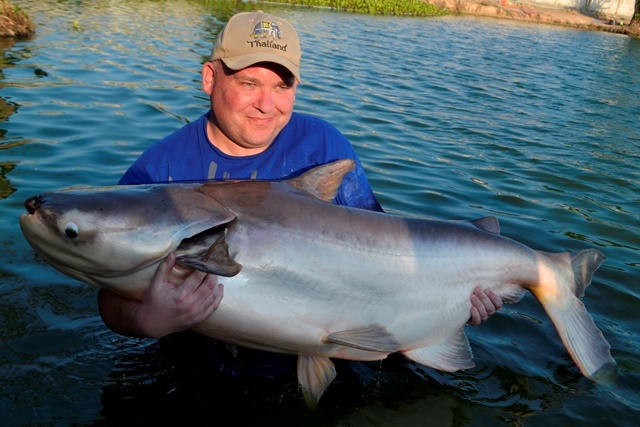 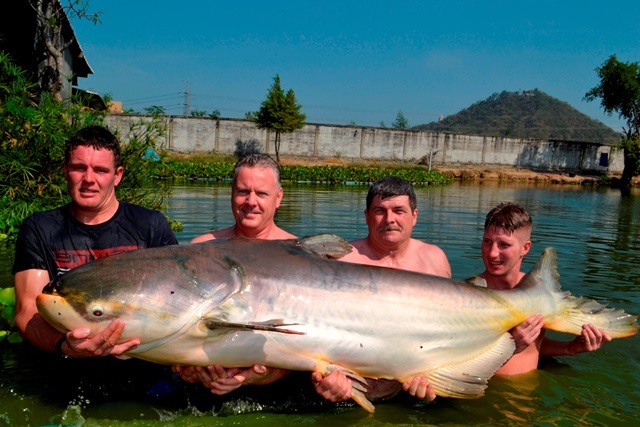 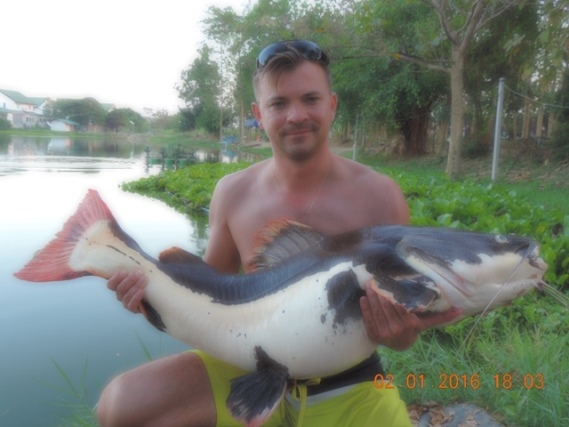 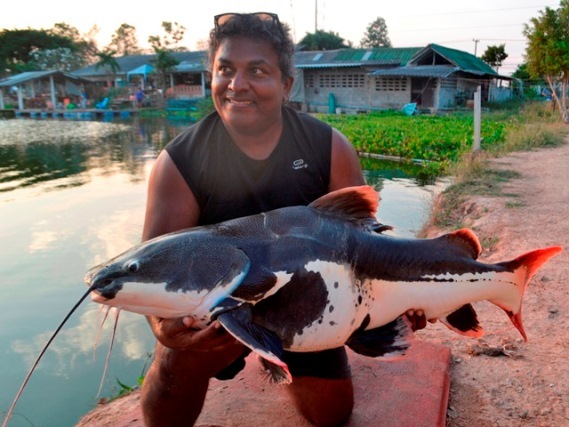 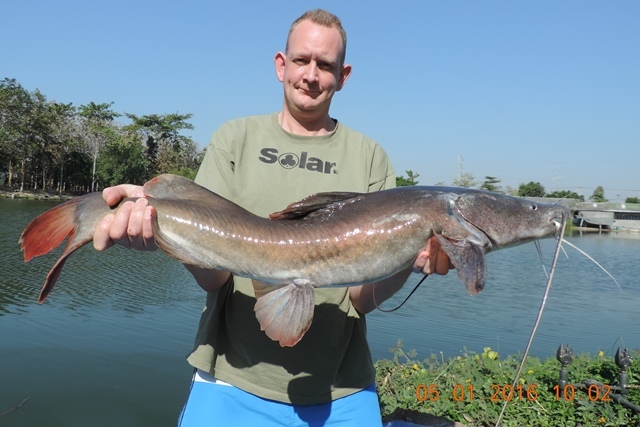 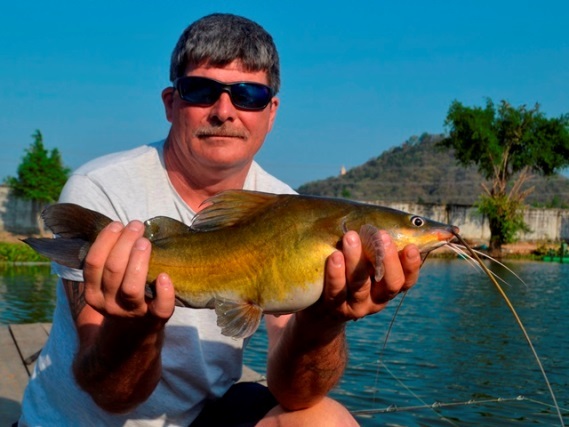 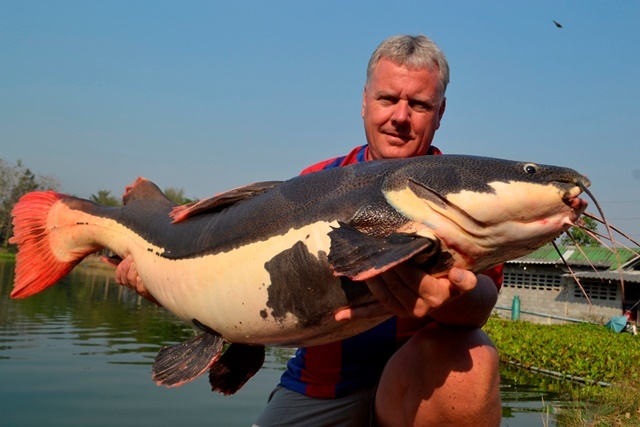 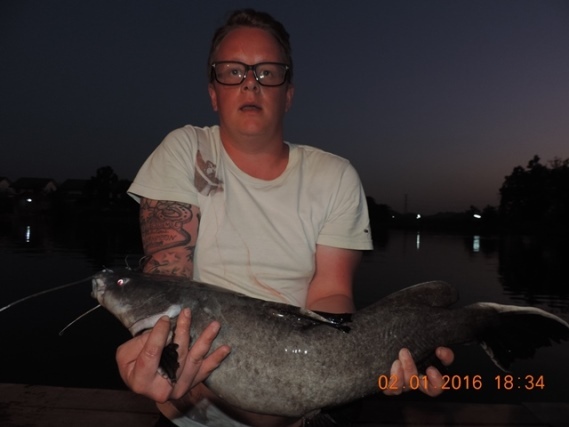 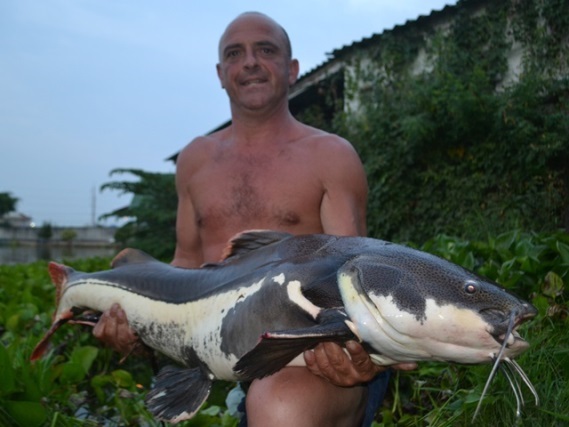 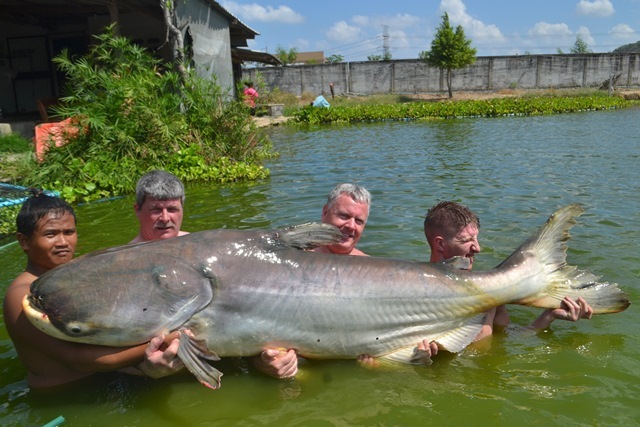 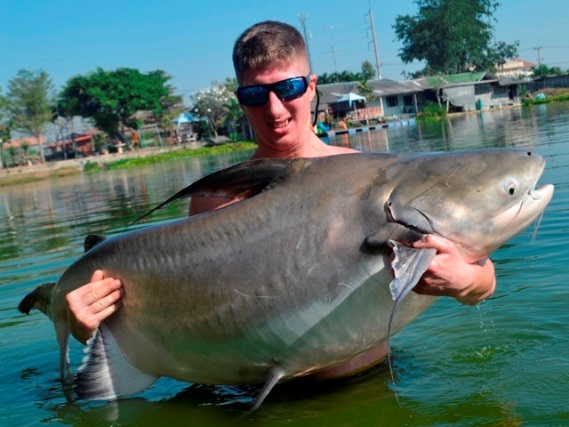 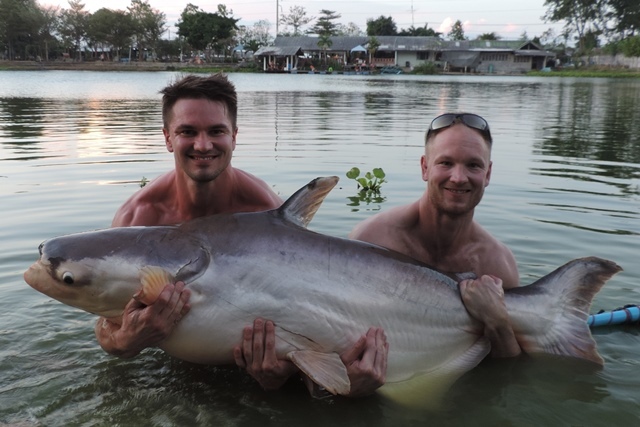 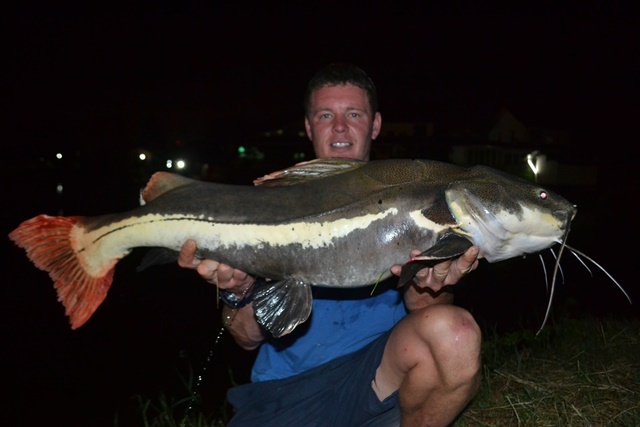 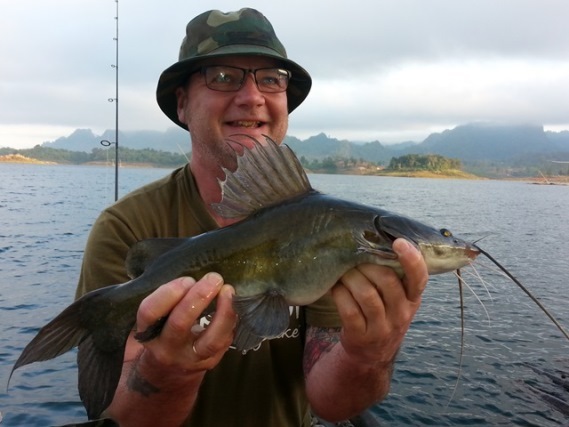 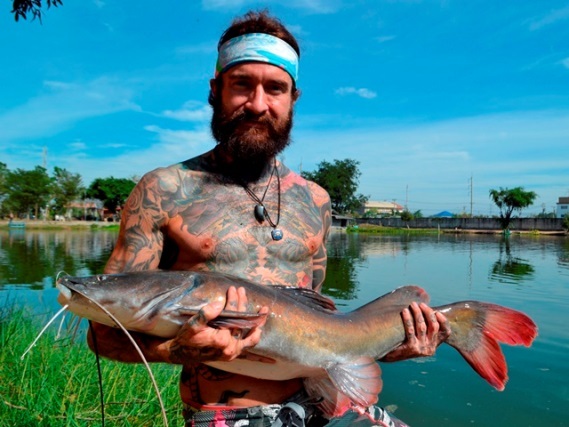 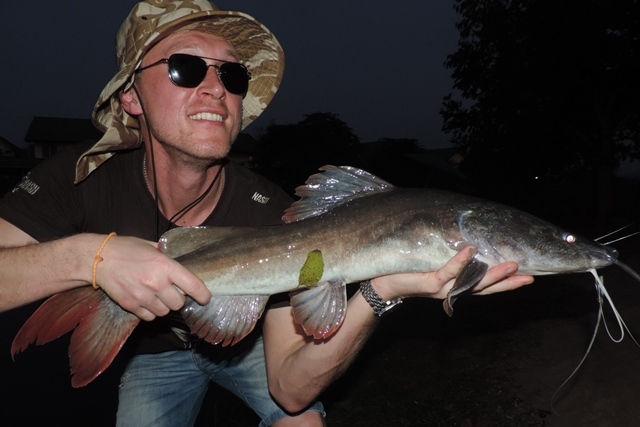 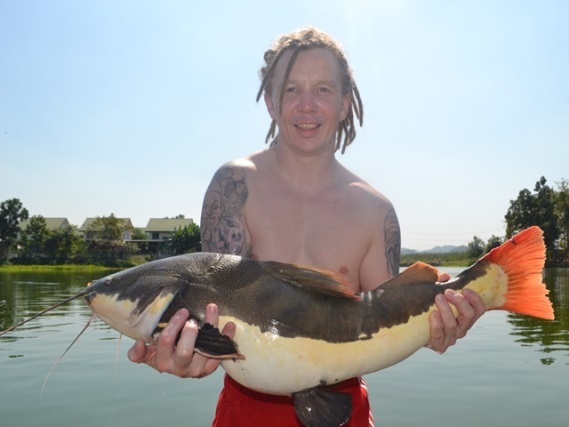 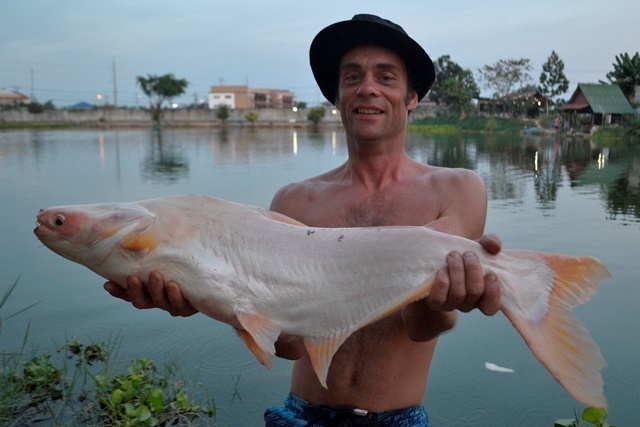 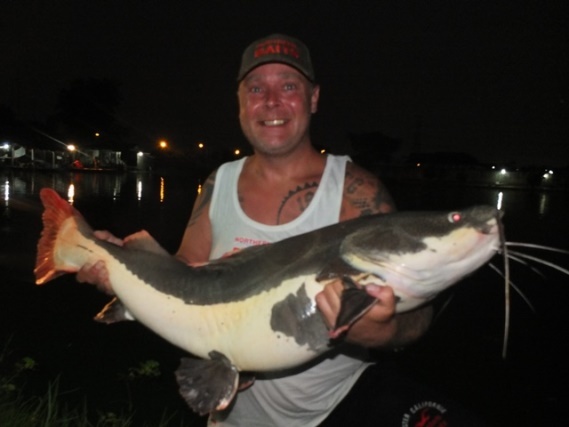 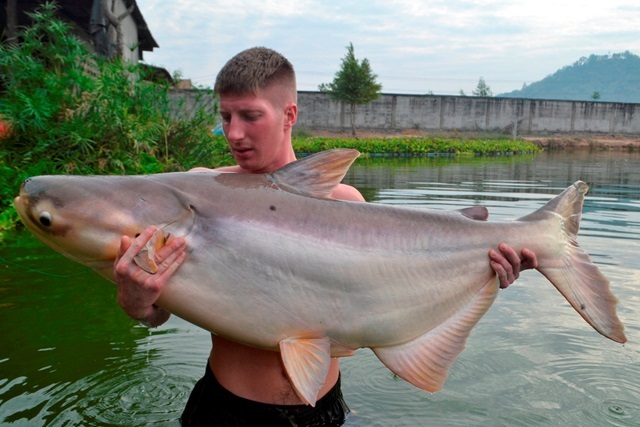 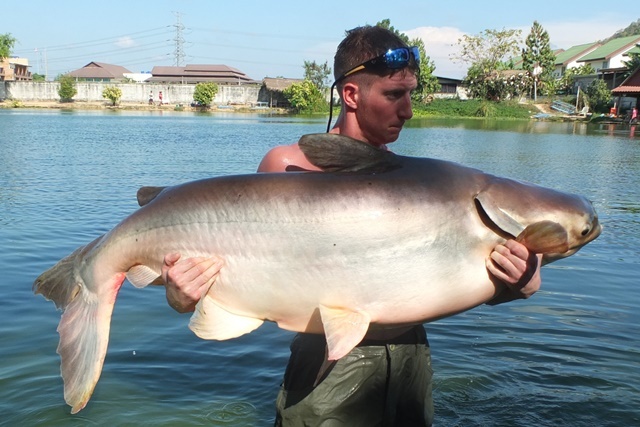 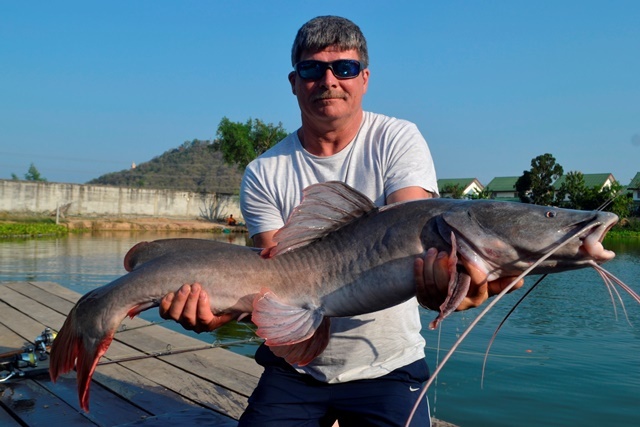 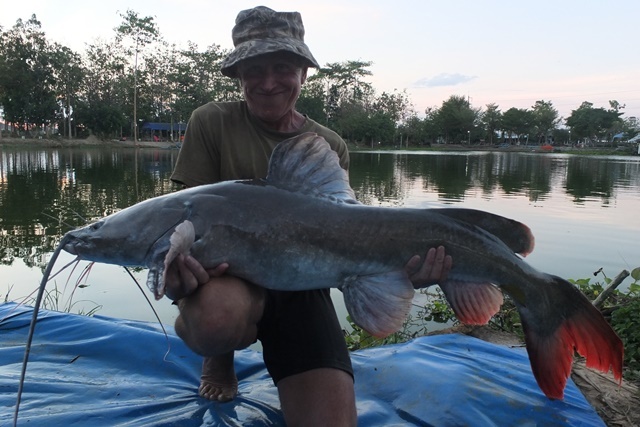 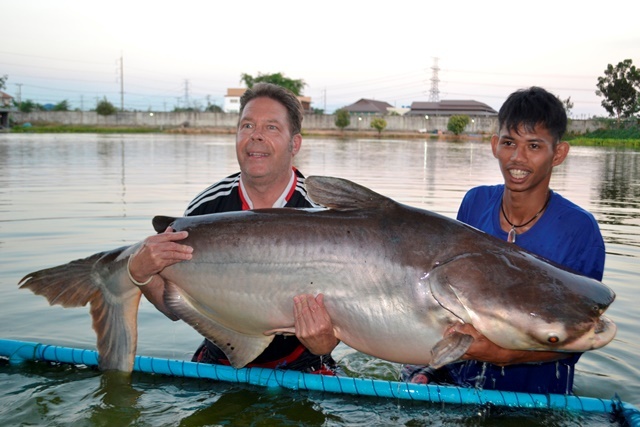 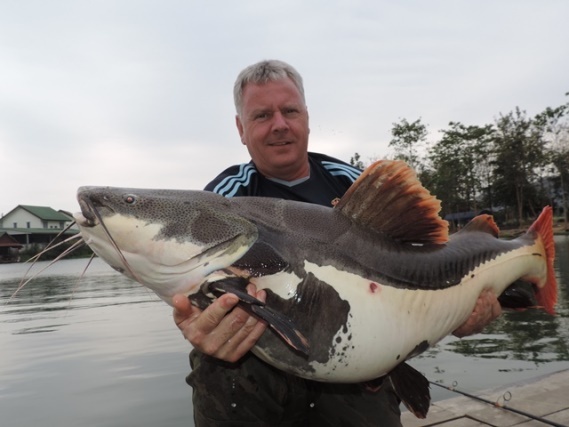 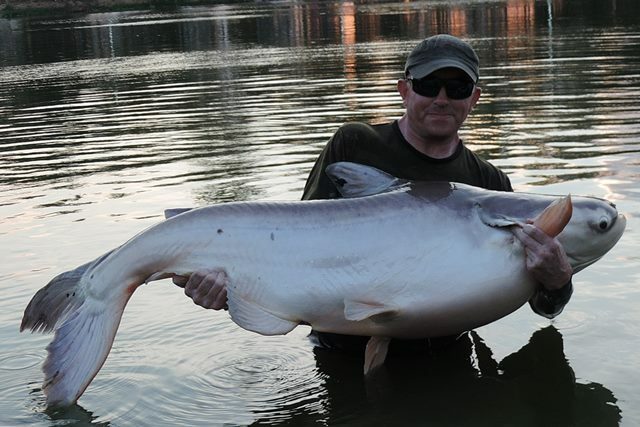 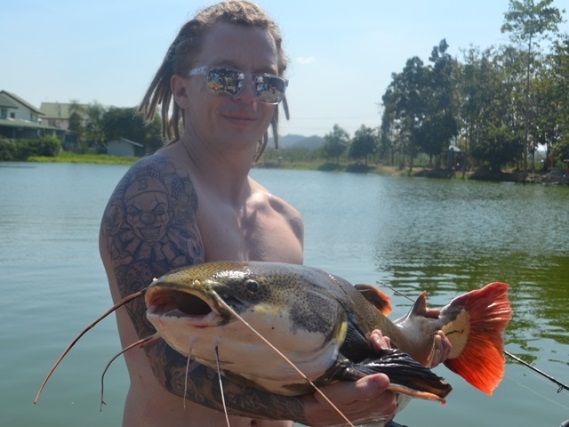 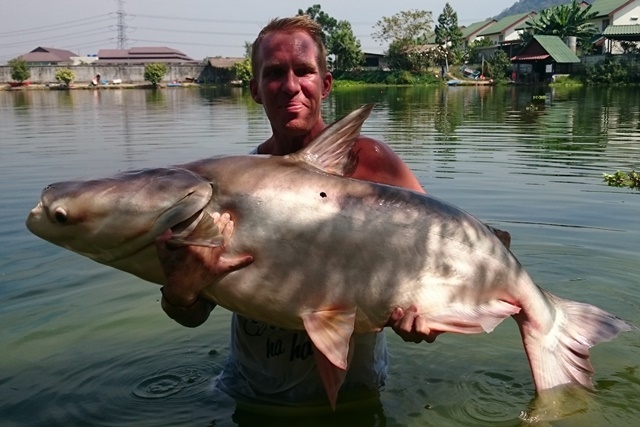 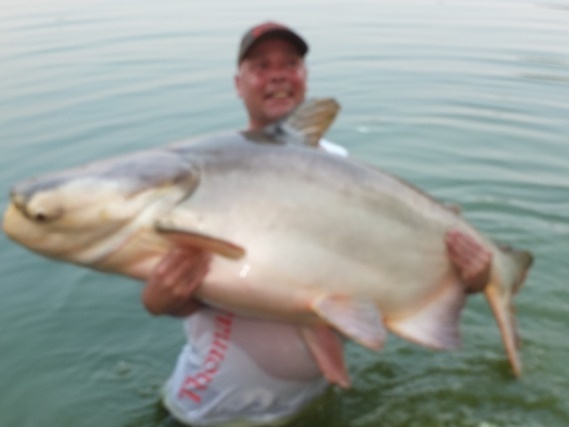 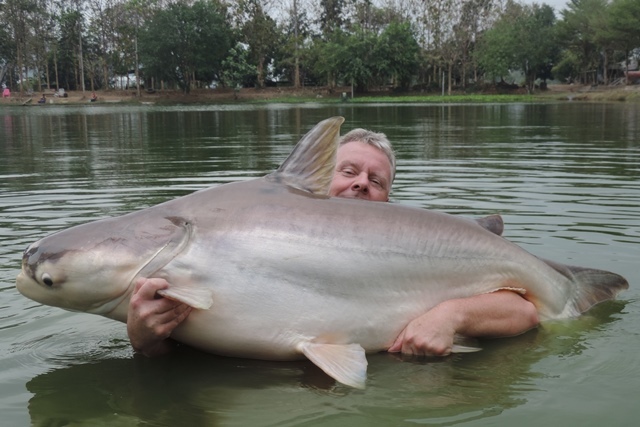 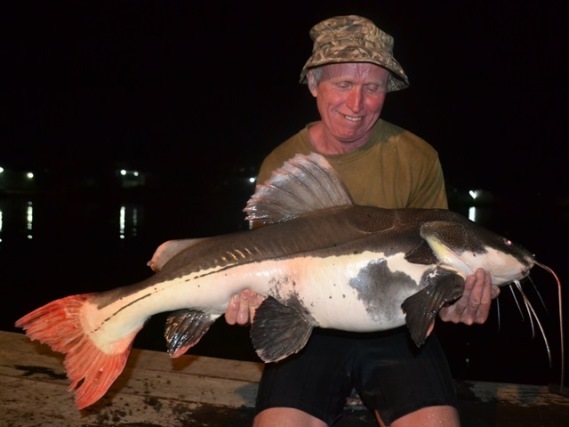 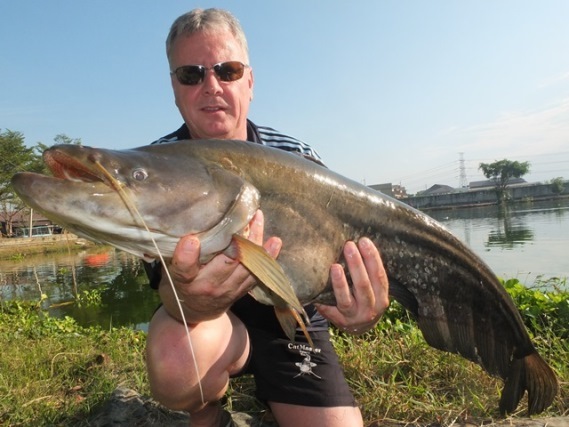 German angler Reimund Muller who lives locally around Ratchaaburi and his fishing pal returned to fish again less than a month after their last visit and smashed the lake record for the African walking catfish. 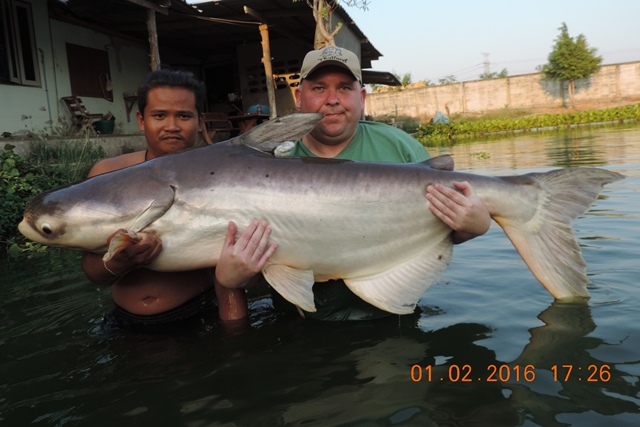 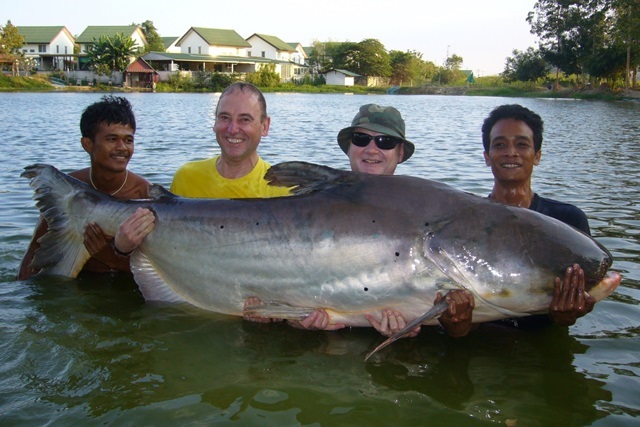 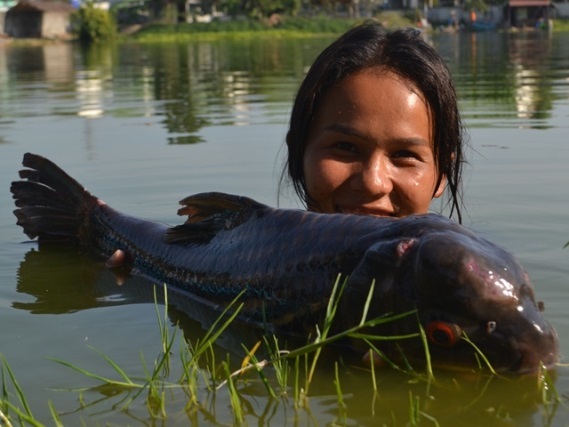 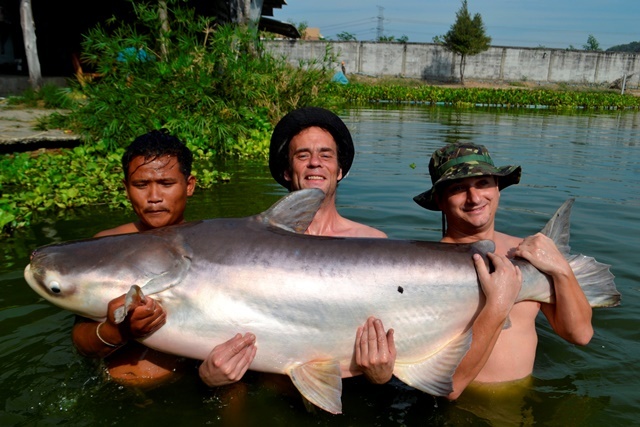 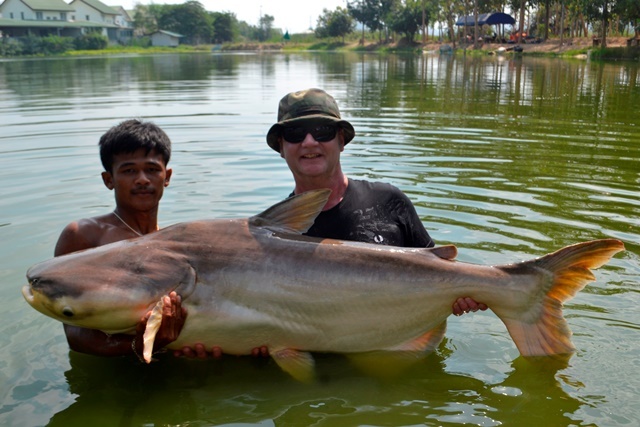 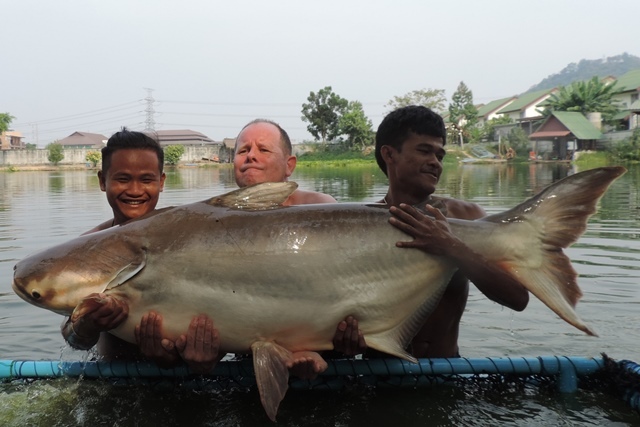 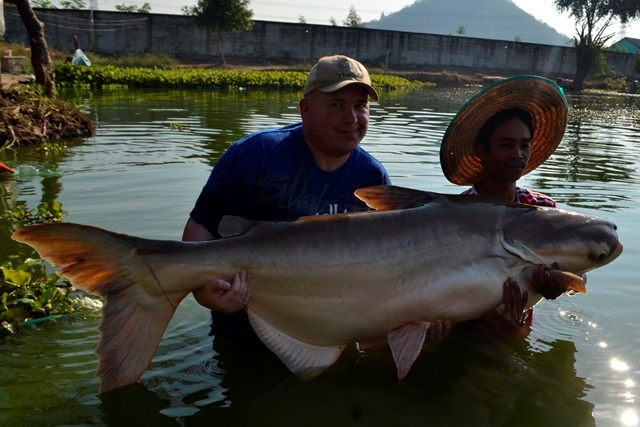 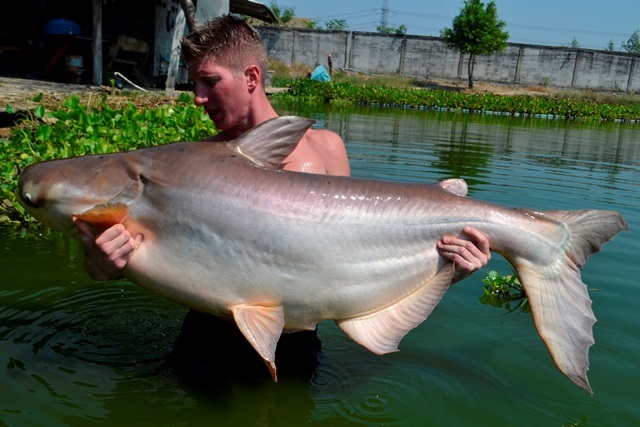 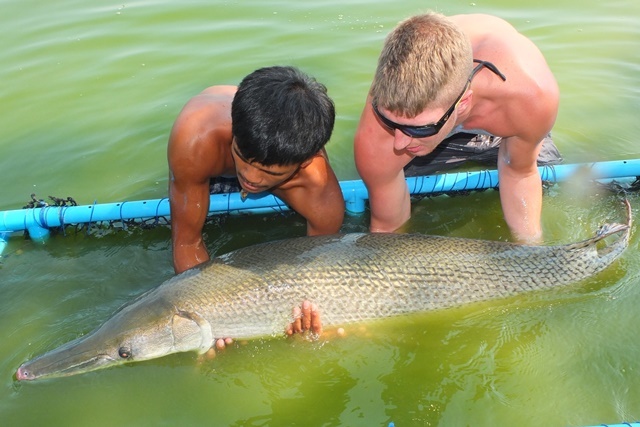 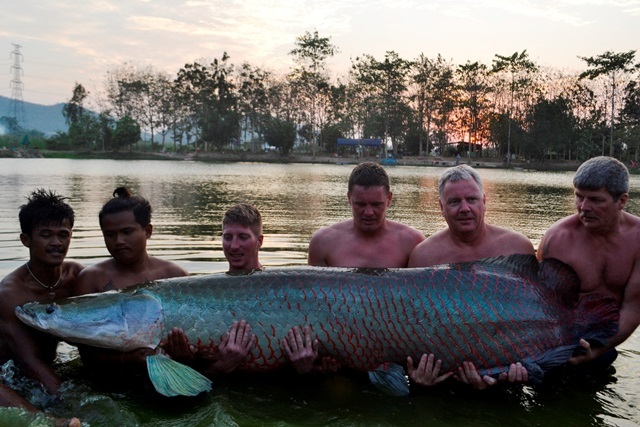 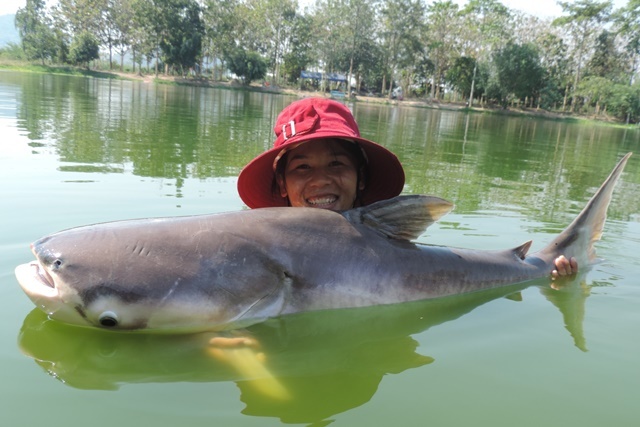 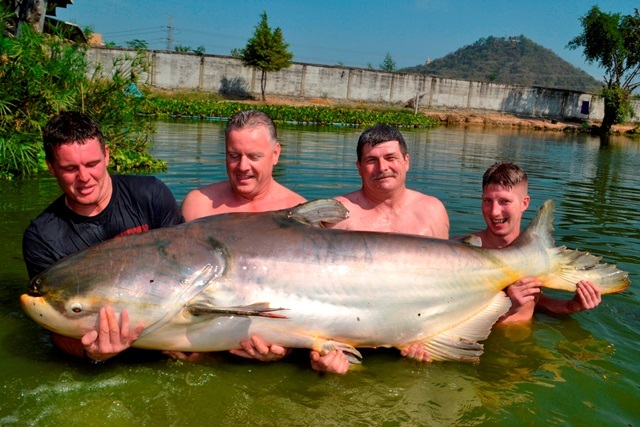 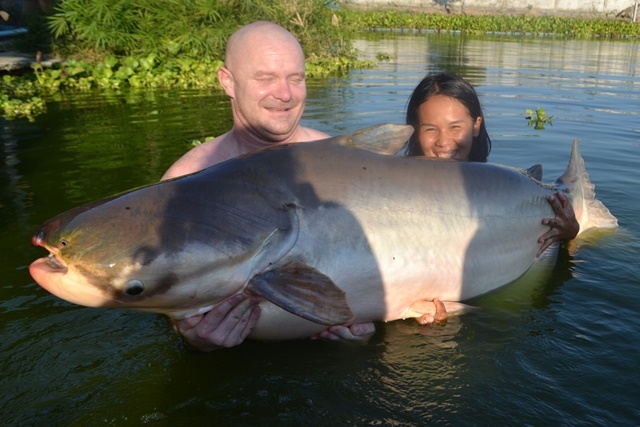 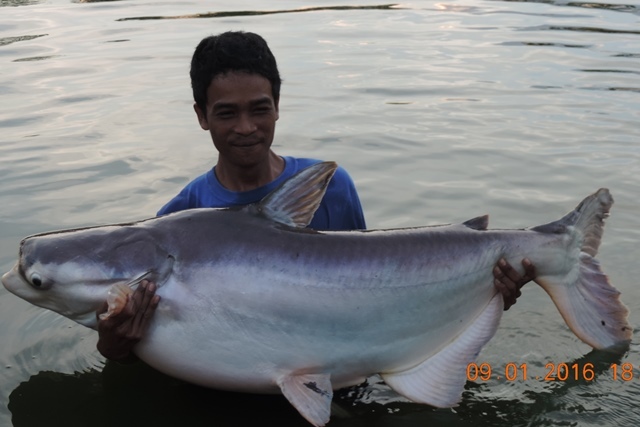 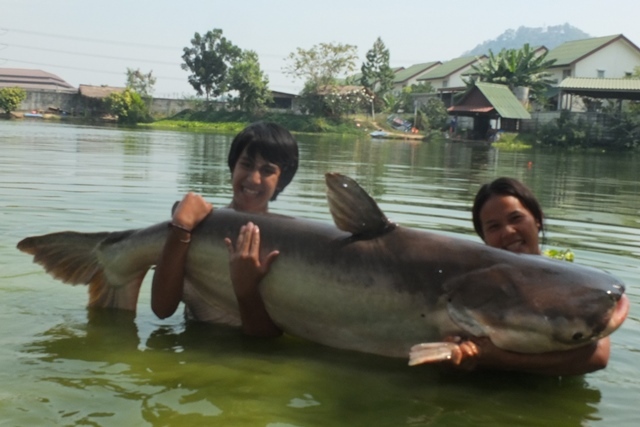 They also caught some big Mekong catfish as well as Siamese carp, big-Y catfish and Amazon redtail. 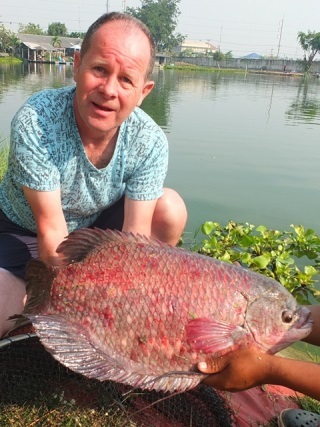 Richard Moorcroft was off to a great start catching a rare predatory elephant ear gourami. 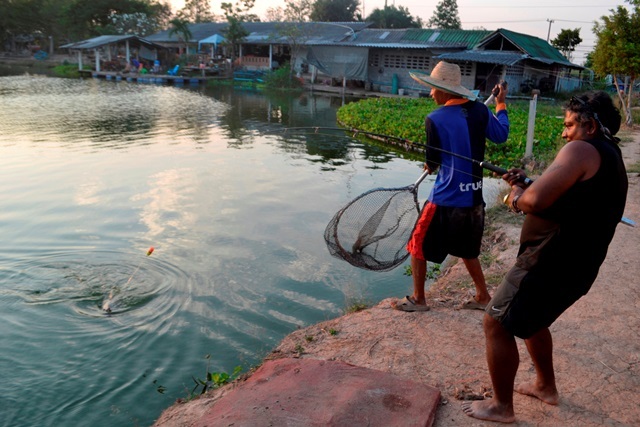 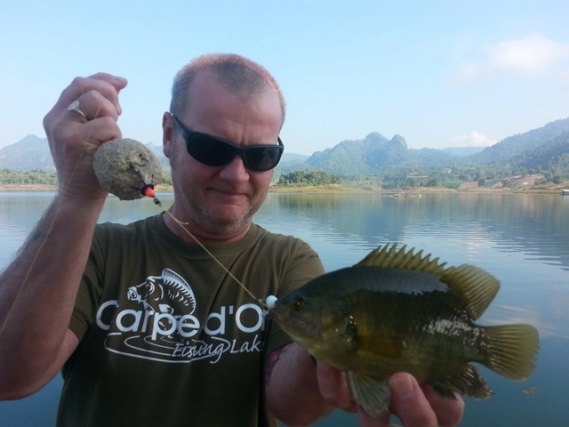 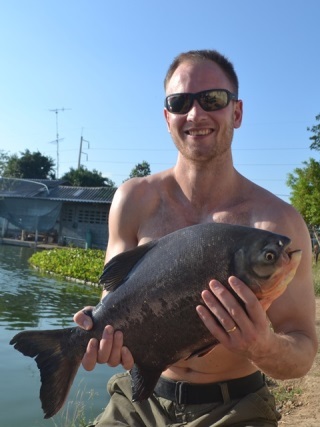 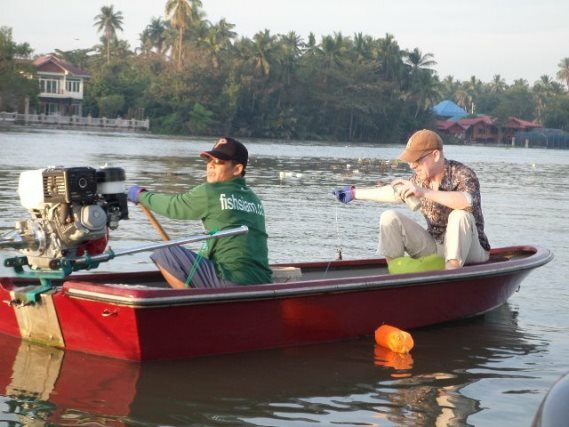 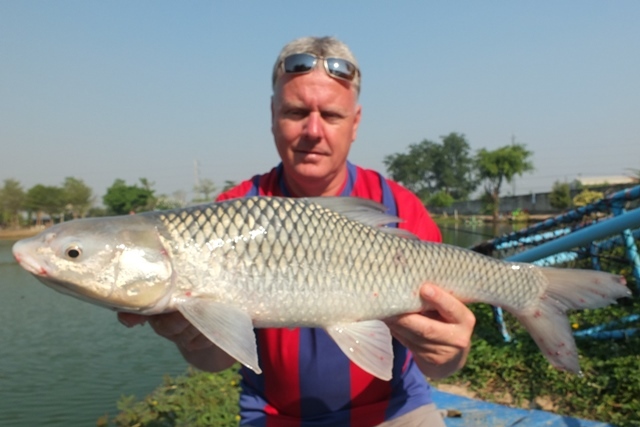 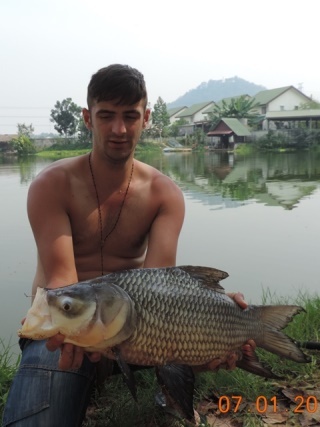 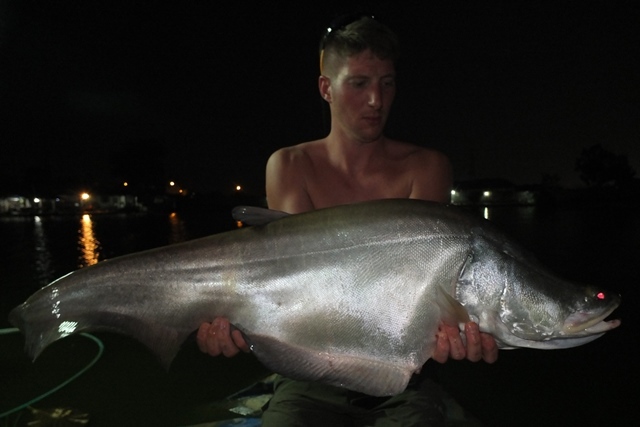 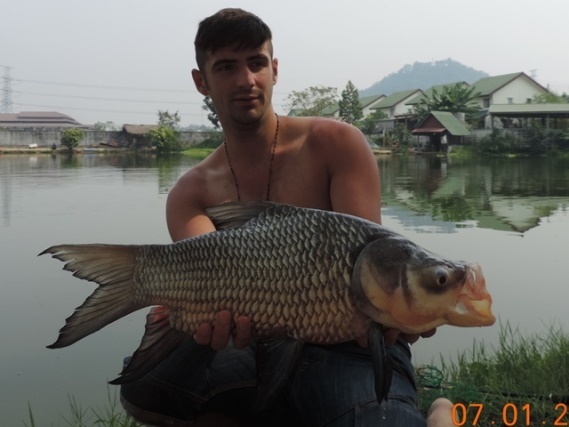 He then followed this up by catching a pb Siamese carp as well as Mekong and big-Y catfish. 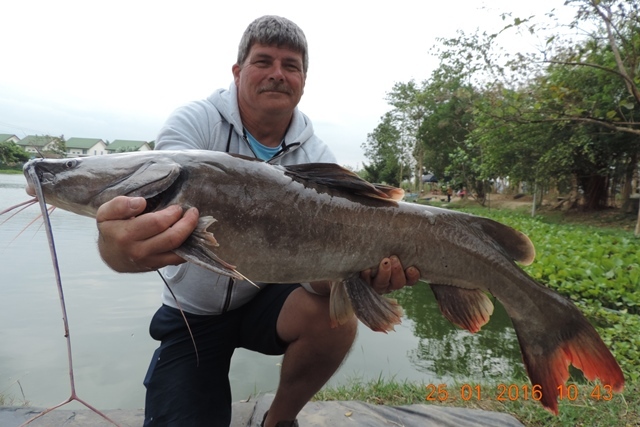 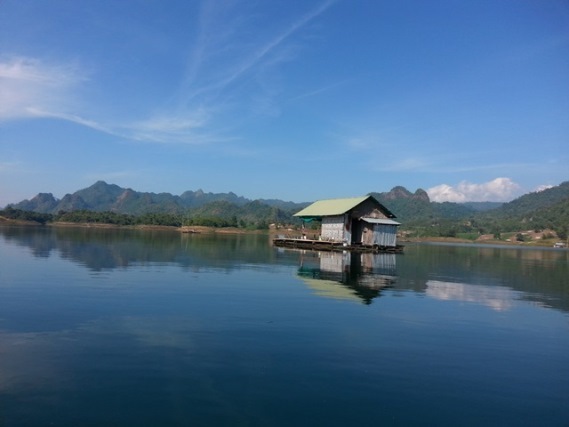 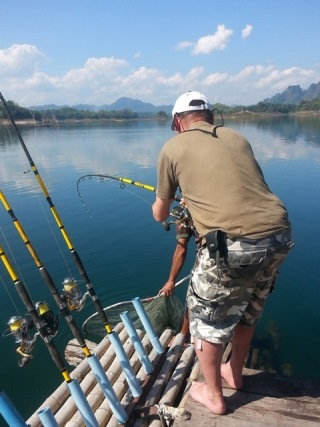 Alan Powell and his fishing mate Andy had a quick session at Palm Tree before heading up to Khao Laem Dam with Alan after a two hour battle successfully landing a giant Mekong catfish and in the process joining the Palm Tree Lagoon 300lb Catfish Club. 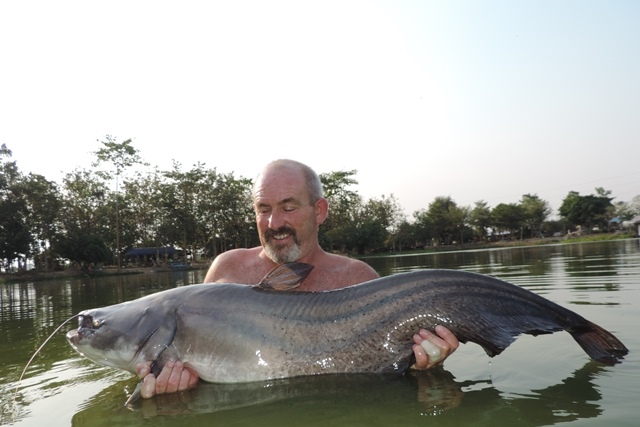 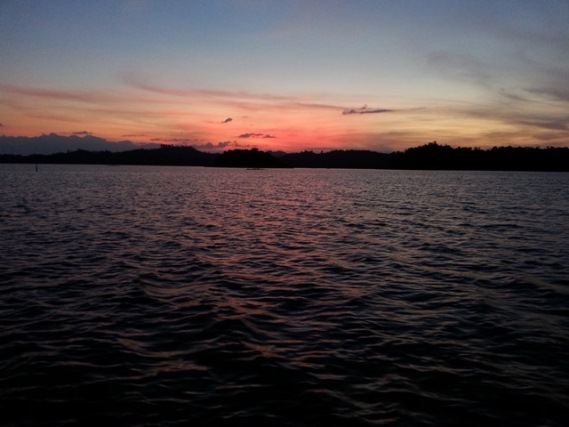 They also caught more Mekong, mollycot, striped catfish and Amazon redtail. 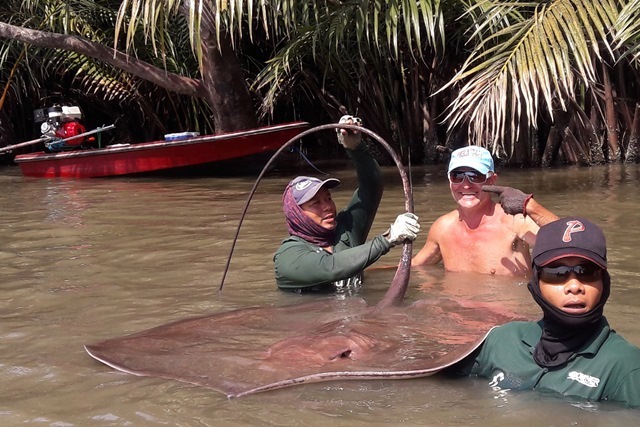 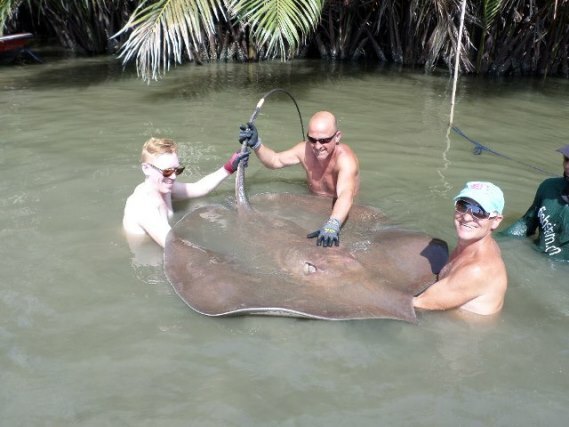 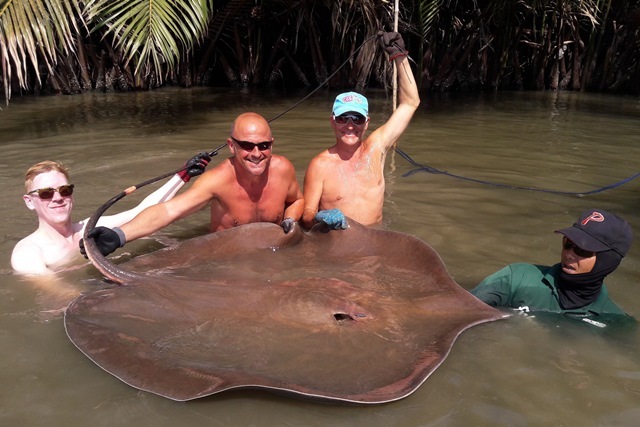 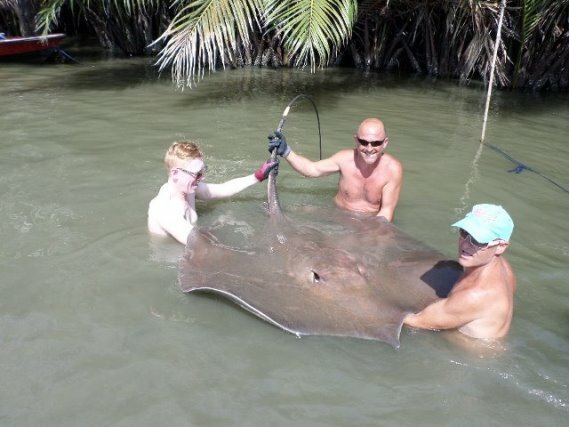 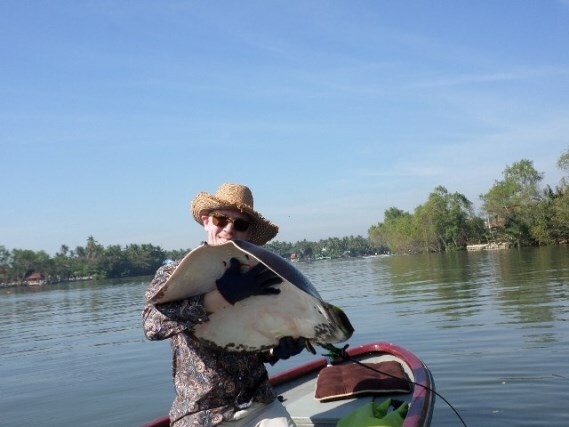 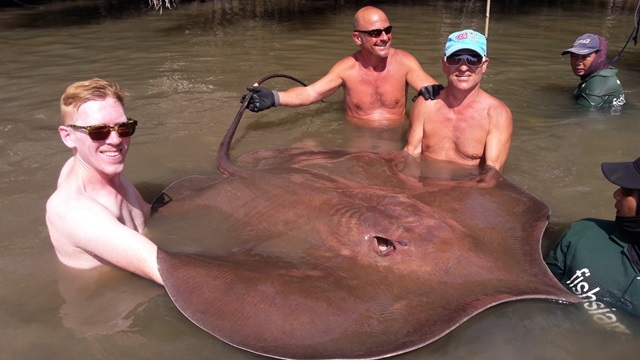 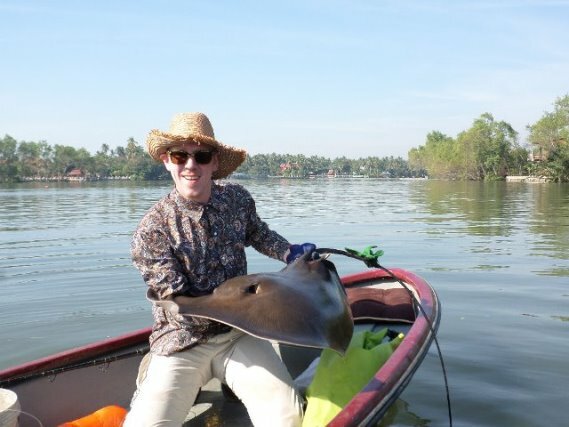 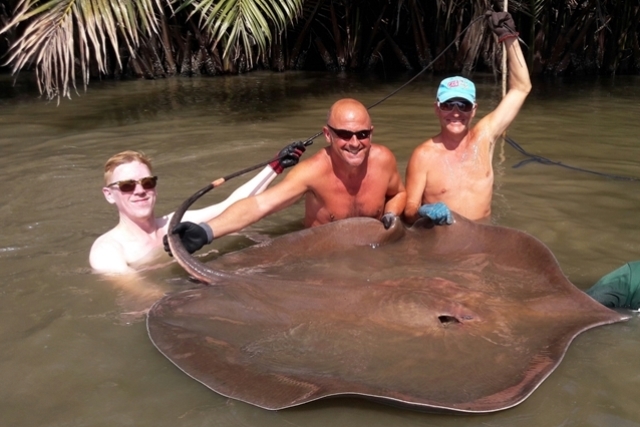 David Gordon and his two fishing mates Kevin Dickenson and Sebatian Furnrohr then decided to try there hand at stingray fishing on the nearby Mae Klong River. 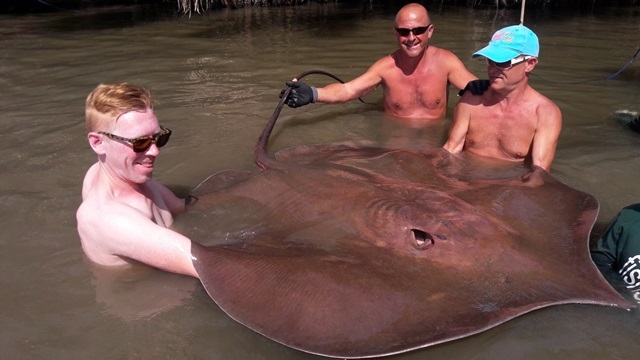 It wasn't long before they hooked into a decent sized stingray with Kevin doing most of the work before handing over to Sebastian to finish off the battle with the river monster. 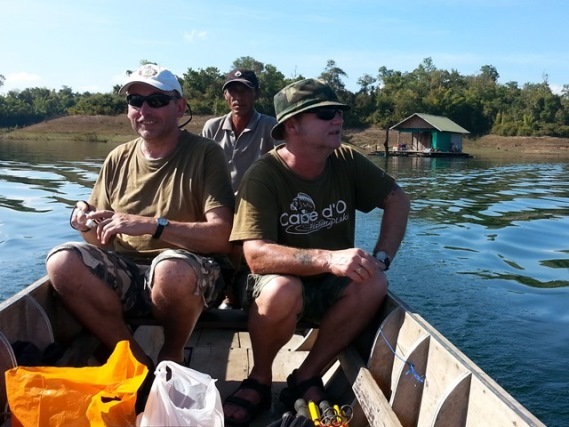 Jim Walters, James Osbourne and William George Hildreth also had their first session at Palm Tree during the month. 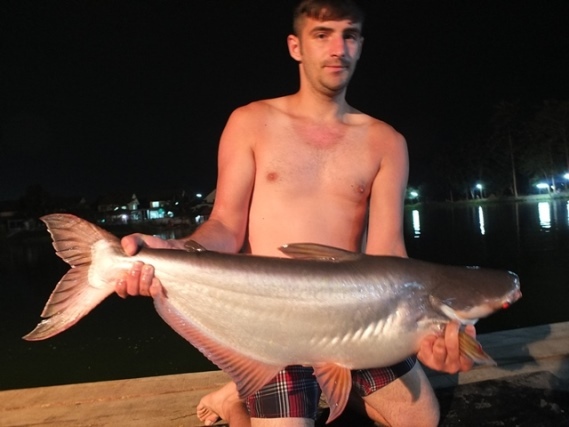 The catch of the session was an awesome alligator gar, they also had a number of other great catches that included albino striped catfish, rohu, Mekong catfish, big_Y catfish, catfish shark, striped catfish as well as both Asian and Amazon redtails. 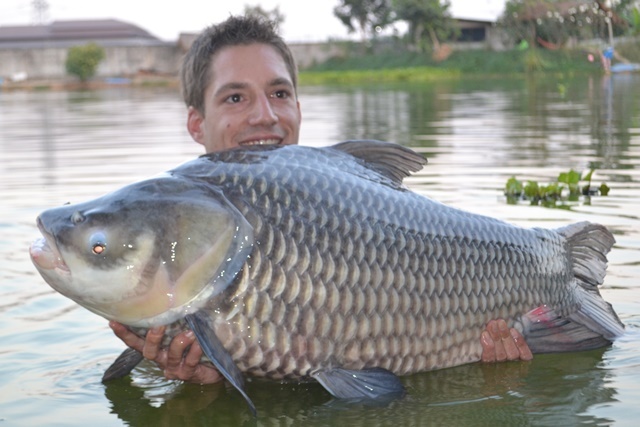 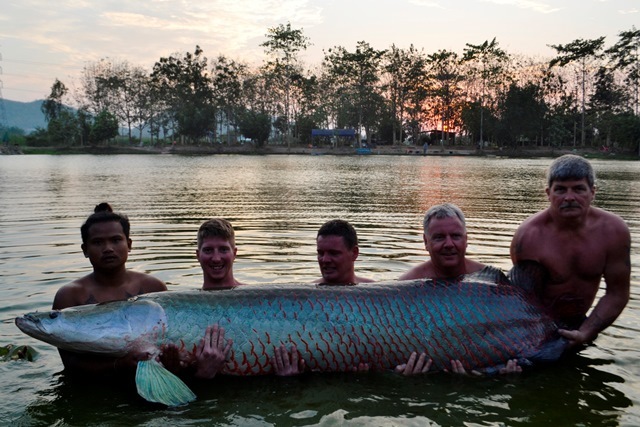 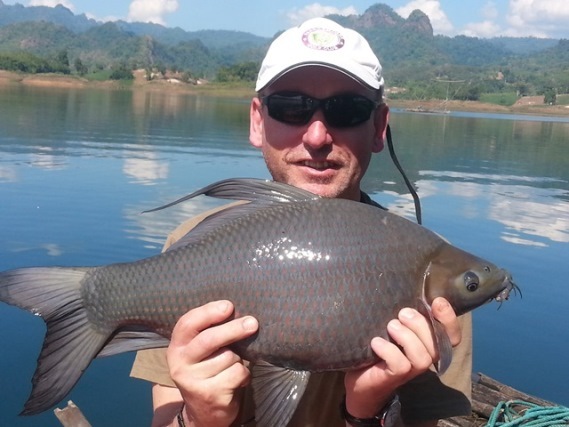 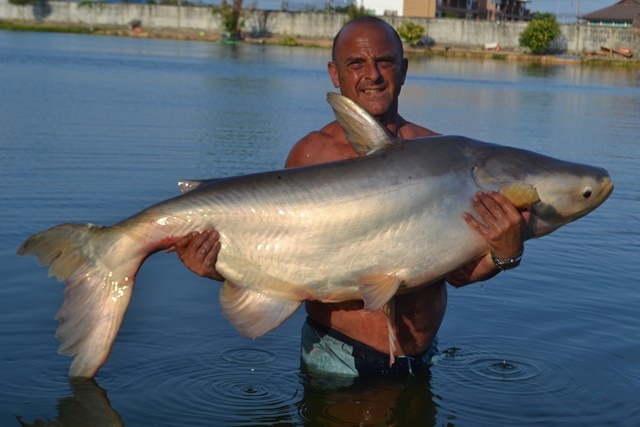 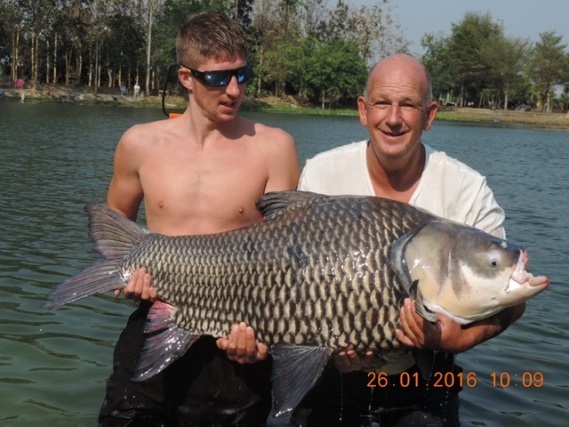 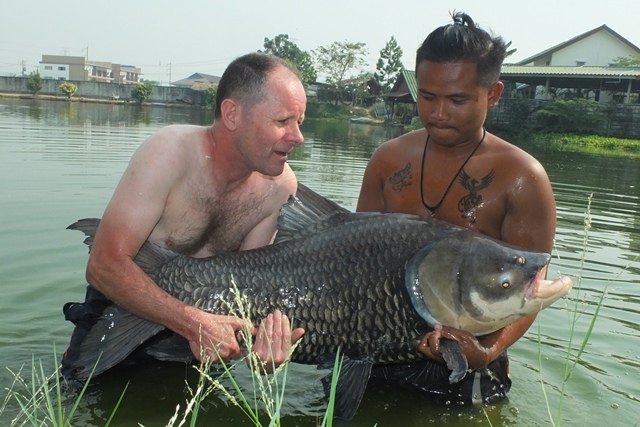 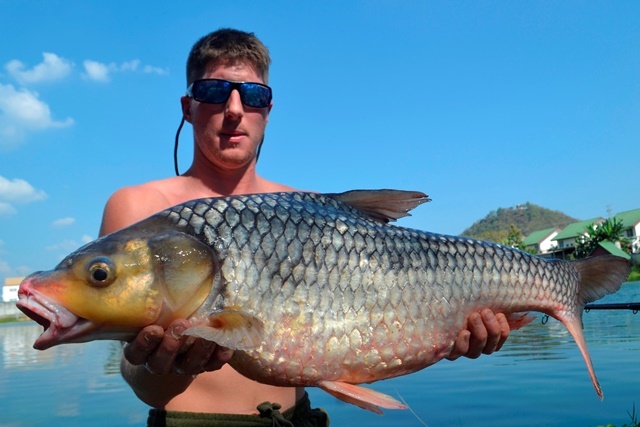 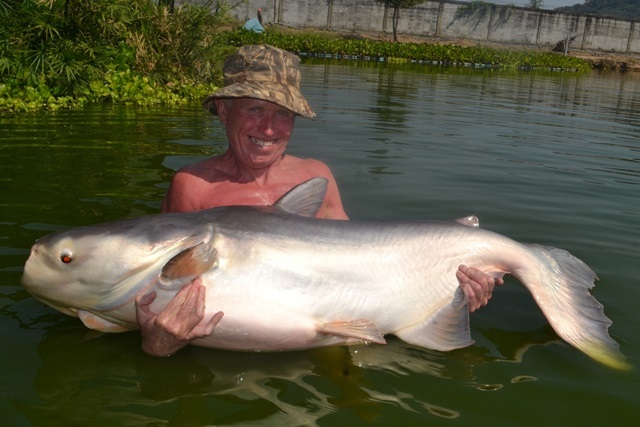 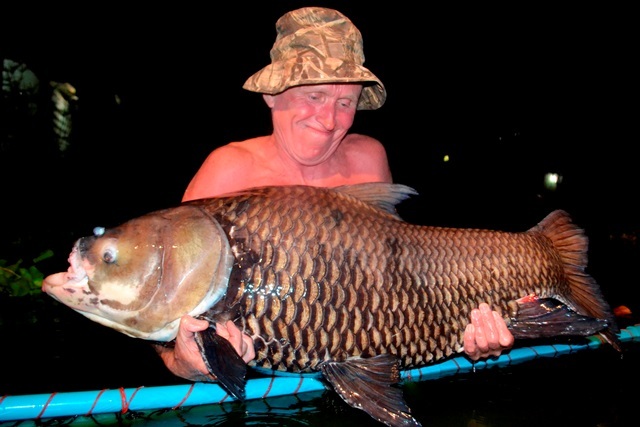 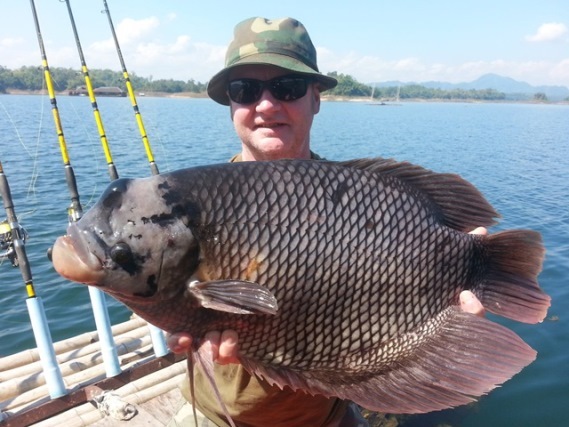 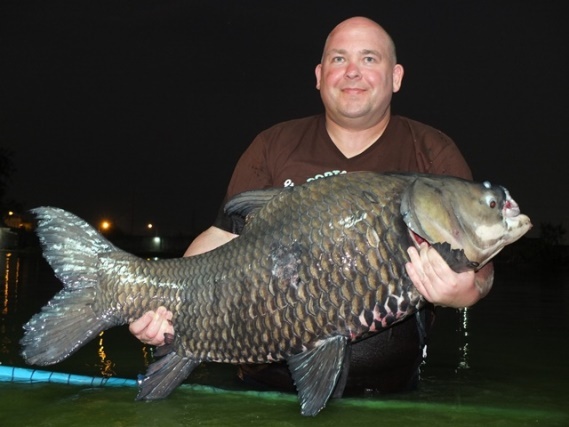 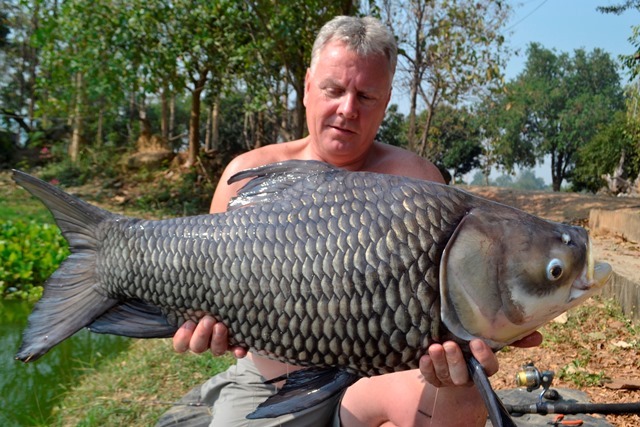 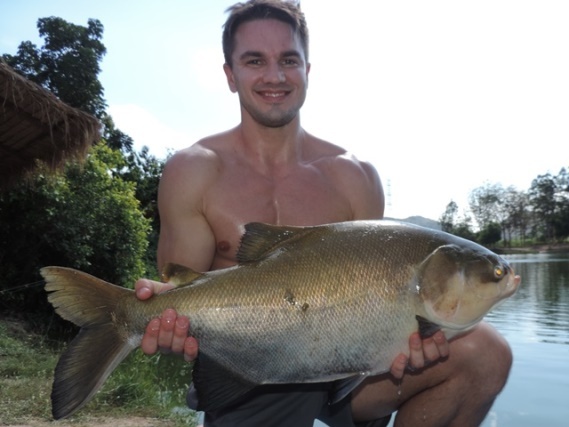 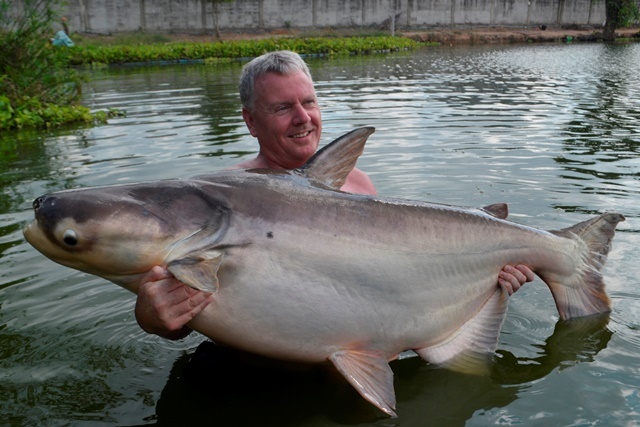 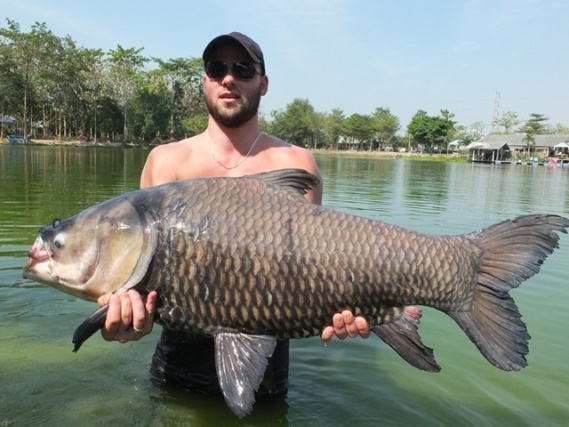 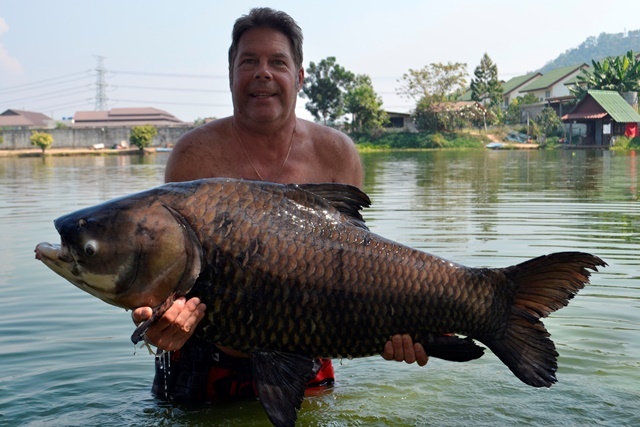 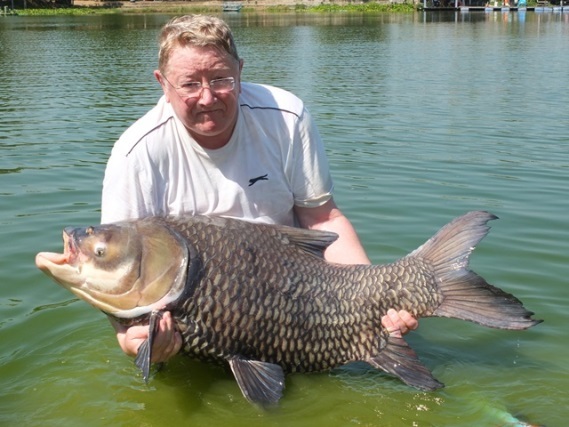 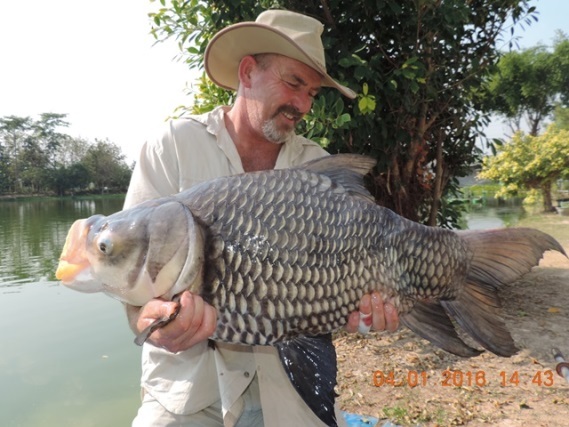 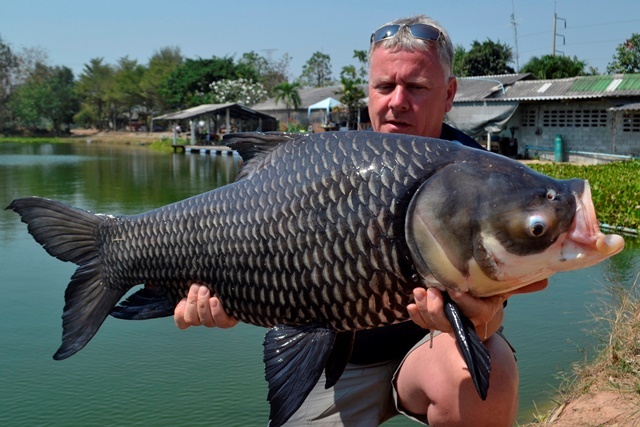 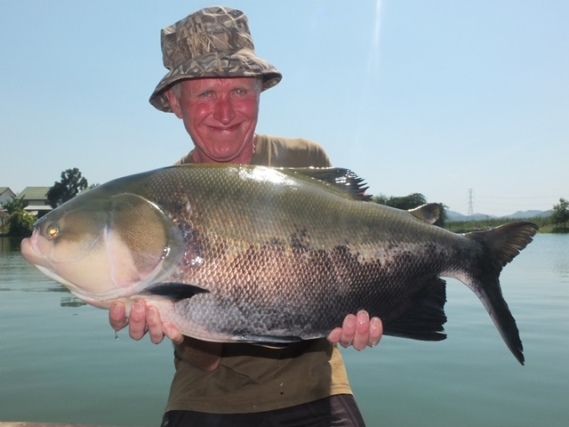 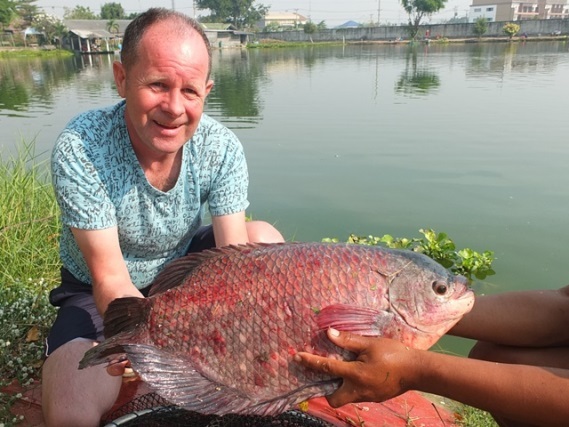 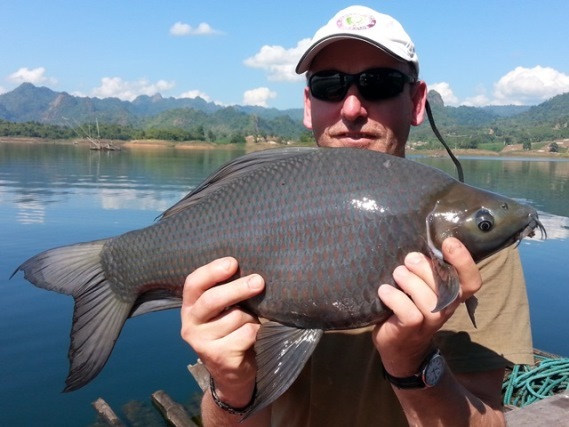 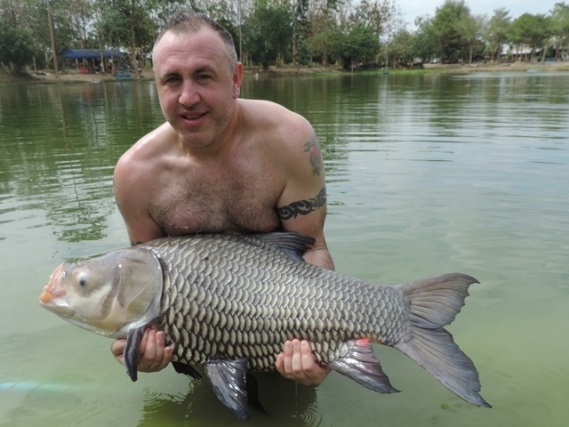 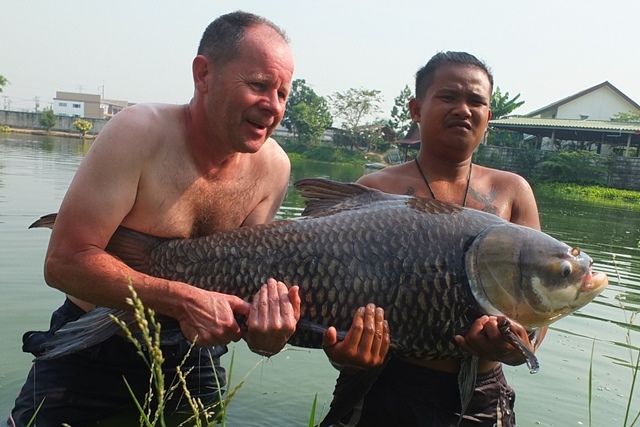 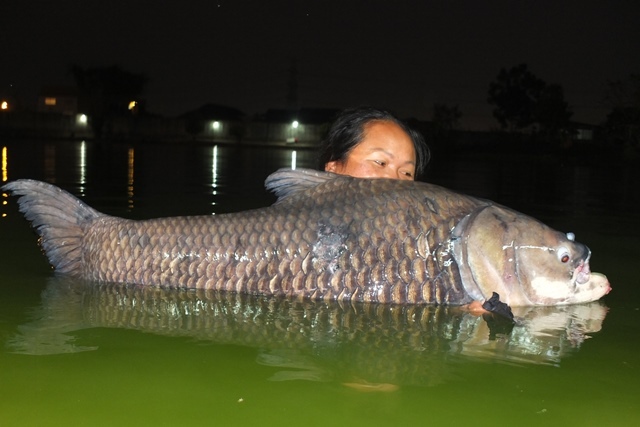 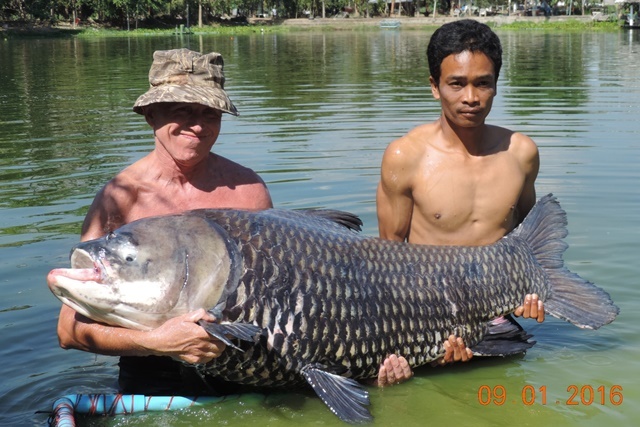 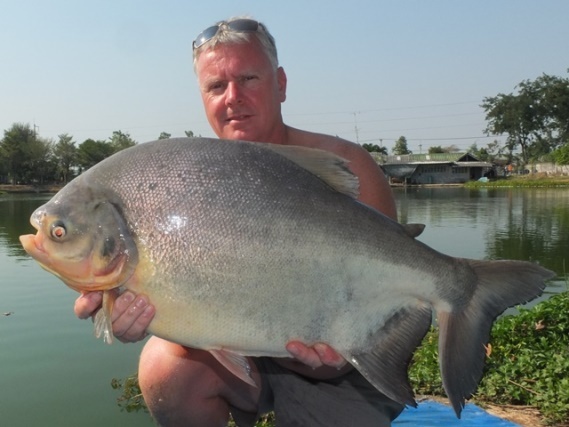 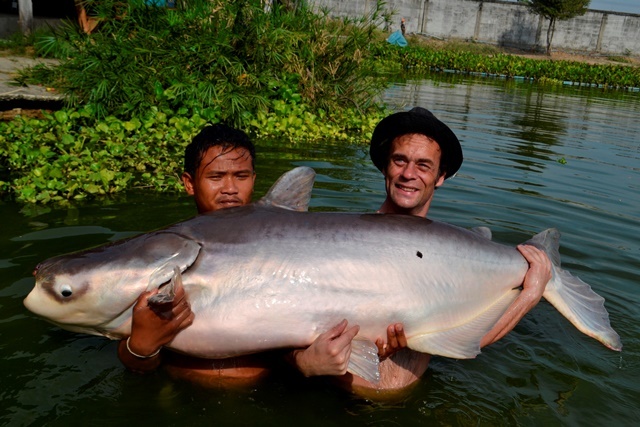 John Deakin finally caught a Siamese carp over 100lb as well as catching a parapatinga a new species for him. 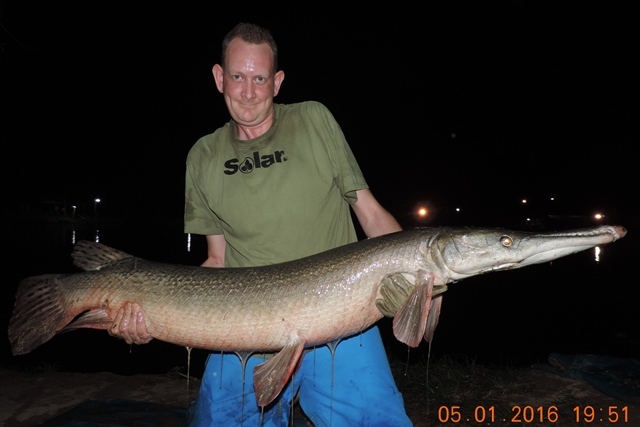 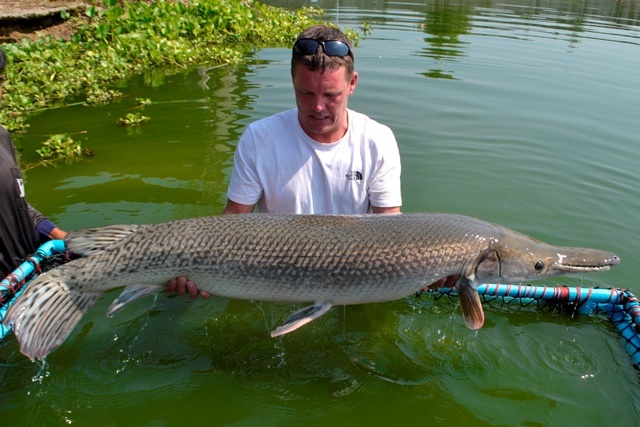 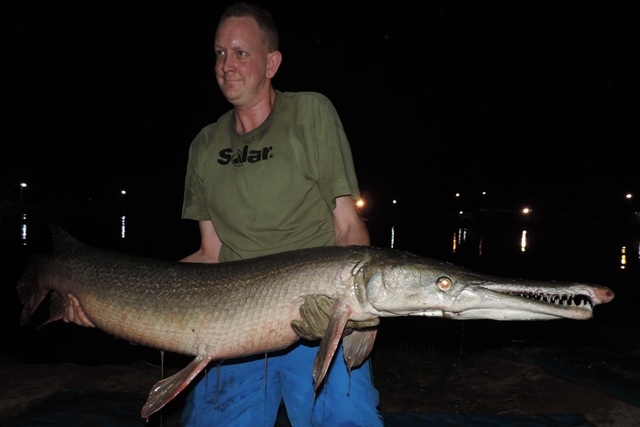 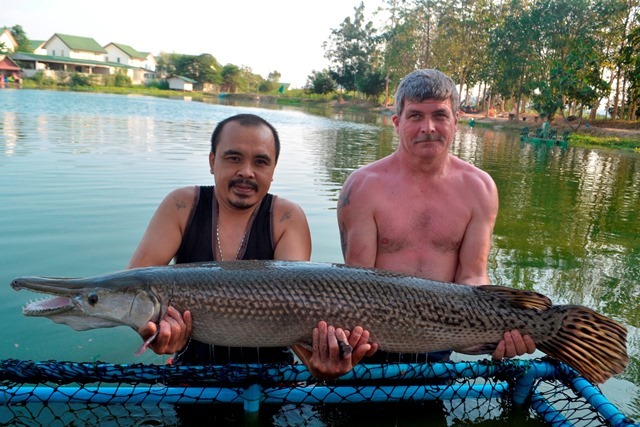 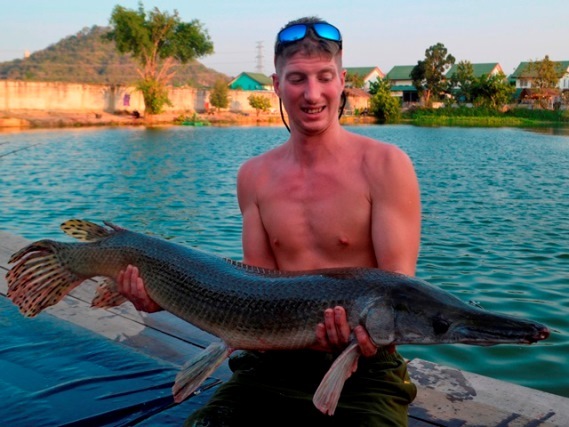 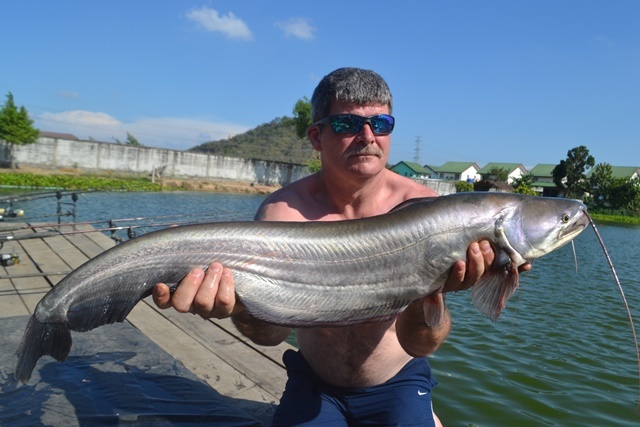 Anthony Norton managed to squeeze in another session before returning to the UK, this time catching a fabulous alligator gar as well as both Thai and Amazon redtails. 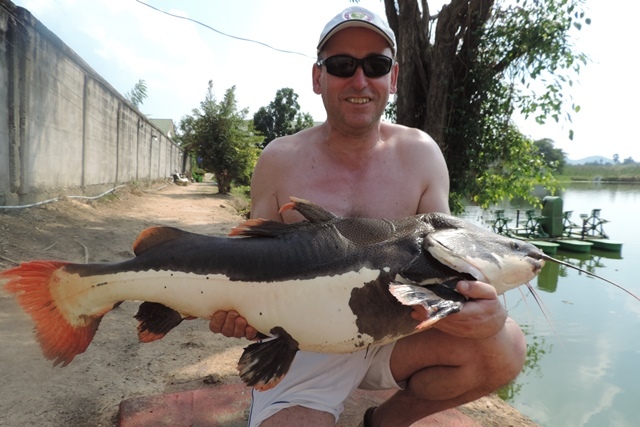 Ian Smith returned this time accompanied by Blip Smith, the later joining the ever expanding Palm Tree Lagoon 300lb Catfish club with an awesome Mekong. 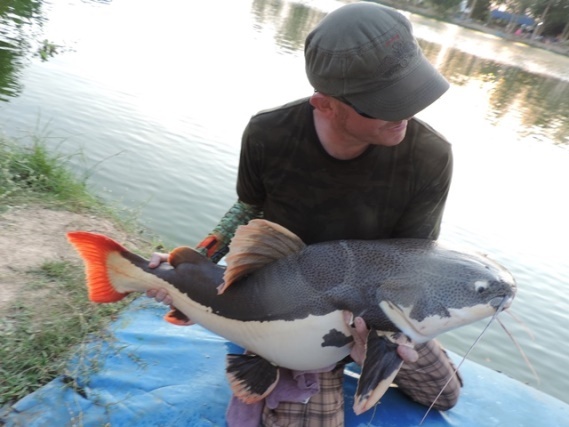 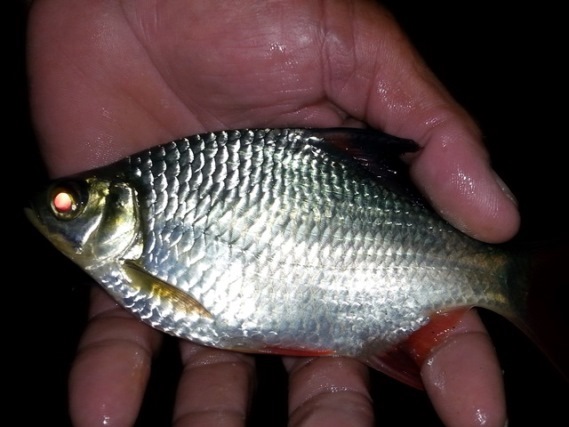 They also caught other big Mekong as well as Amazon redtails. 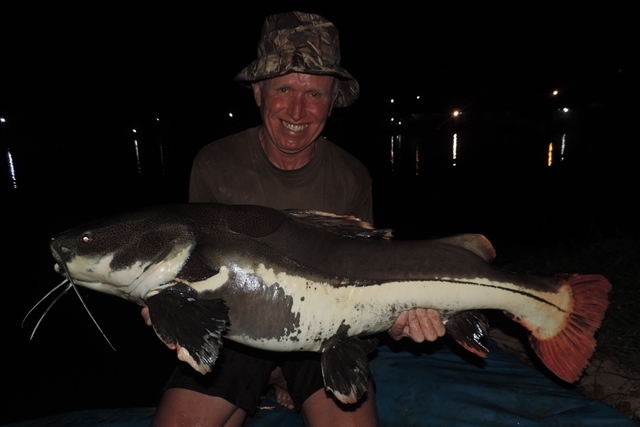 David Gordon and his two fishing mates Kevin Dickinson and Sebastian Furnrohr were back and although the fishing was hard still managed to catch a number of good Mekong catfish as well as Amazon redtail, big-Y catfish and striped catfish. 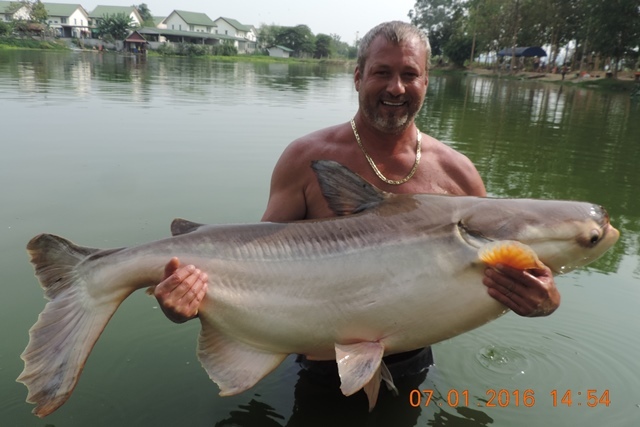 Bob Nichols caught some nice fish that included giant featherback, yellow catfish, catfish shark, Mekong catfish and Amazon redtail. 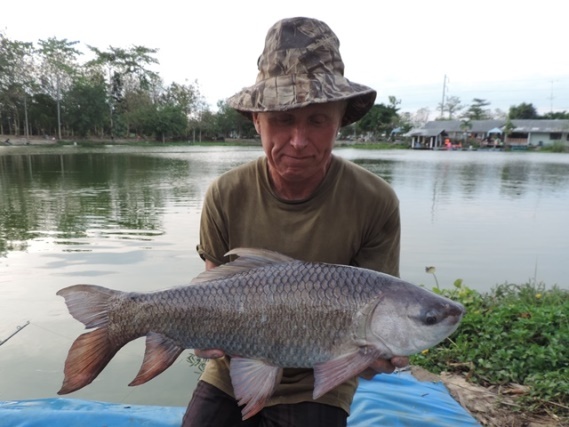 Robert Butler returned for his bi-annual session only a short one this time but he still managed to catch a good sized Siamese carp and a nice Mekong catfish. 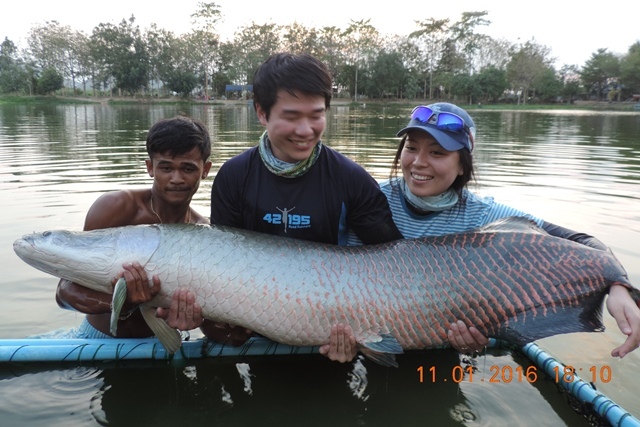 A couple of Japanese anglers were more than happy with their catches of arapaima and Amazon redtails. 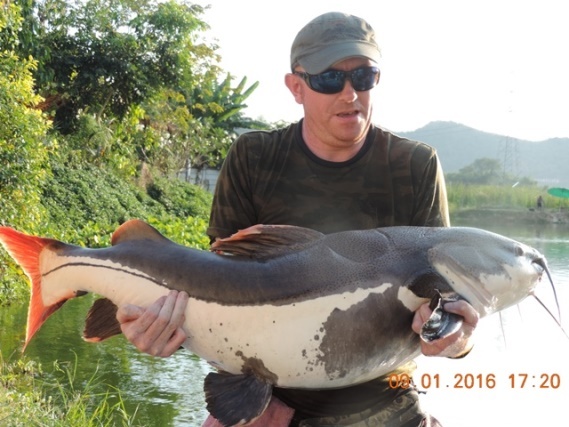 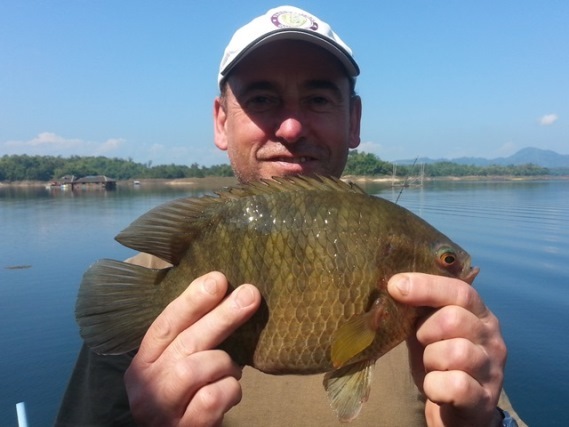 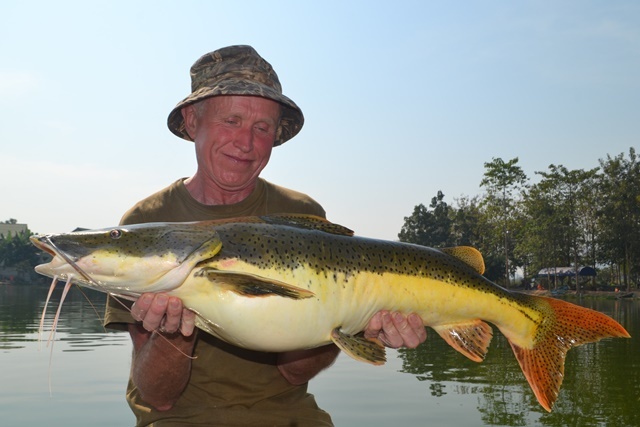 Neil Thompson and his mate returned for another session and in tough fishing conditions caught Mekong catfish, Amazon redtail and Tambaqui. 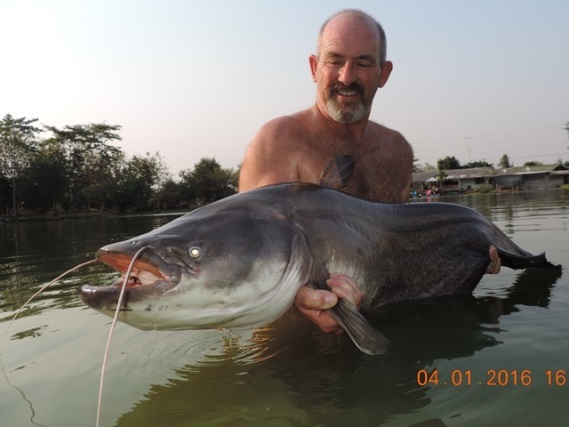 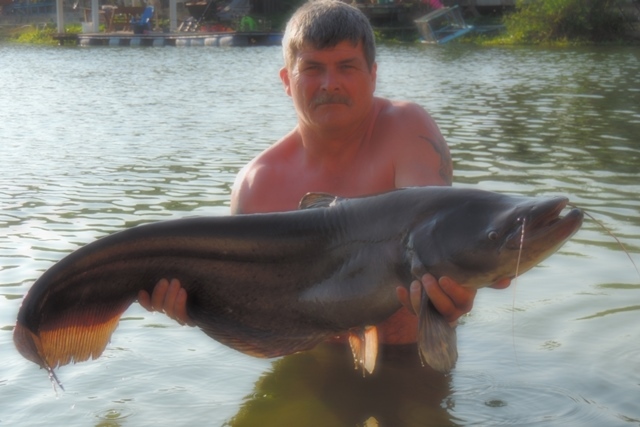 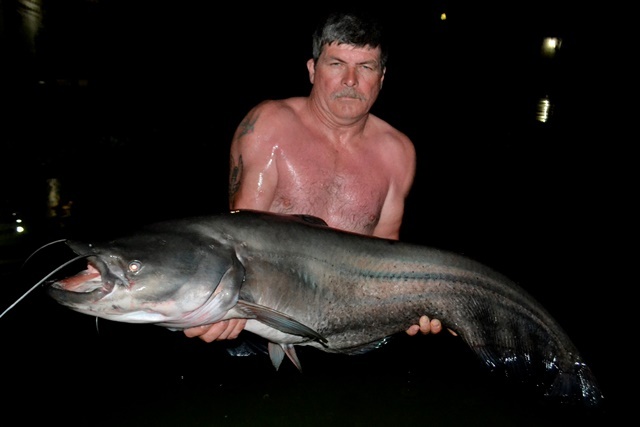 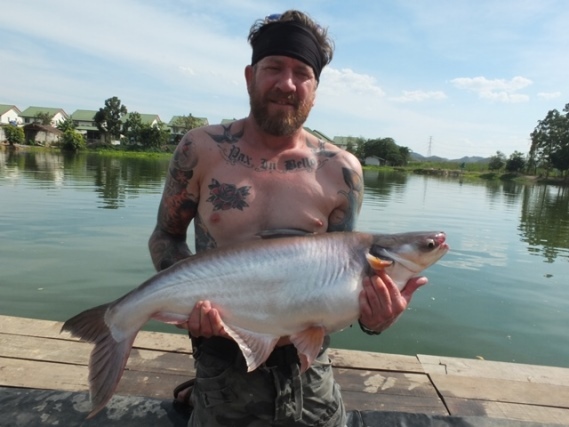 Another angler that the redtails didn't want to party for was American angler Keith Kennedy, but he did catch a number of Mekong catfish, mollycot and a nice tiger catfish. 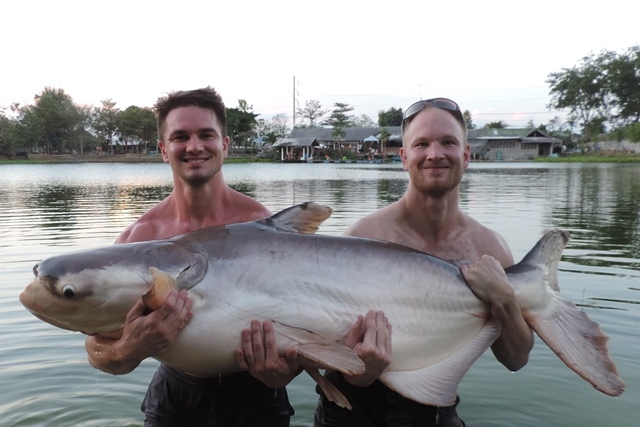 Danish angler Morten Fisker Juul and his angling buddy looked happy with there catch of Mekong catfish, and a number of both Asian and Amazon redtails. 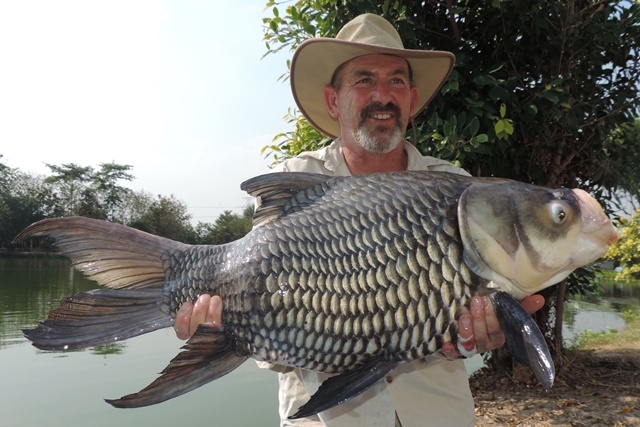 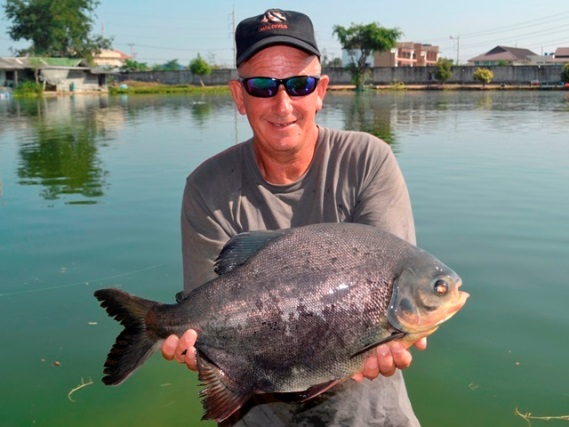 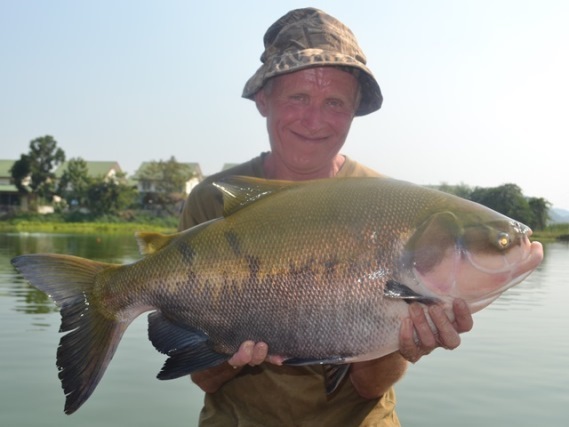 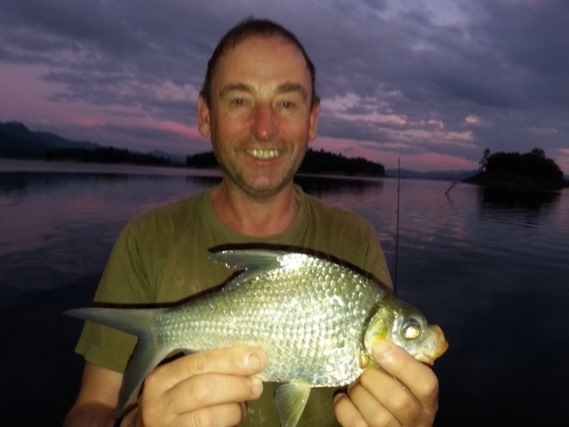 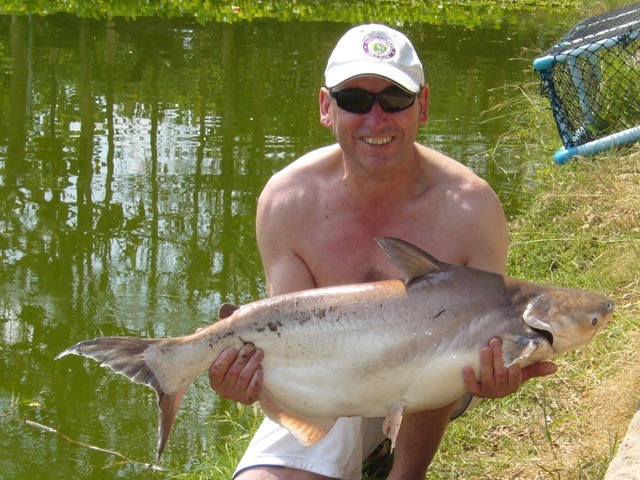 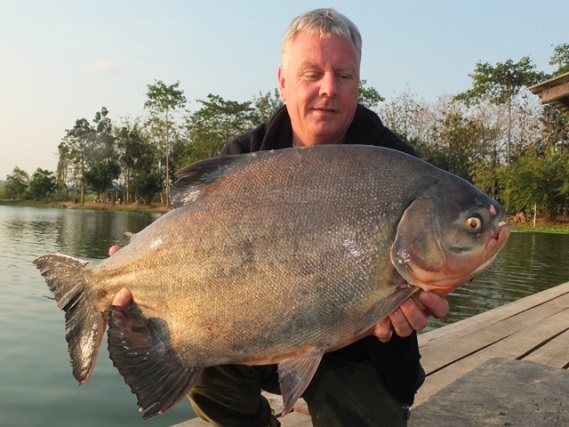 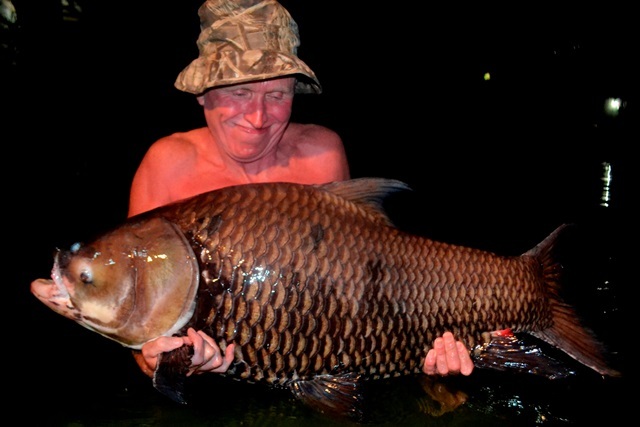 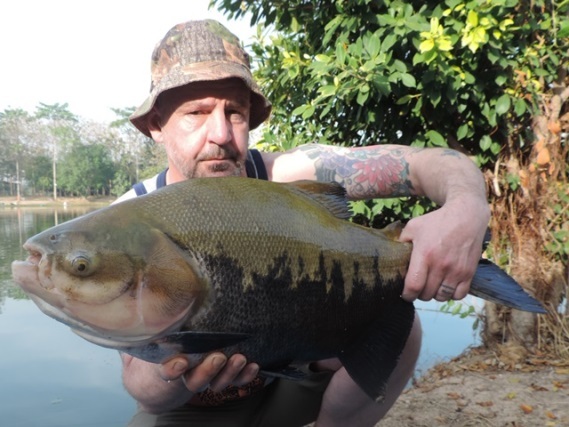 Trevor Chaplin Smith was another angler who promised to be back next year after catching a number of nice fish that included Siamese carp, Mekong catfish, striped catfish, mollycot and an albino chao phraya, but didn't manage to catch the Amazon redtail that he wanted. 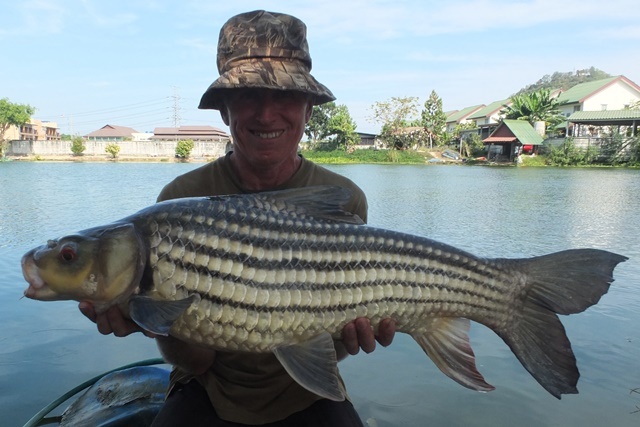 It was definitely a Mekong day for Tap of Bangkok Fishing Guide Service second visit of the month. 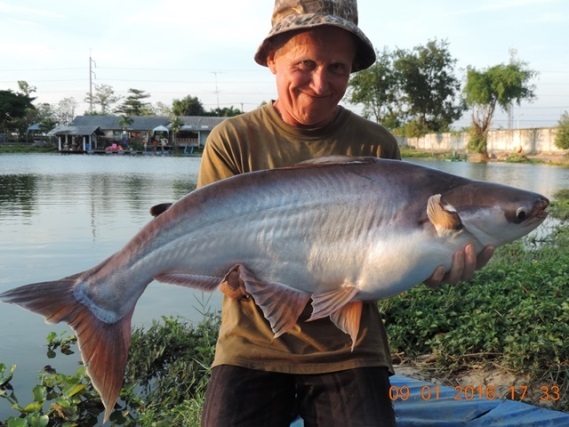 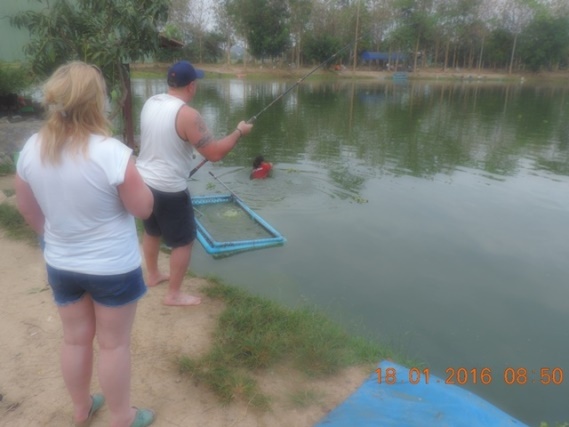 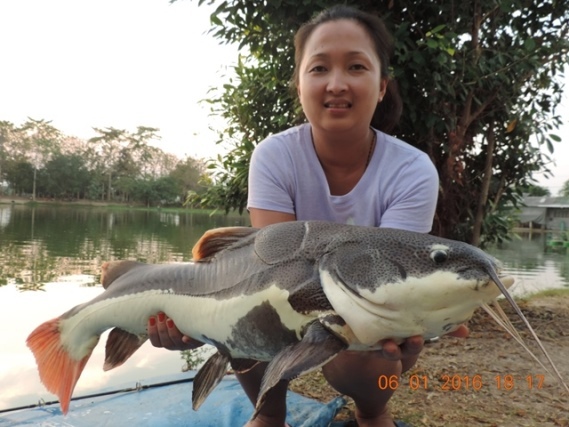 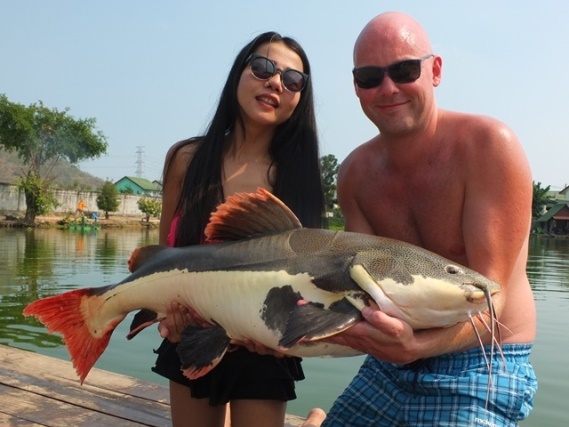 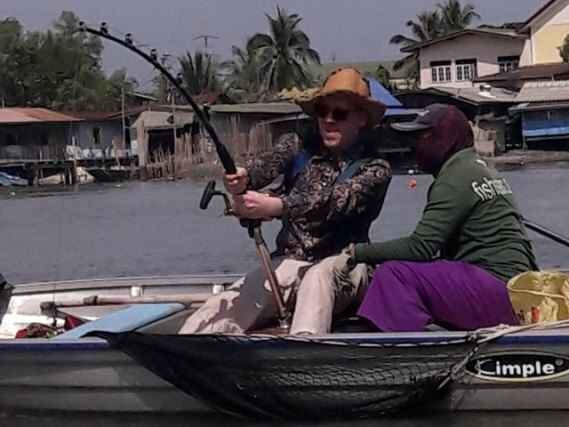 Robert Pollock and his wife from Hong Kong had an enjoyable session catching Siamese carp, Mekong catfish, striped catfish, wallago attu and a number of Amazon redtails. 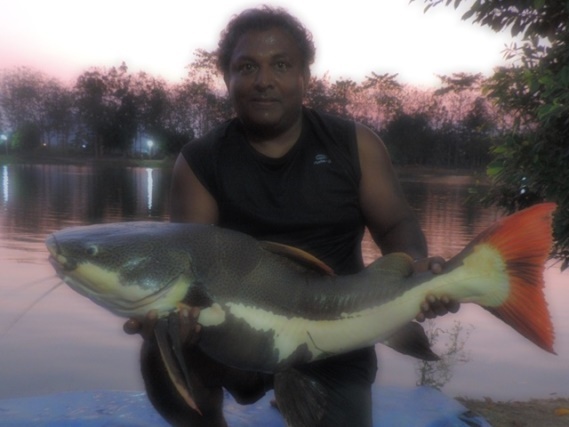 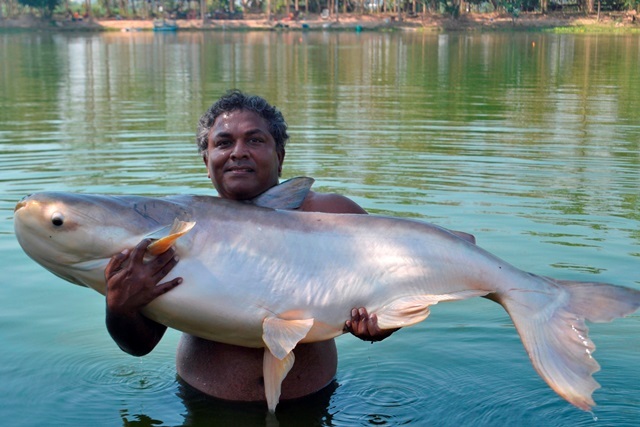 Nelson Philips from India vowed to return after catching a Mekong catfish, wallago attu and both Asian and Amazon redtailed catfish. 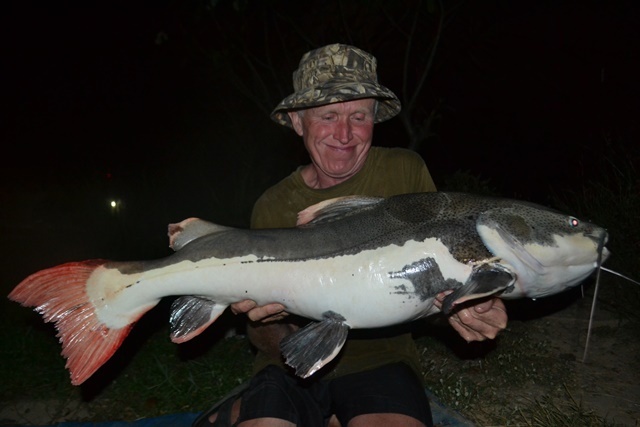 Peter Morris and his son William Peter Morris were back again after an absence of a whole week catching a good sized crystal eyed catfish as well as a superbly marked tiger catfish, Siamese carp and a number of Amazon redtails that included a double header. 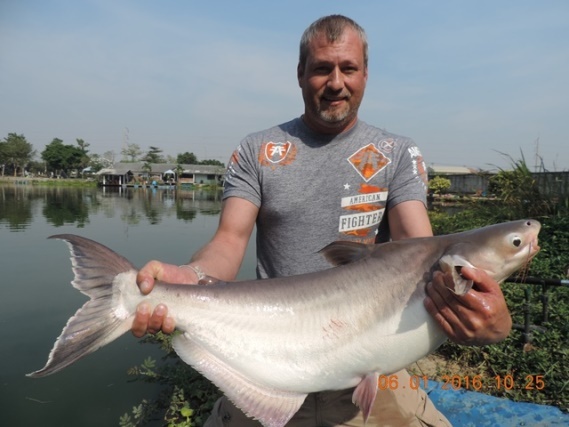 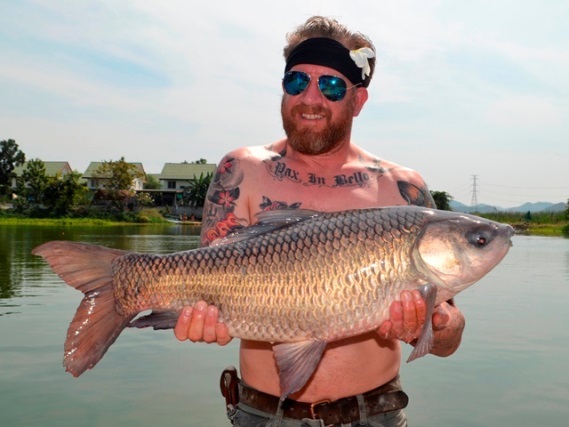 Swedish anglers Karl Narfstrom and his fishing buddy also enjoyed their first visit catching a number of good catches that included Mekong catfish, parapatinga, tambaqui, Siamese carp, striped catfish and a number of Amazon redtails. 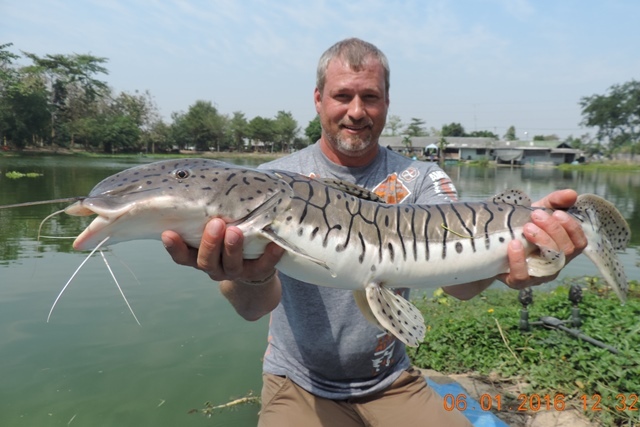 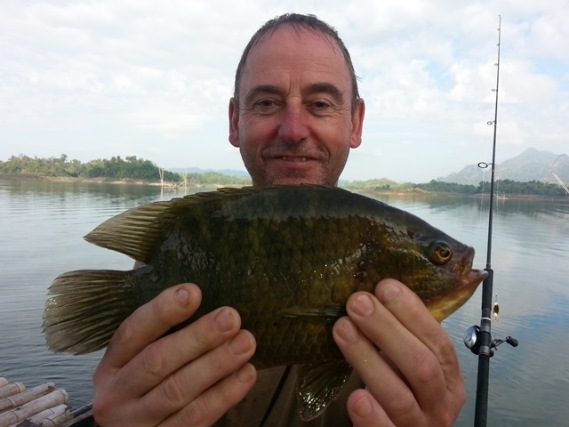 Derek John Mulvaney from Bangkok returned for another session and caught some awesome Amazon redtails as well as some good sized Mekong catfish. 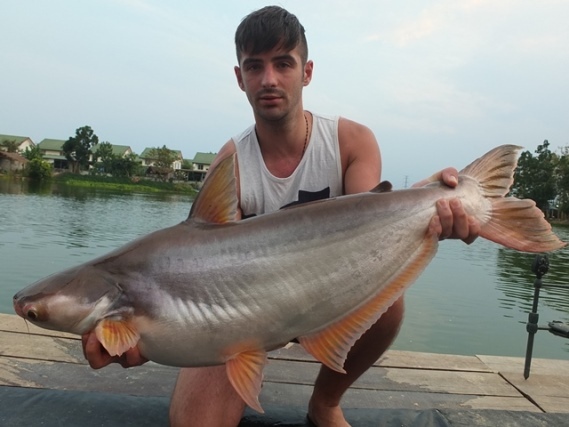 The guides also had a dabble during the month catching a number of Juliens golden price carp out of the Mae Klong river and relocating them to Palm Tree as well as catching alligator gar, Mekong catfish, big-Y catfish, Siamese care and a rare Salaween catfish. 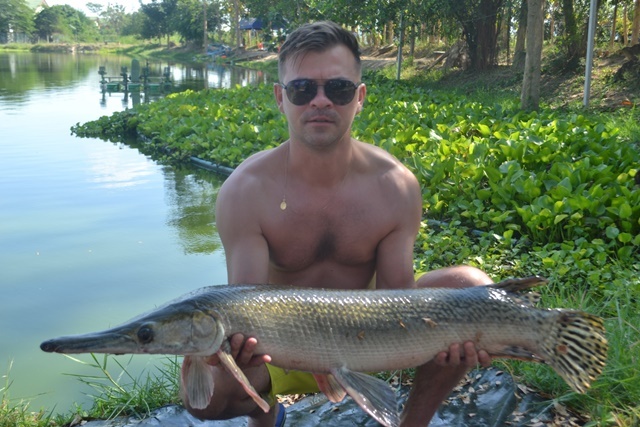 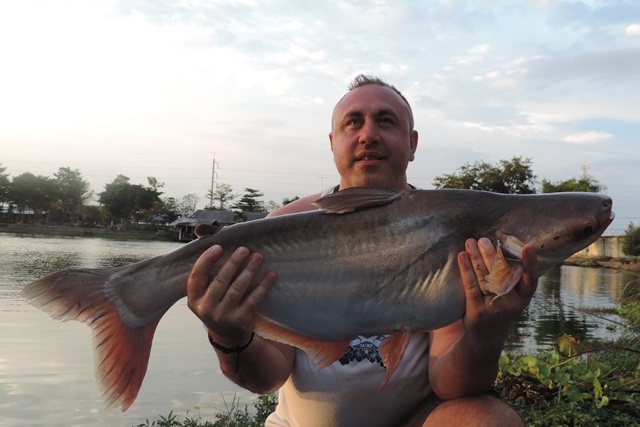 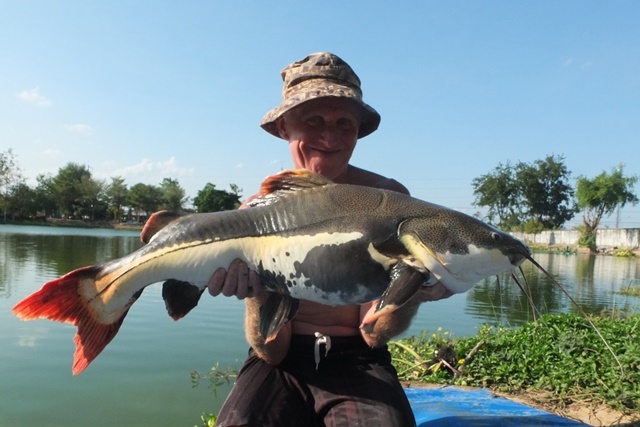 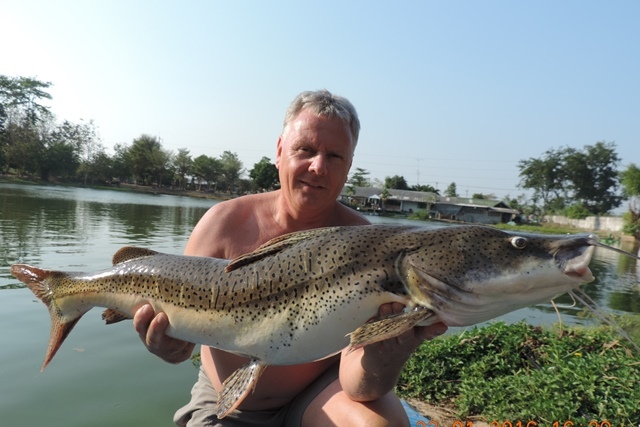 Another Polish customer of Fish Siam Thailand had an enjoyable day catching a very chunky Mekong catfish as well as Amazon redtail, Siamese carp and alligator gar. 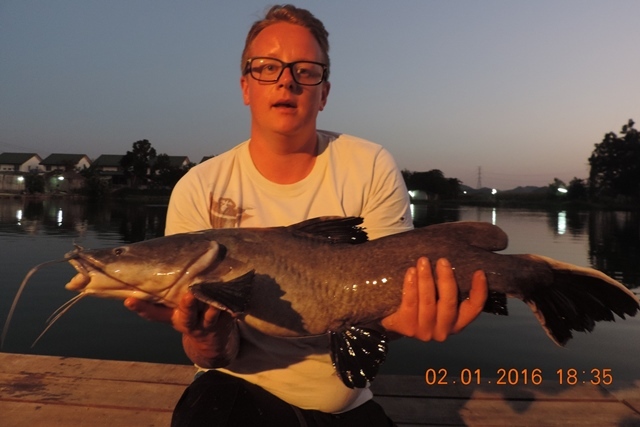 Chris Goude was another first timer during the month and after initially loosing a few redtail battles finally came out on top not only landing a few redtails but also catching rohu and striped catfish. 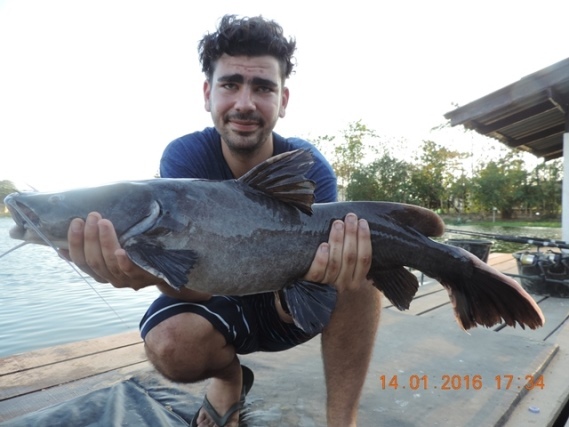 Philip Balante after a few problems finding his condo to pick him up from in the morning went on to catch a huge mollycot and a good sized giant featherback as well as some striped catfish. 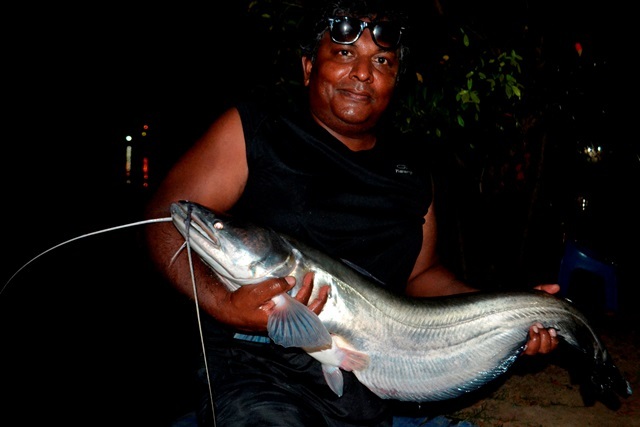 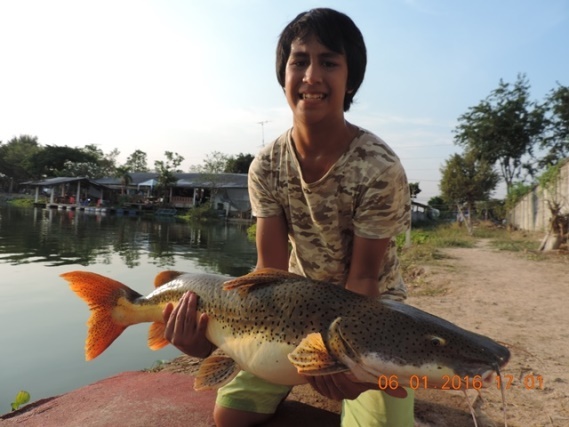 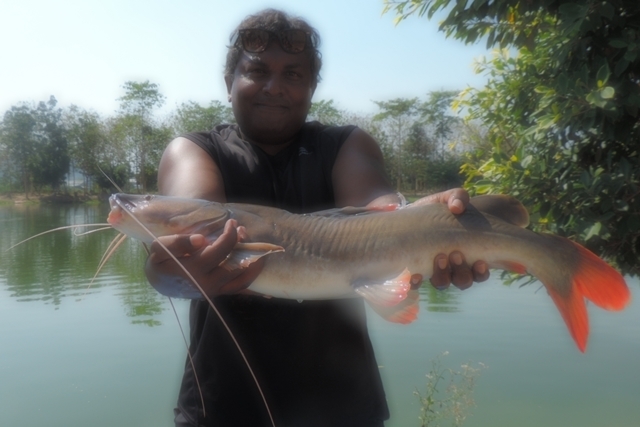 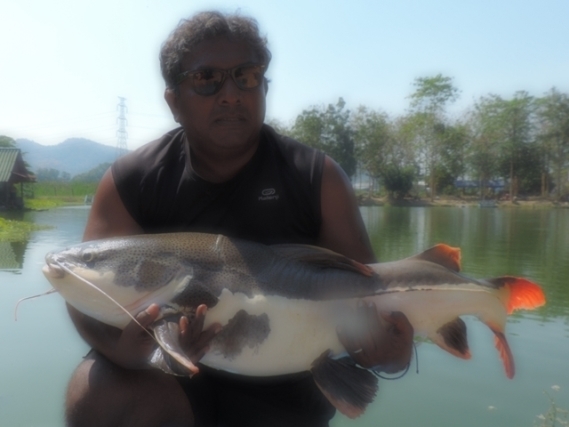 Vegas Apte was well pleased with a nice leopard catfish and a pb Mekong catfish. 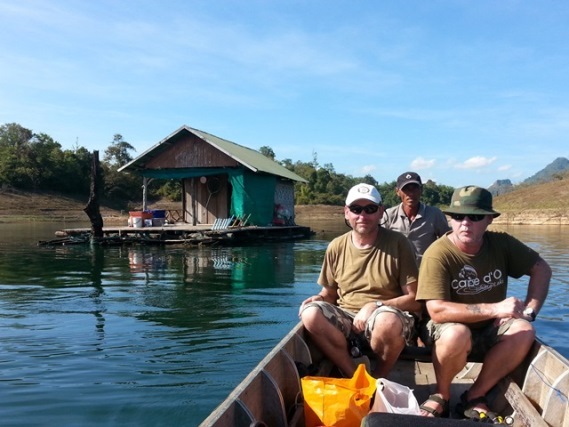 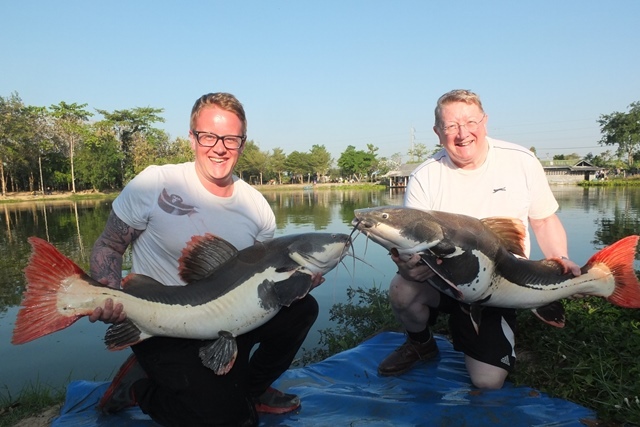 Robert Cooper and Ross James Wiggan made there inaugural visit to Palm Tree during the month catching Mekong catfish as well as both Thai and Amazon redtails. 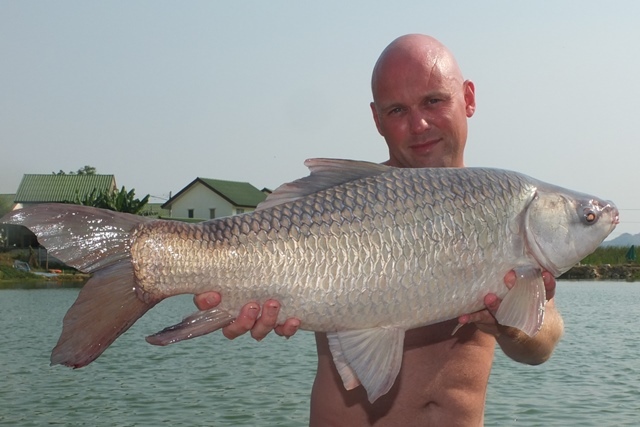 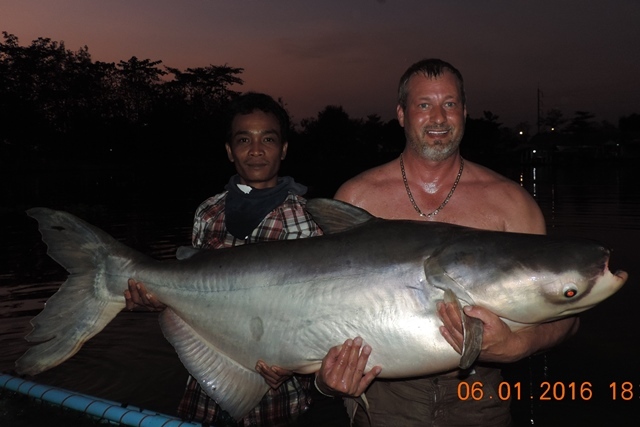 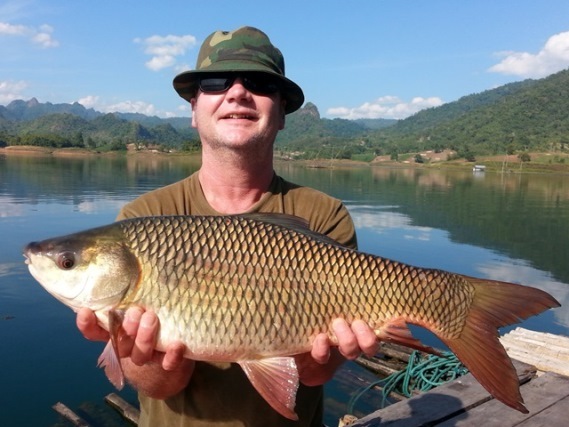 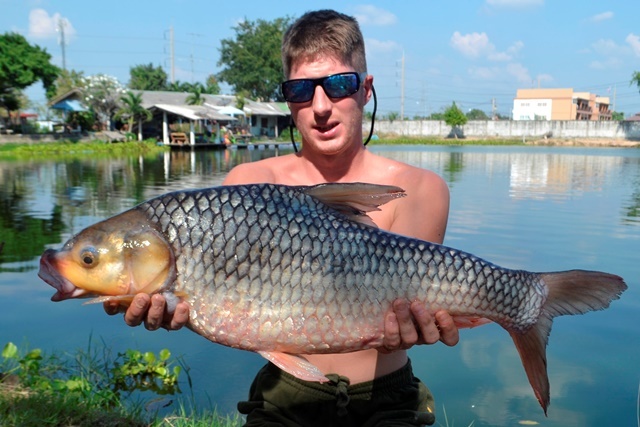 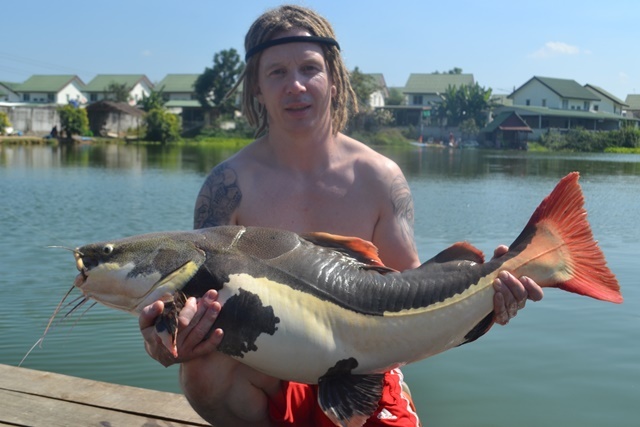 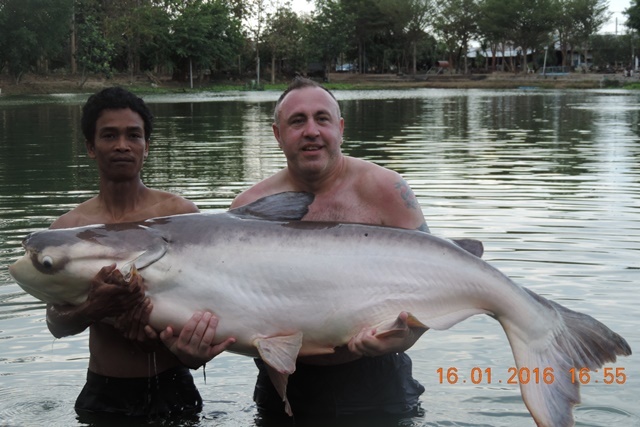 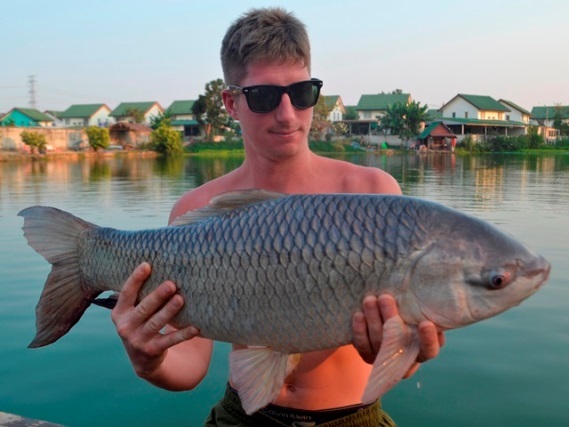 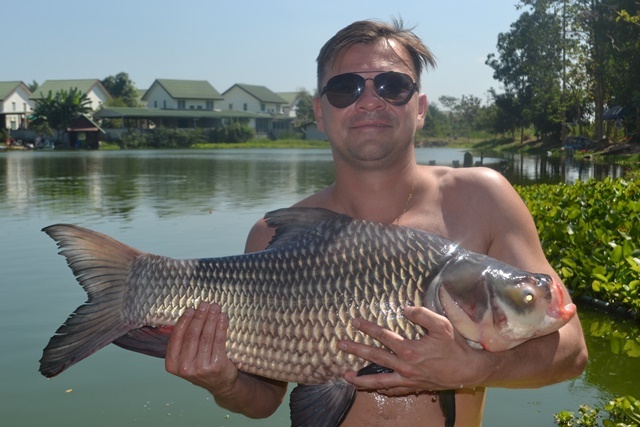 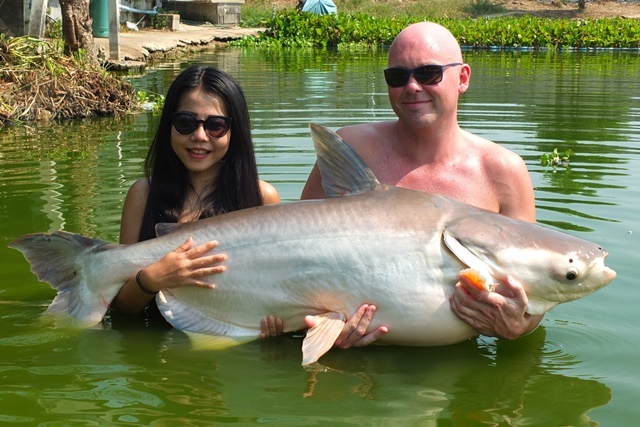 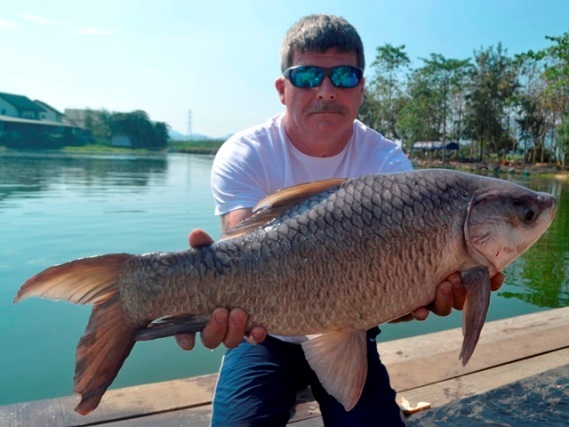 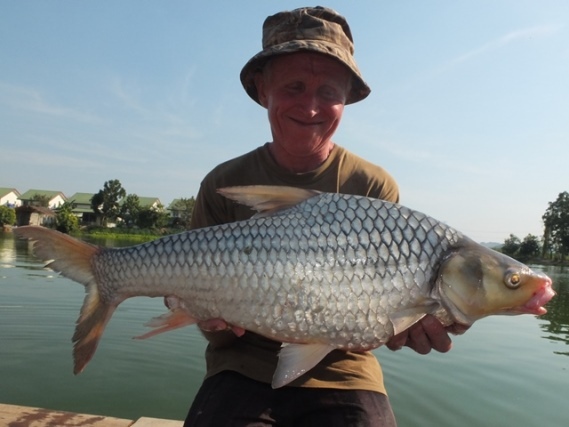 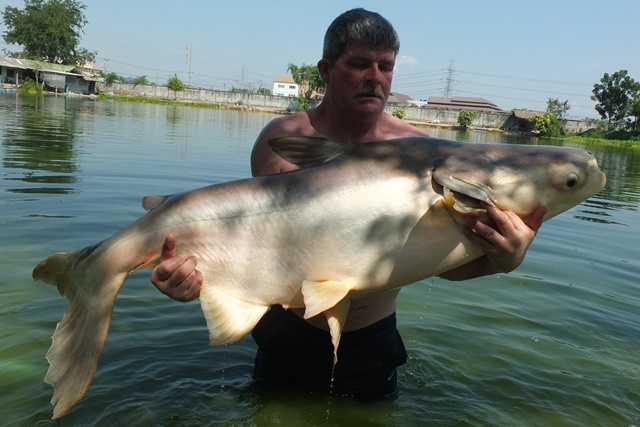 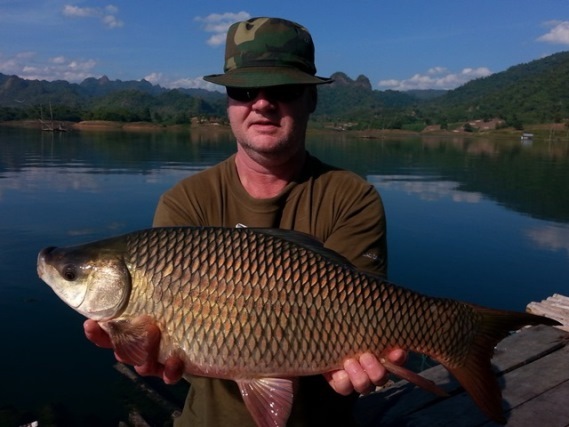 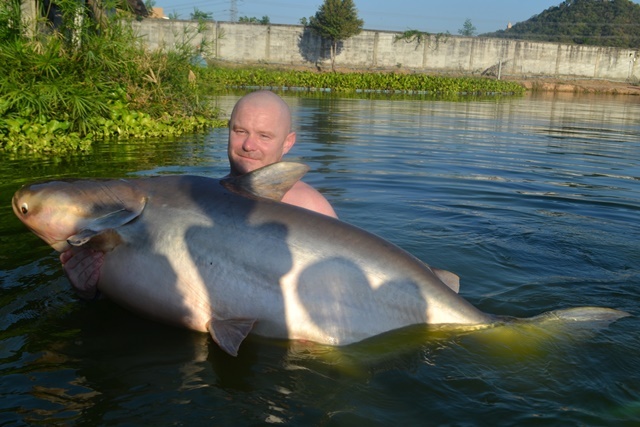 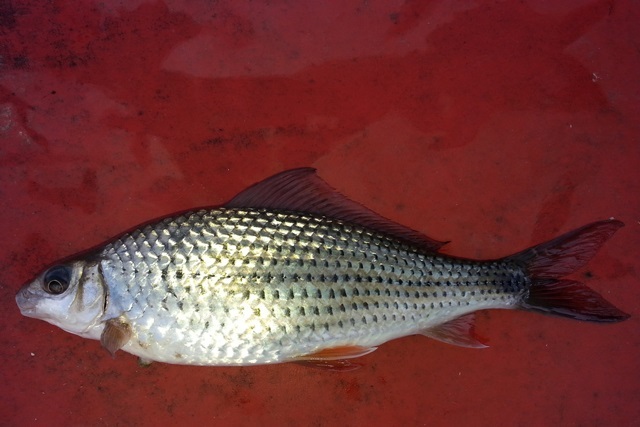 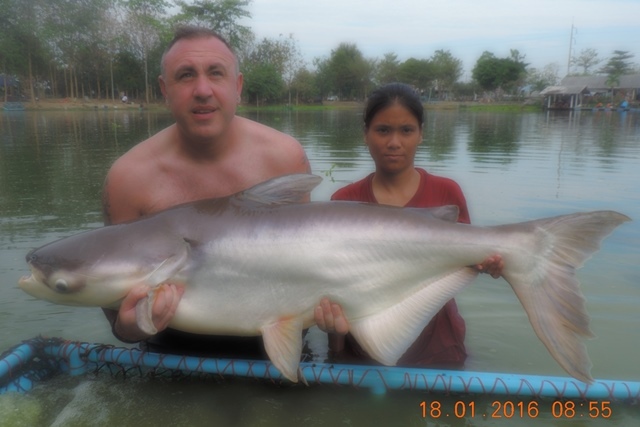 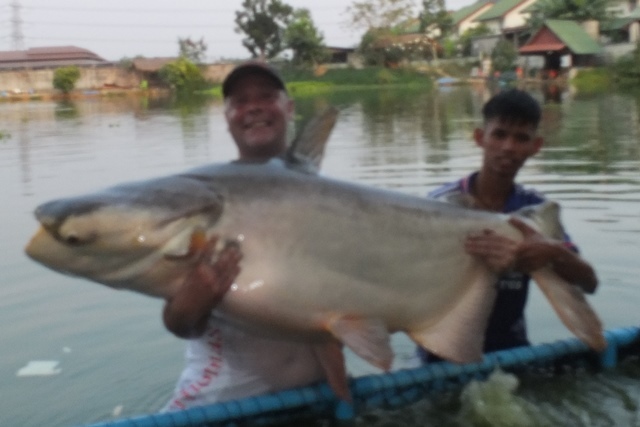 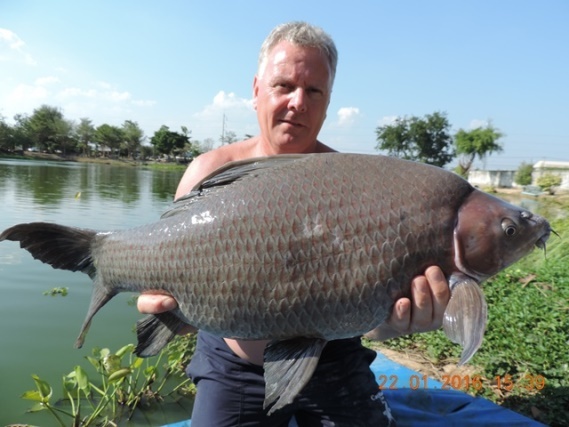 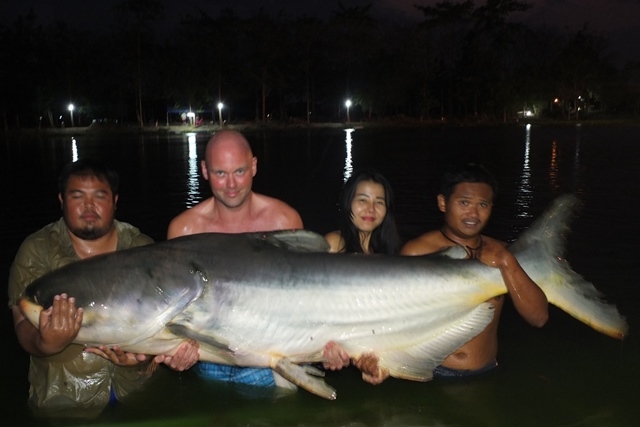 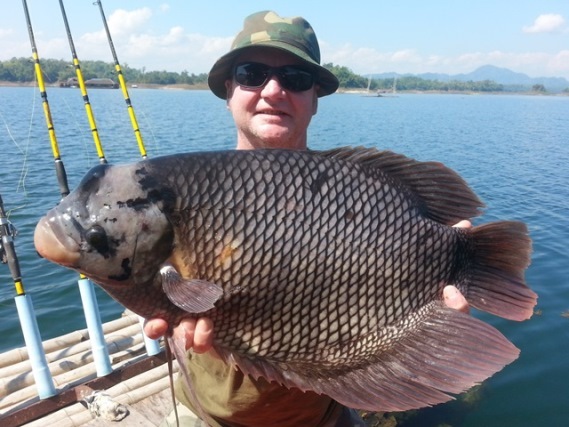 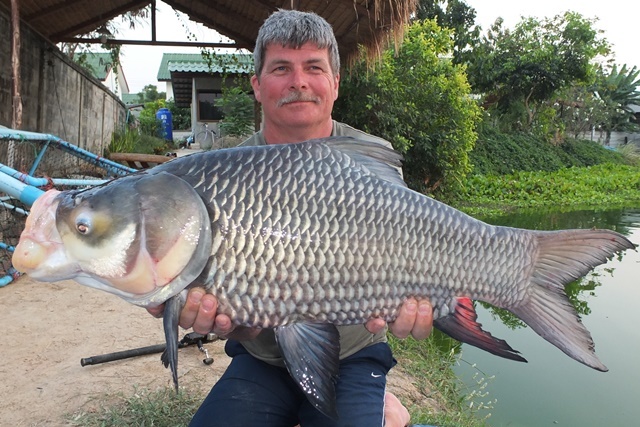 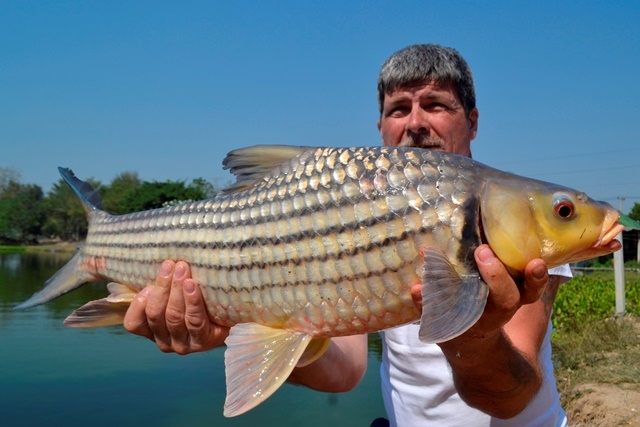 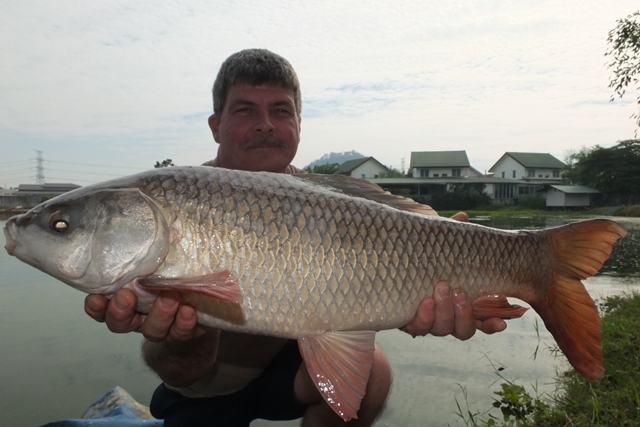 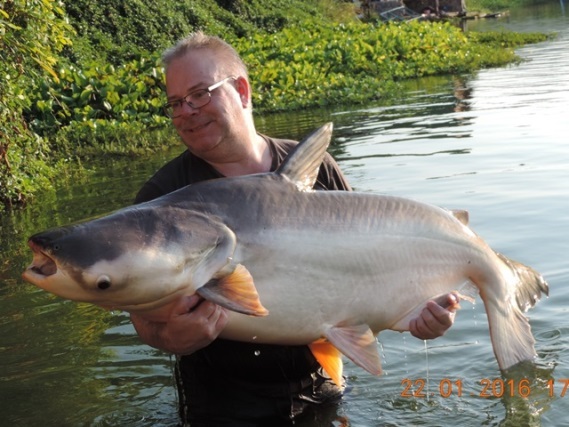 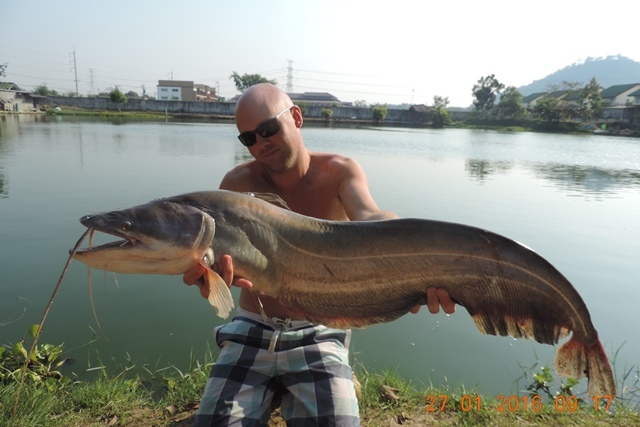 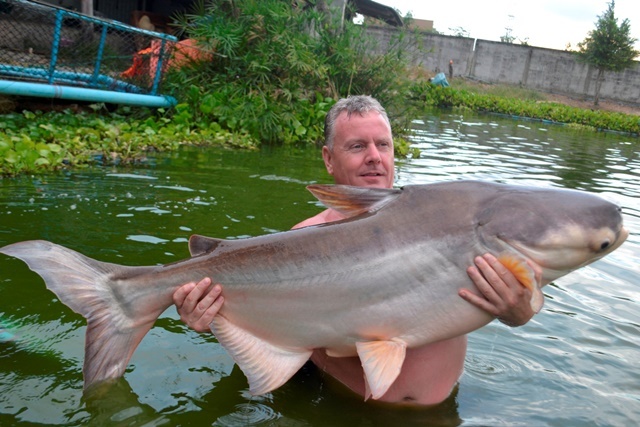 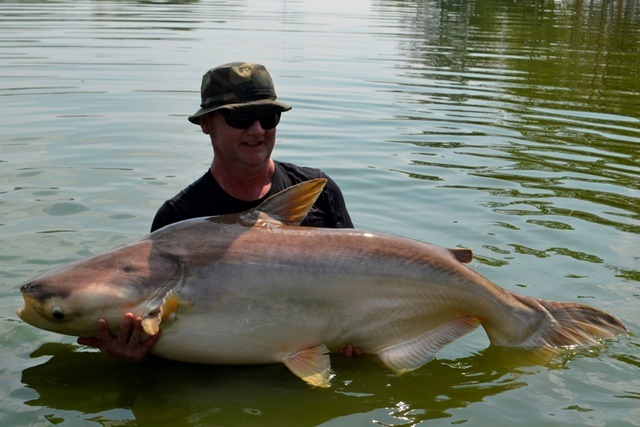 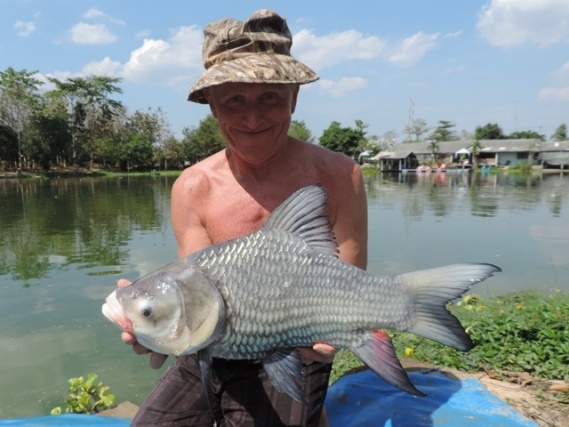 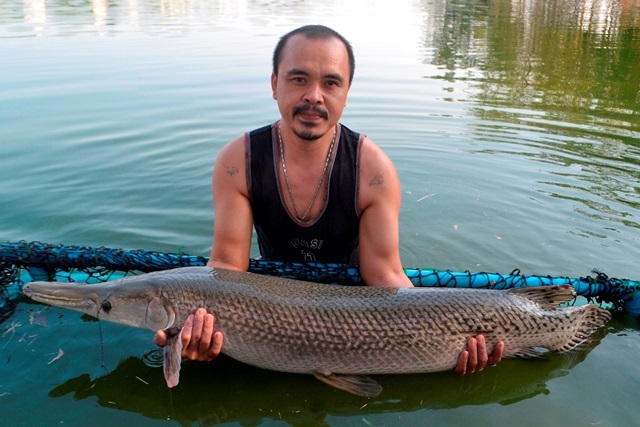 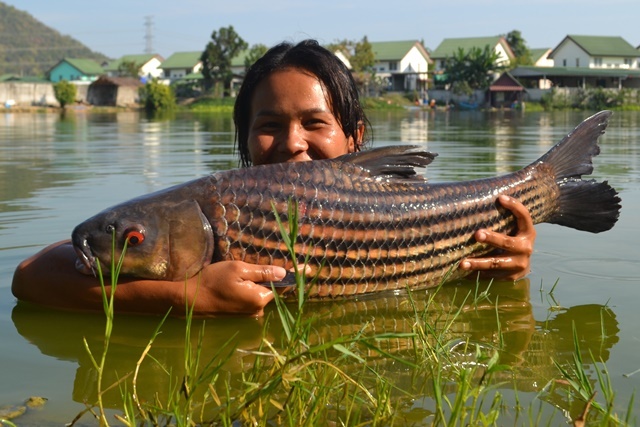 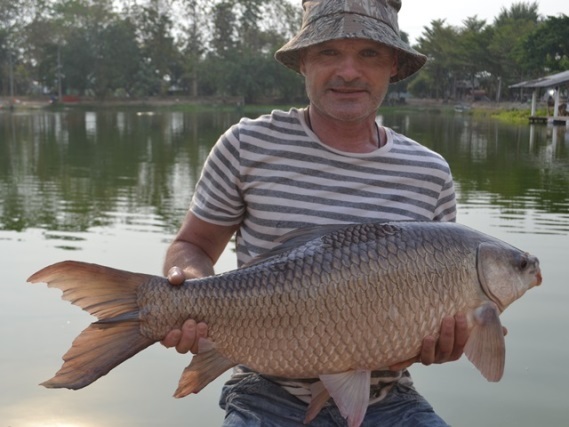 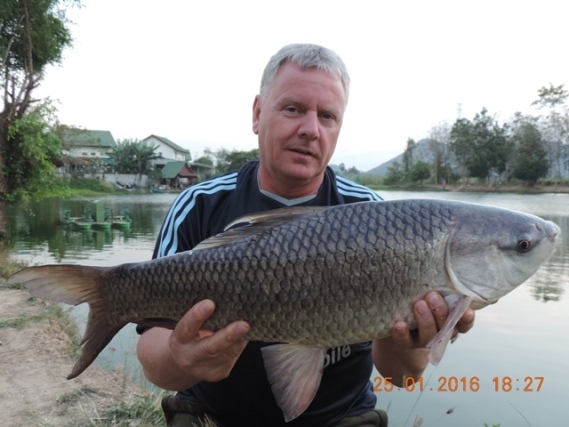 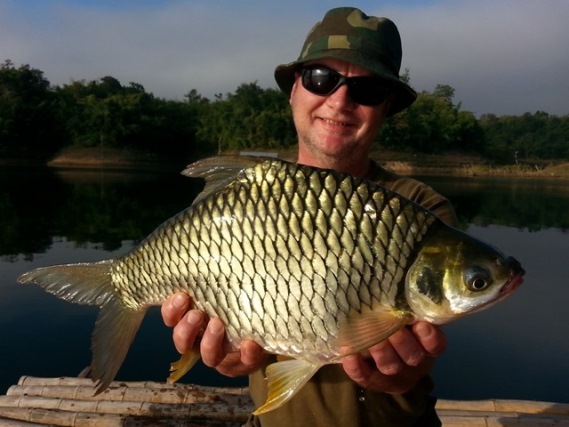 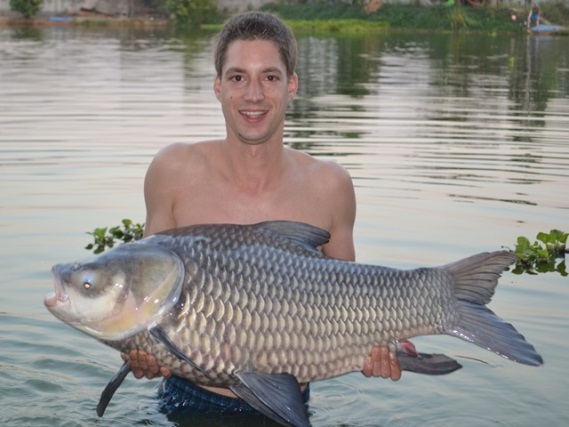 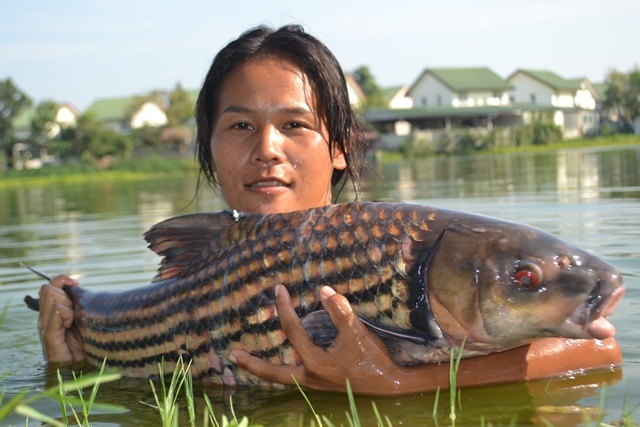 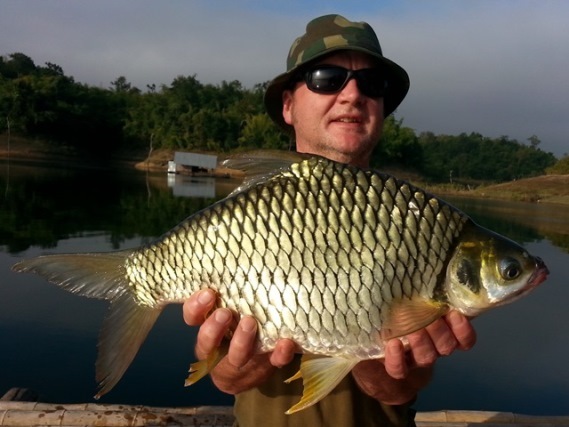 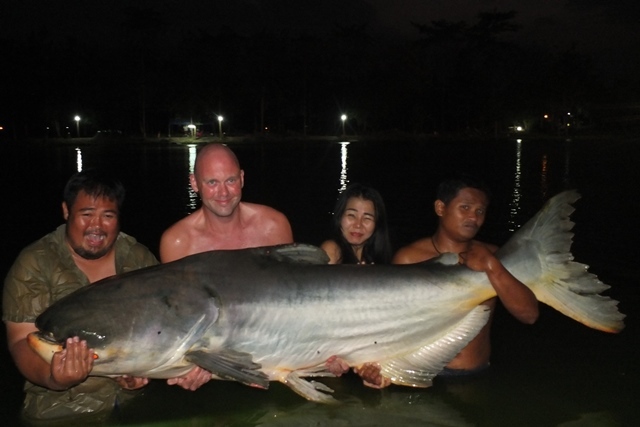 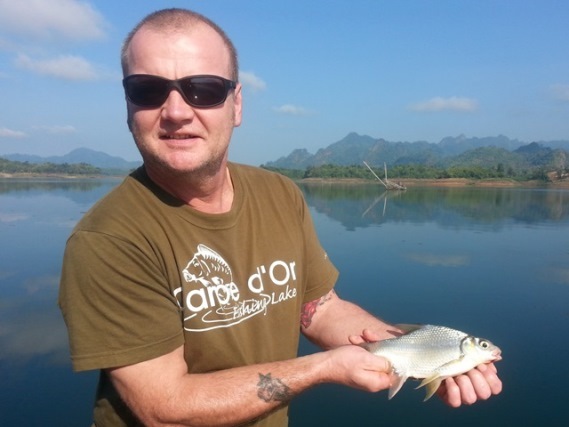 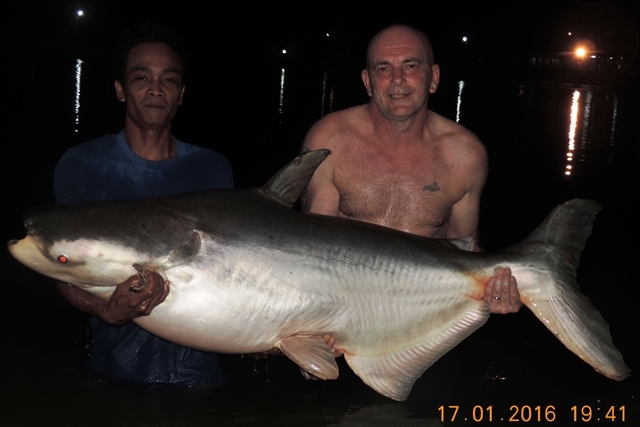 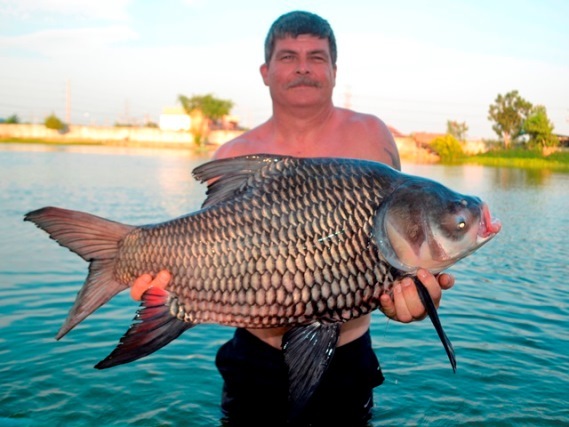 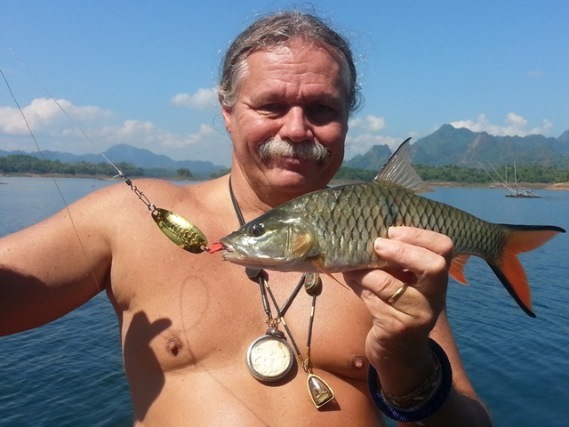 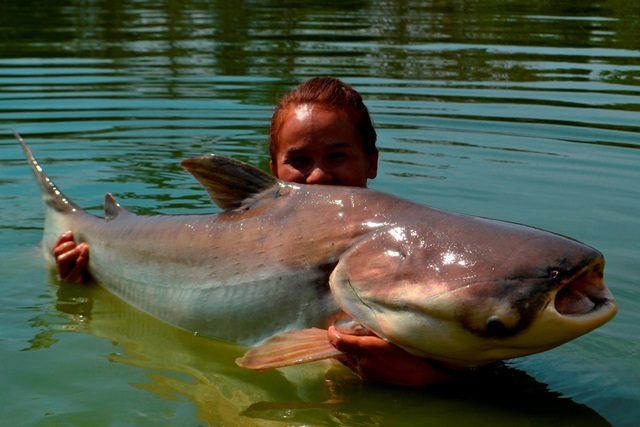 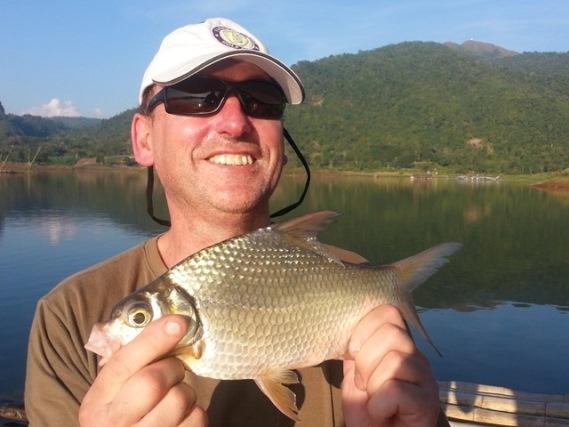 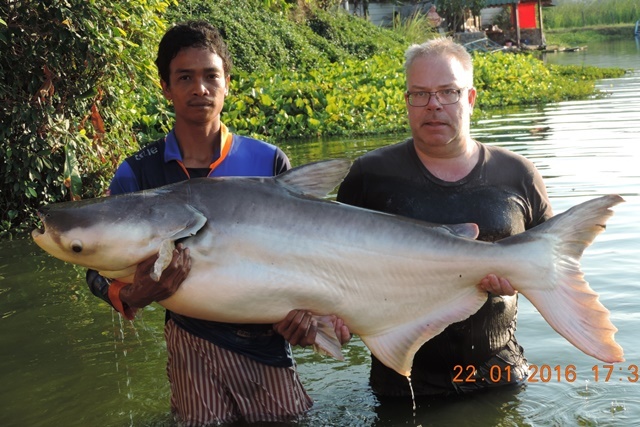 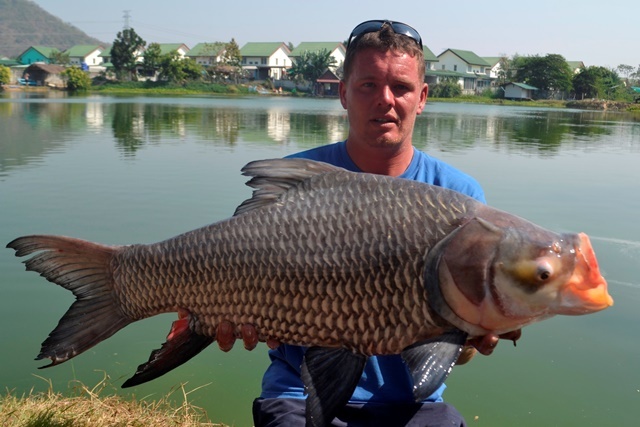 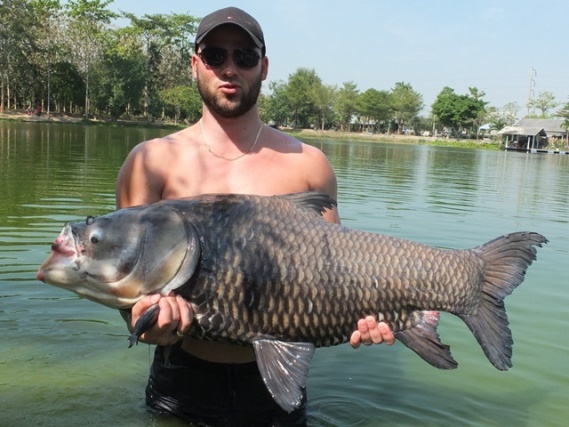 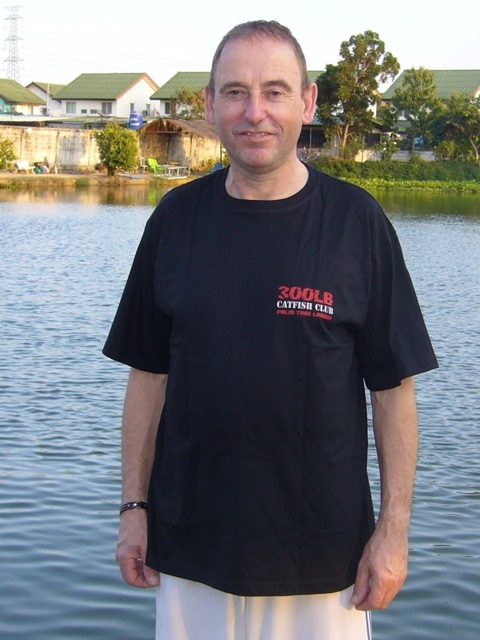 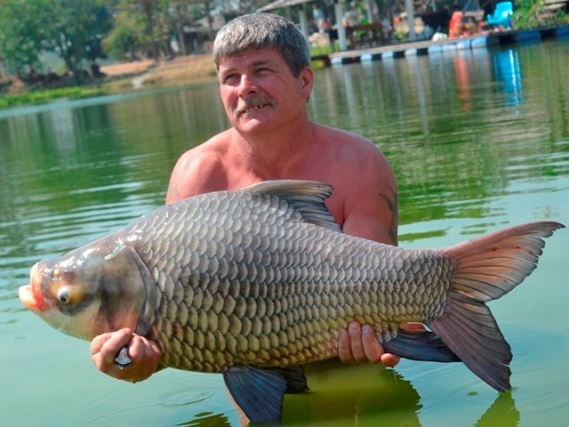 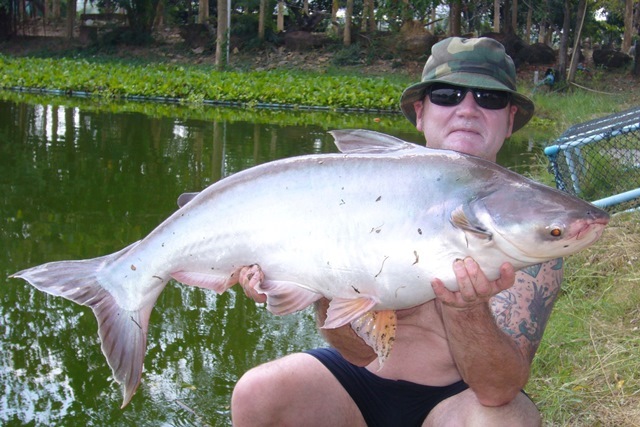 A Polish customer from Fish Siam Thailand caught a pb Siamese carp and several striped catfish. 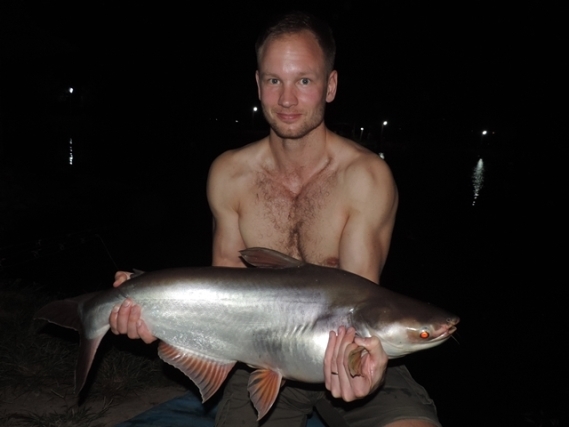 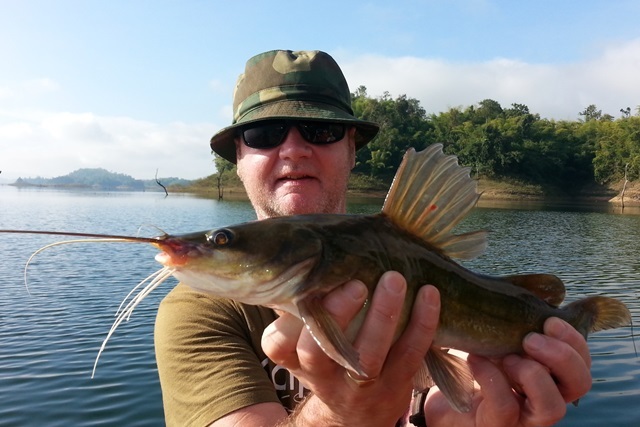 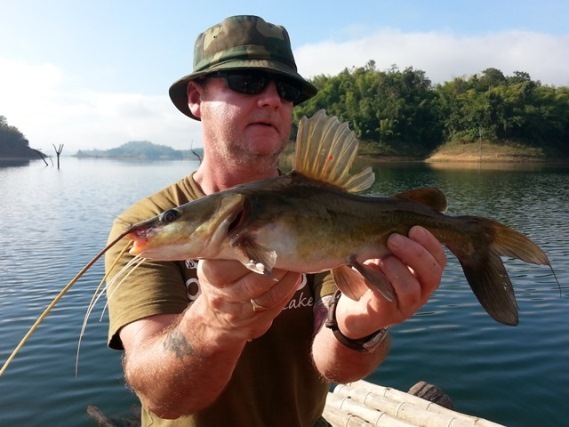 A couple of nice mekong catfish was the result of Tap of Bangkok Fishing Guide service first visit of the month. 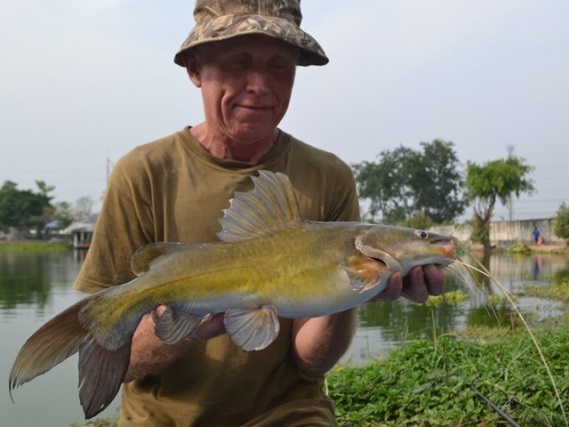 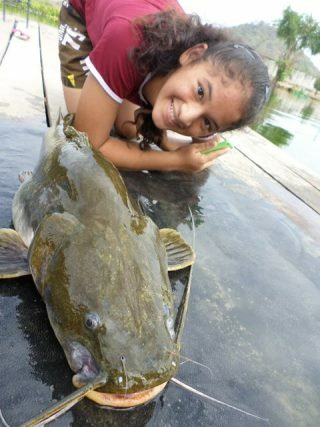 Family friend Sunni's boyfriend has a dabble and caught a nice crystal eyed catfish as well as a plump mekong catfish.